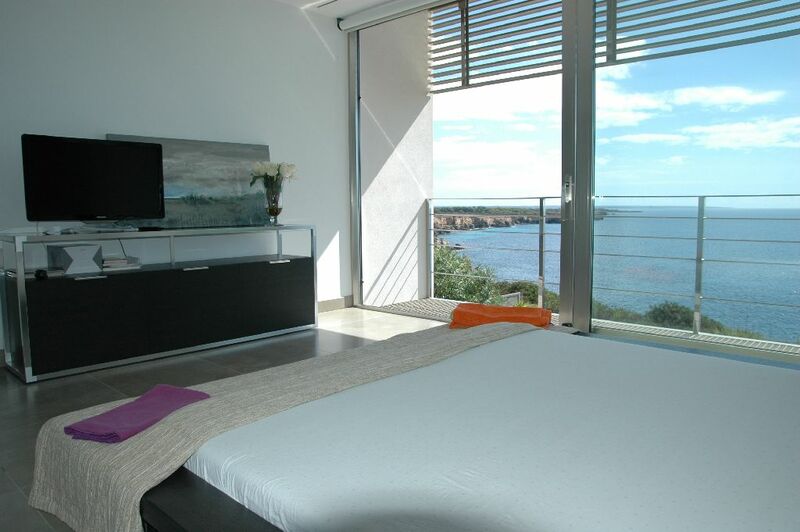 The luxurious penthouse with separate granny flat on the ground floor and a private garden with pool is part of a quiet residential complex in Porto Colom, overlooking the harbor and the open sea. 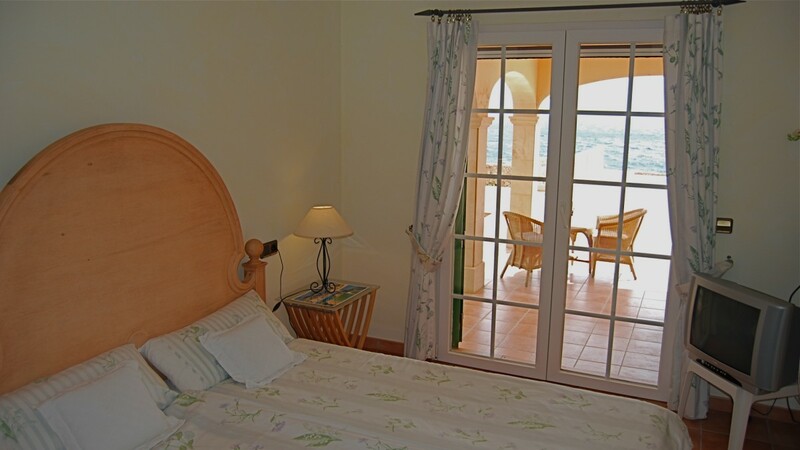 It is a two minute stroll to the beautiful sandy beach and a two minute drive to the lively harbor promenade with numerous nice restaurants, bars and cafés. 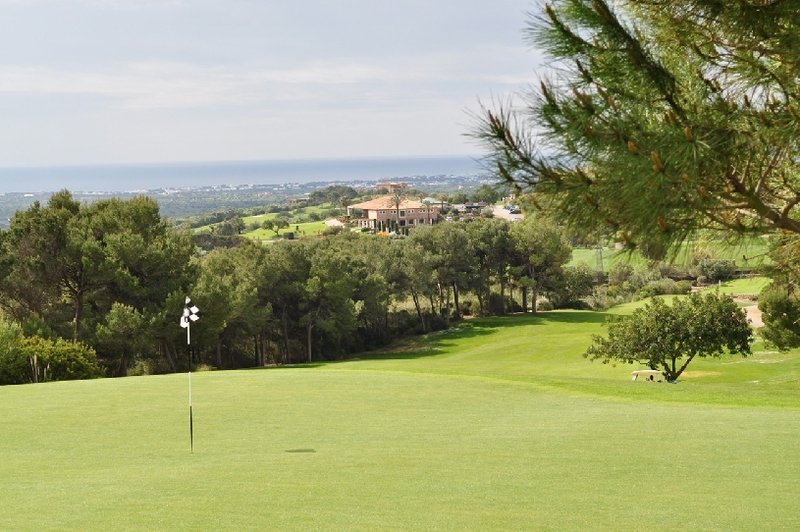 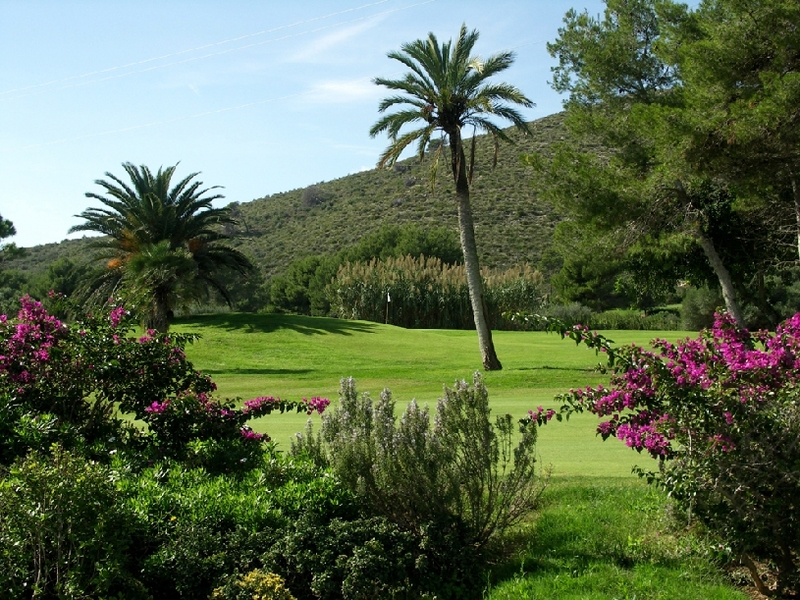 The nearest golf course, the golf club of Vall d´Or, is 5 car minutes away and famous for its marvelous panoramic views across the harbor and the ocean. 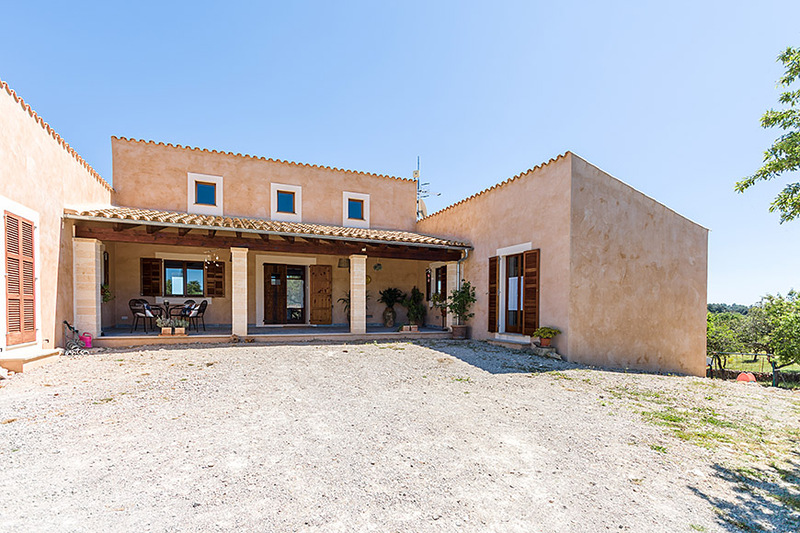 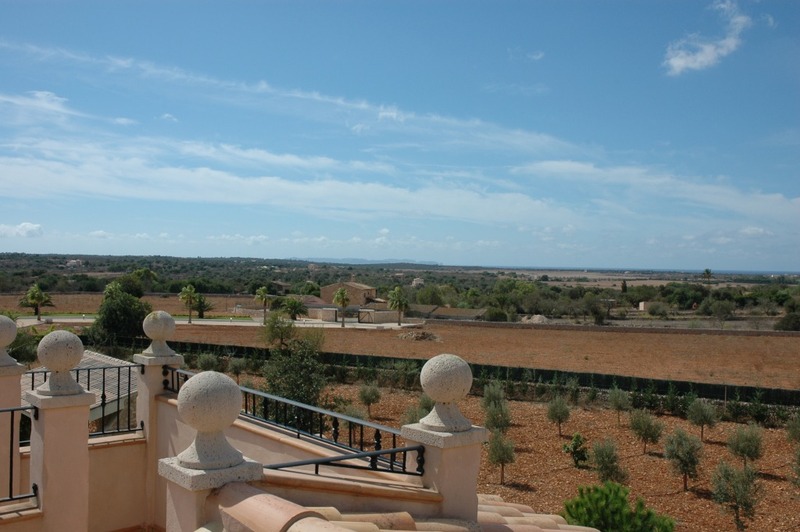 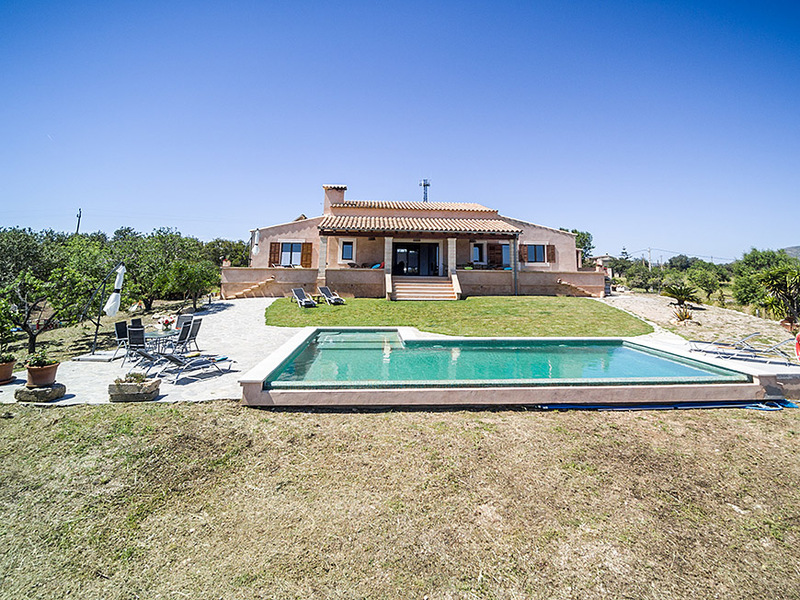 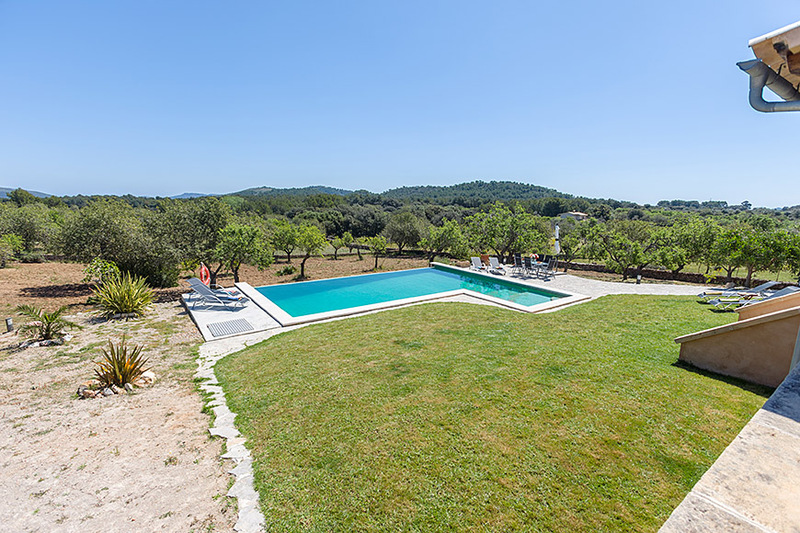 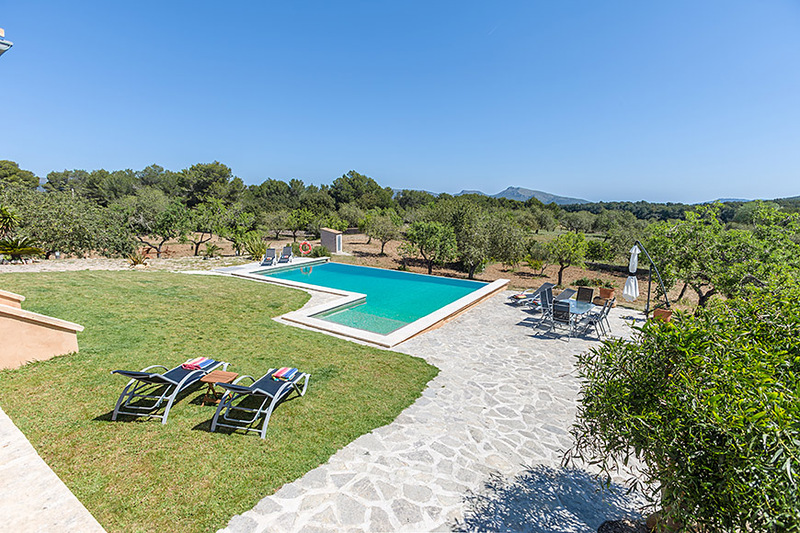 The Finca Campasolo is a high quality new built finca, situated in the country yard at only a few minutes from the villige Ses Salines nearby the Es Trenc Beach. 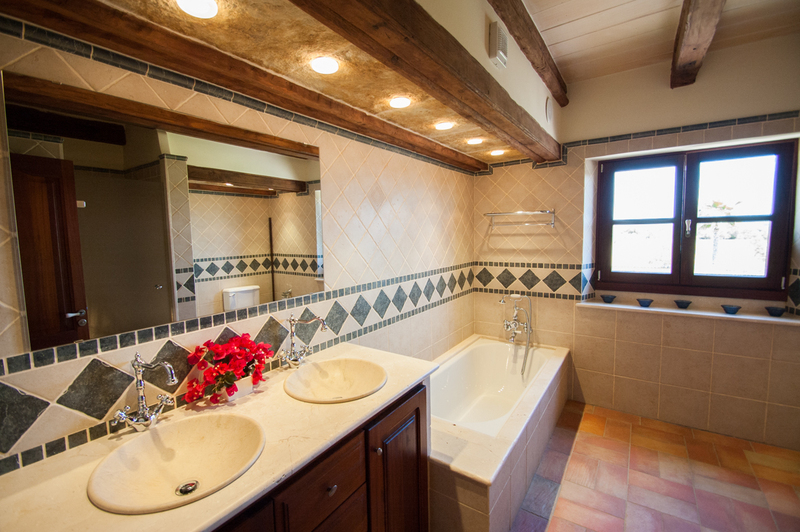 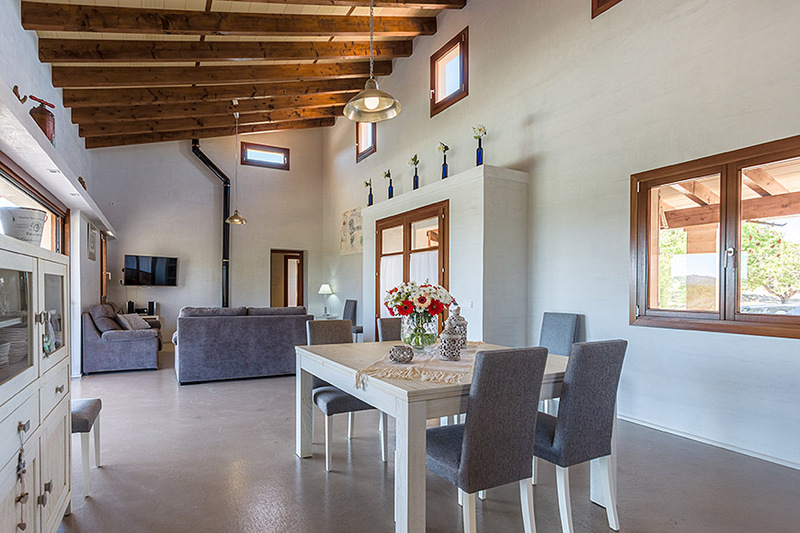 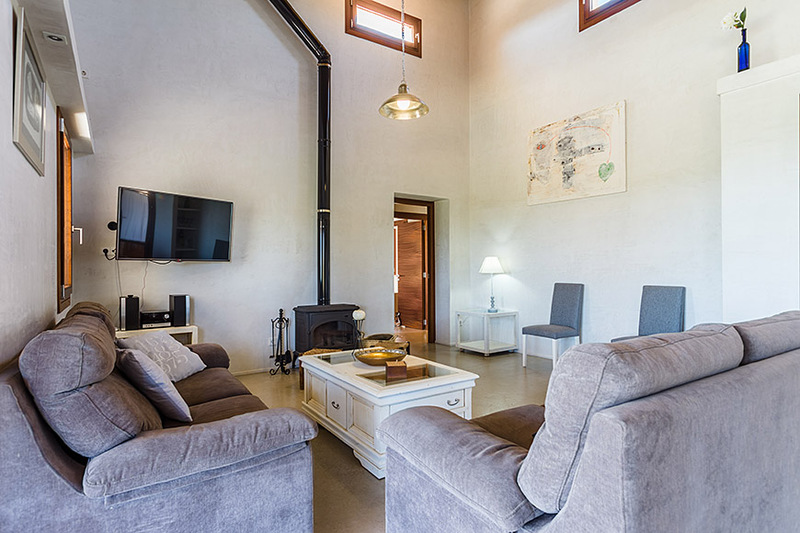 The main house offers a living area with fire place, kitchen, laundry and a main bedroom with shower room en suite. 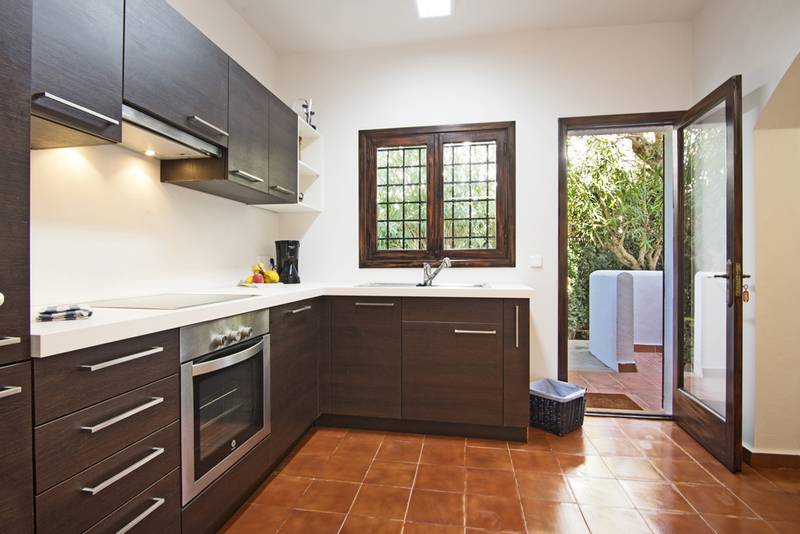 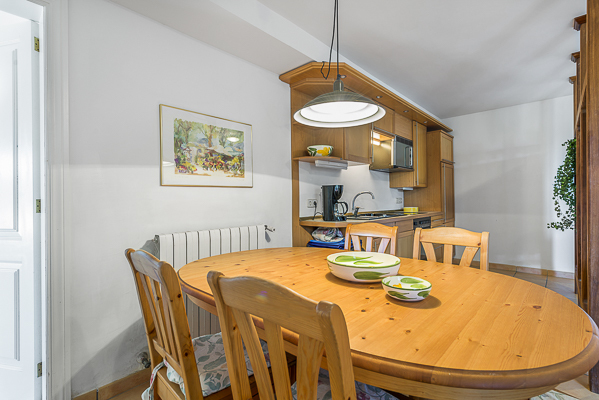 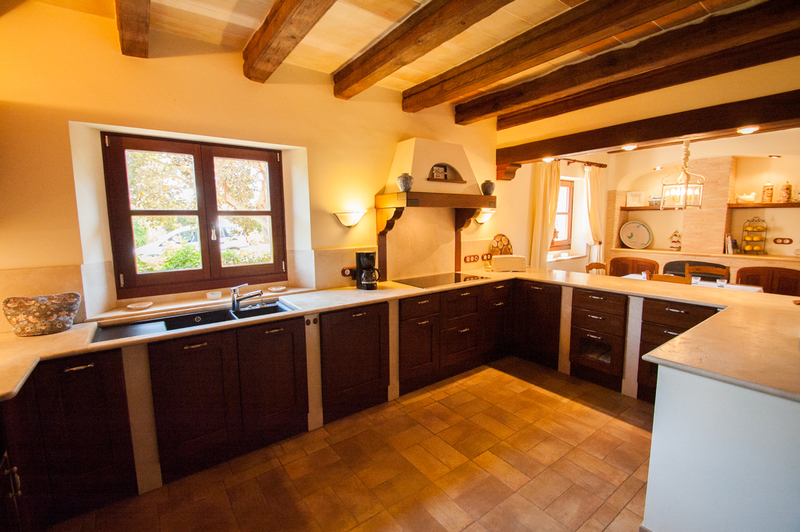 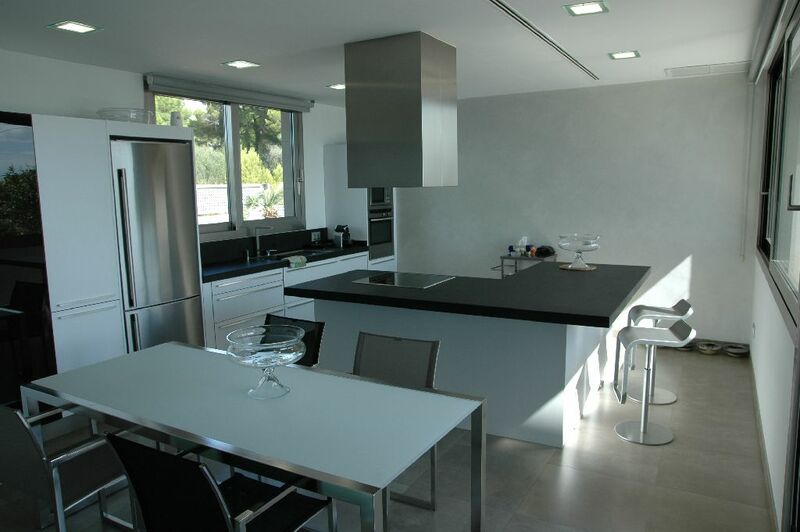 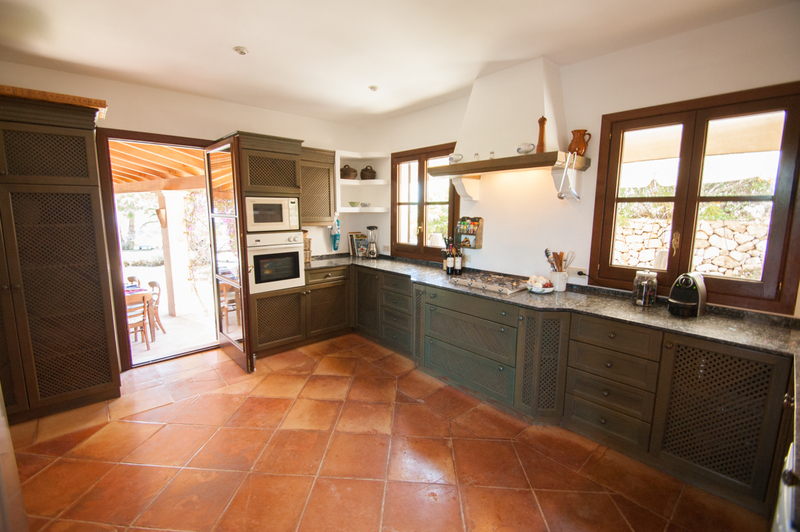 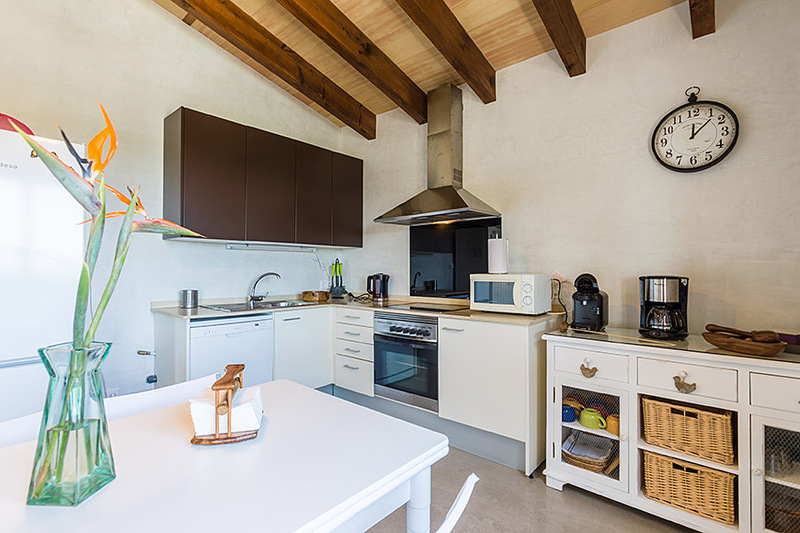 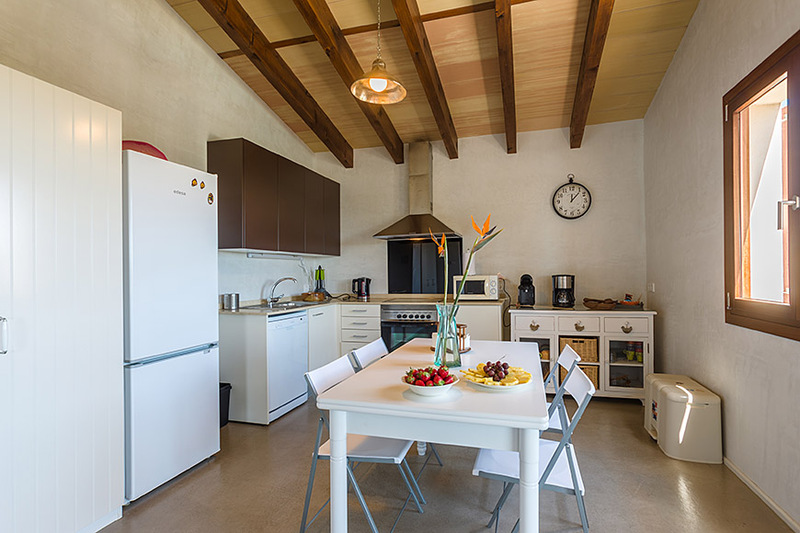 The large kitchen is fully equipped with a gas- and ceramic hob, a Tepan Yaki, steam cooker, oven and microwave. 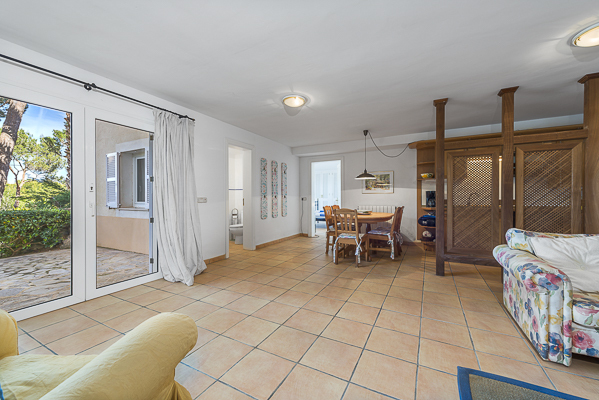 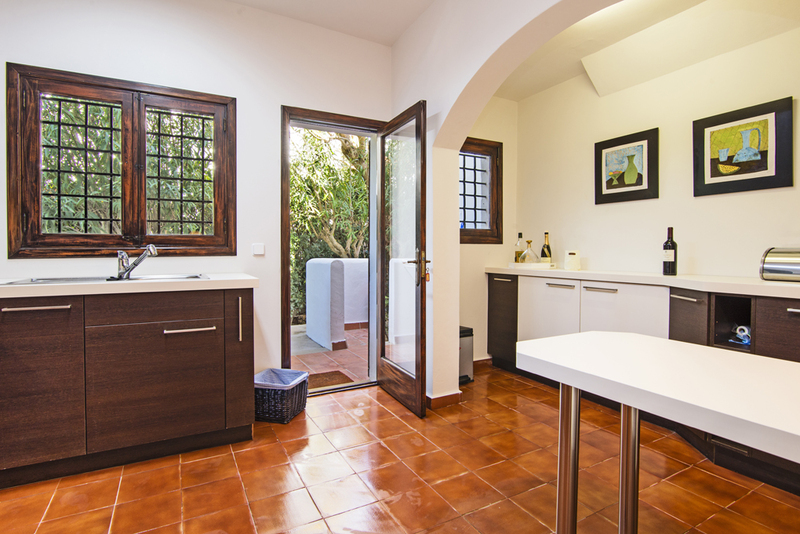 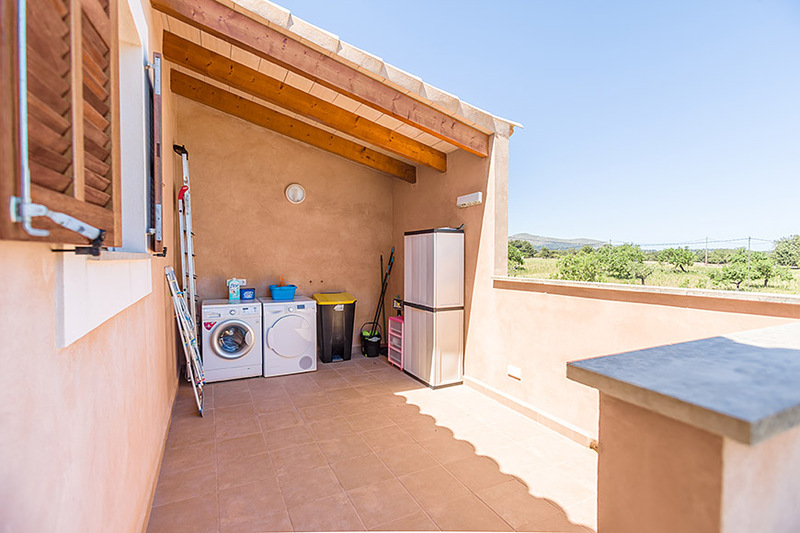 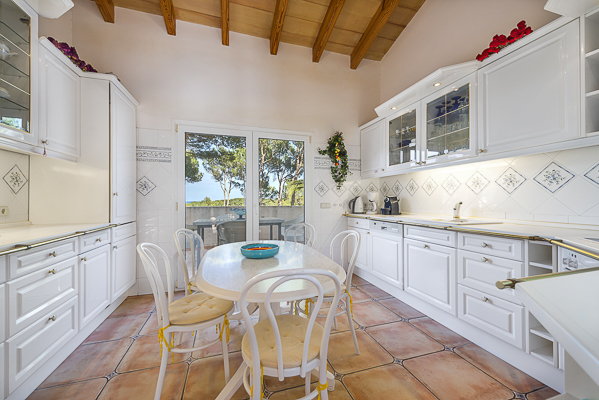 As well the kitchen as the living area gives access to nice decorated covered terrace. 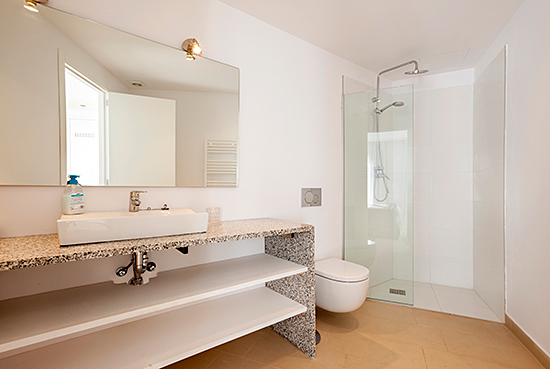 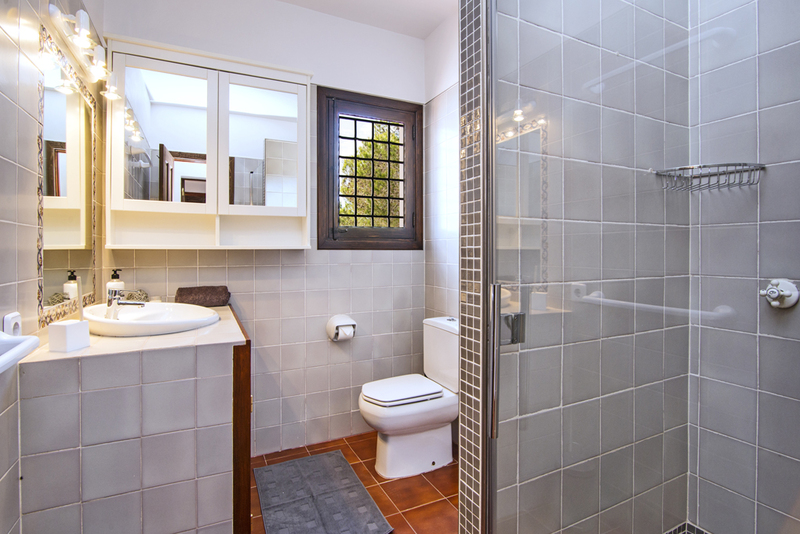 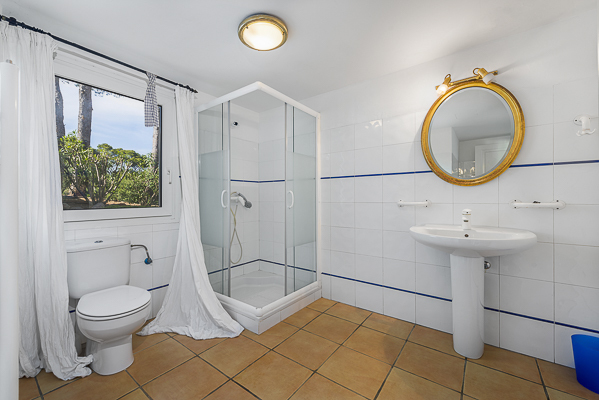 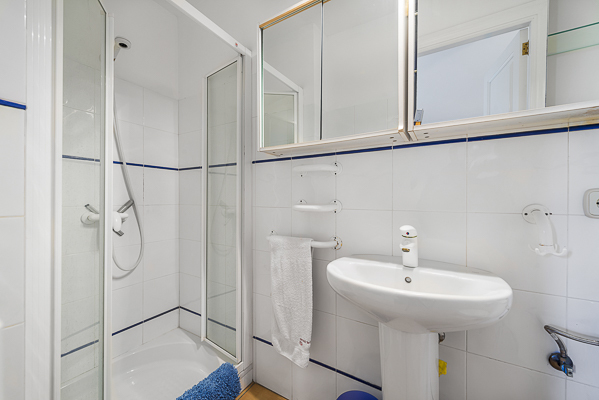 The other 2 bedrooms with shower room en suite are situated in the annex which is bordering directly at the main house. 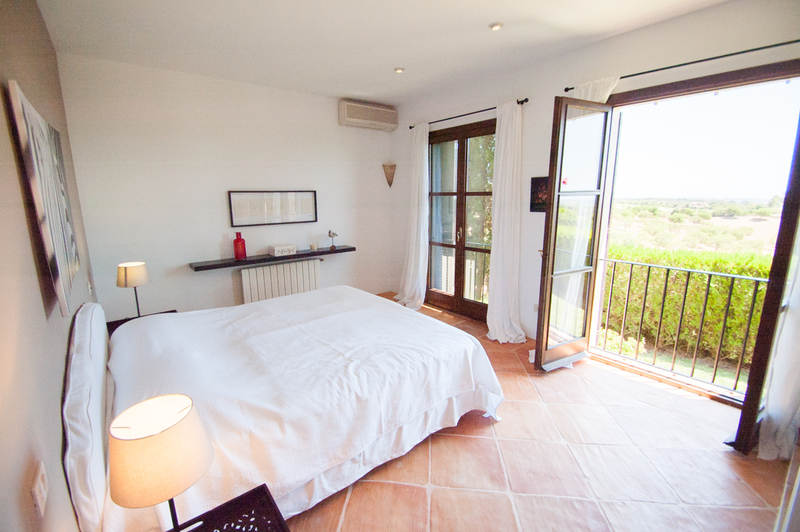 Both rooms have their own entrance and terrace. 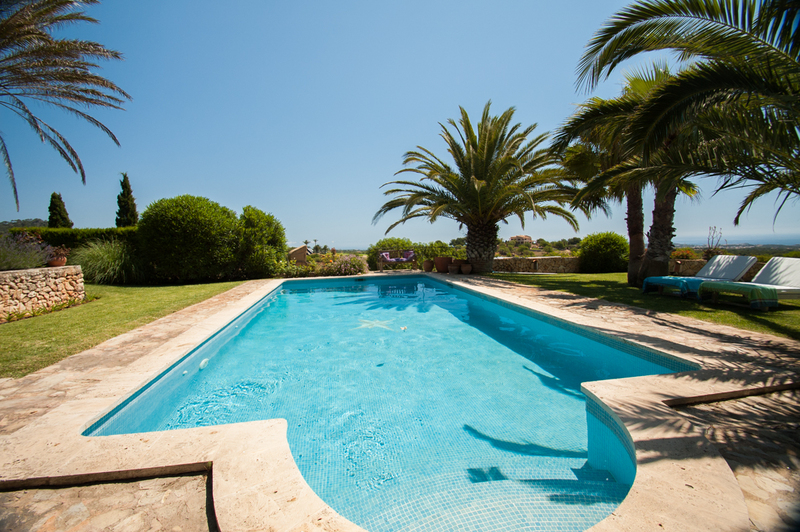 The pool is located at a few meters from the finca. 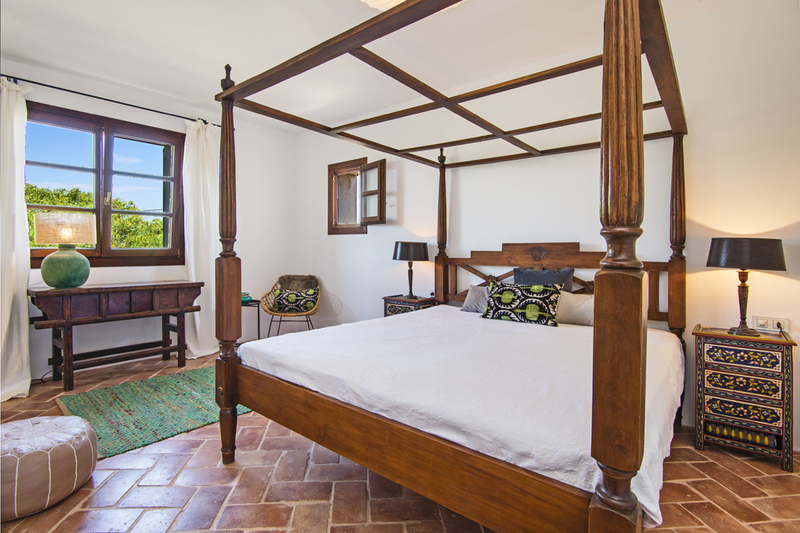 This extensively refurbished village house looks back on a nearly 400-year old history. 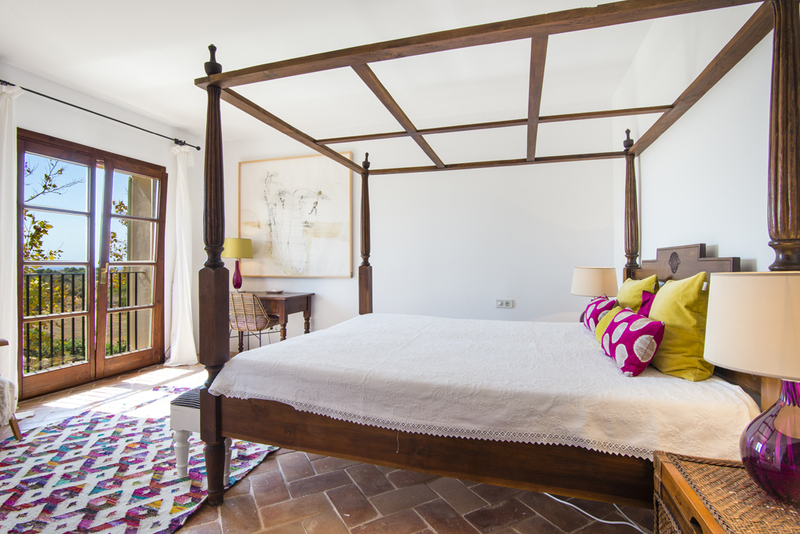 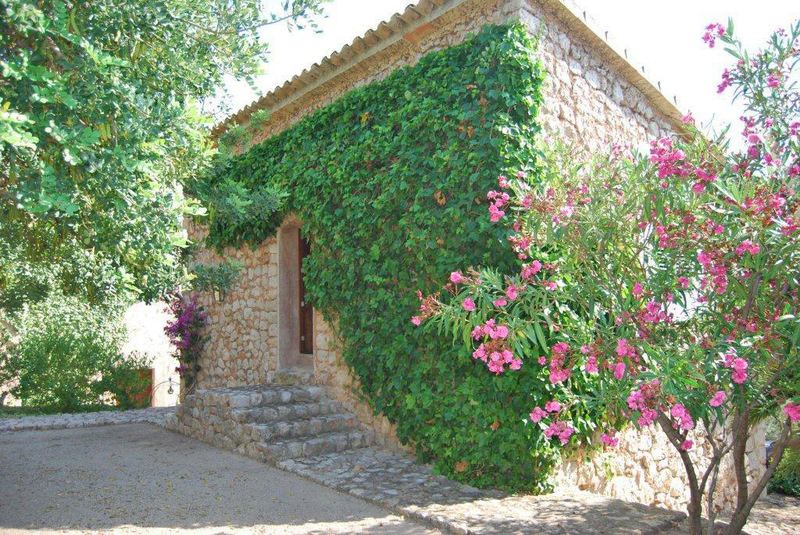 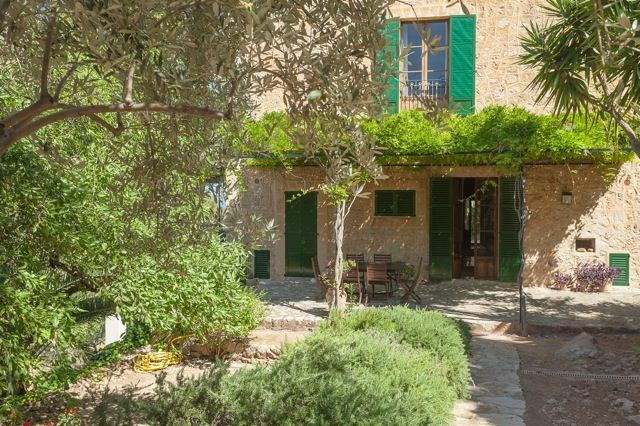 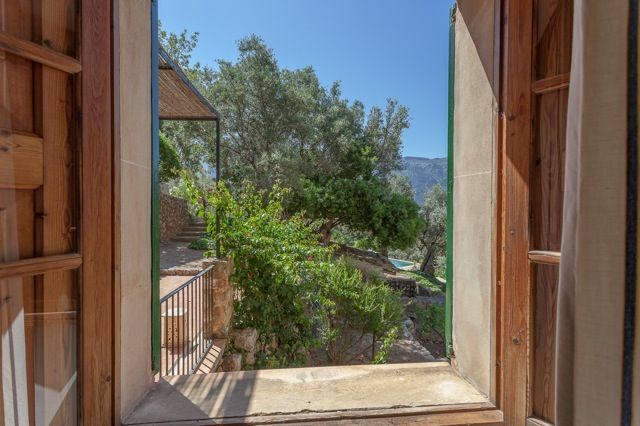 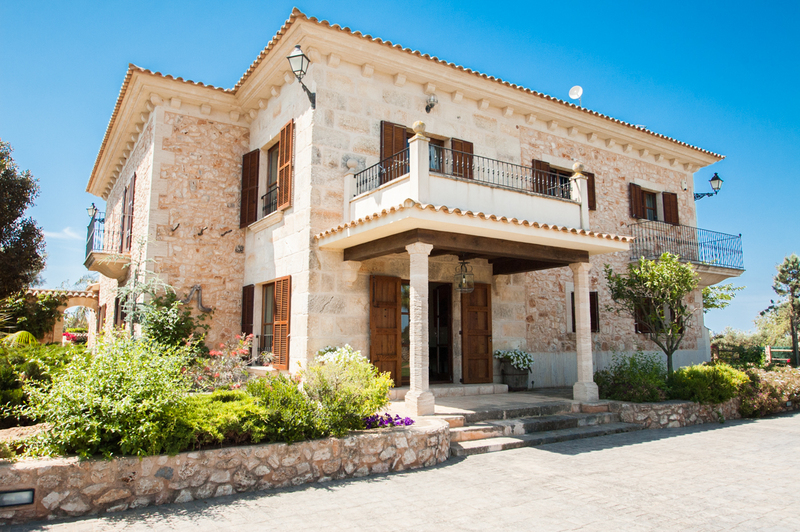 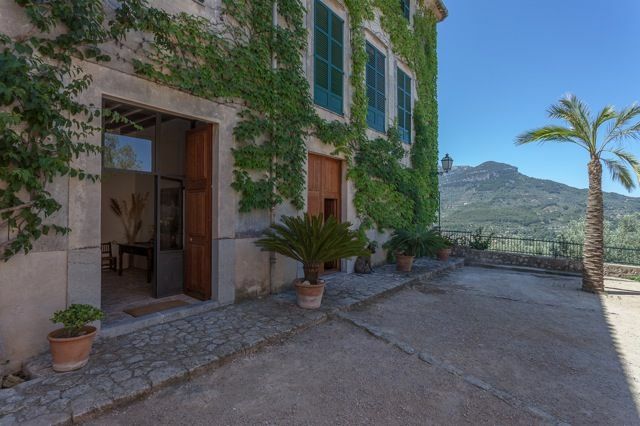 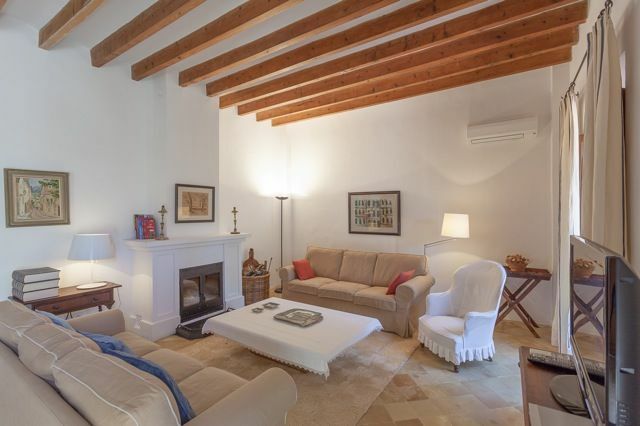 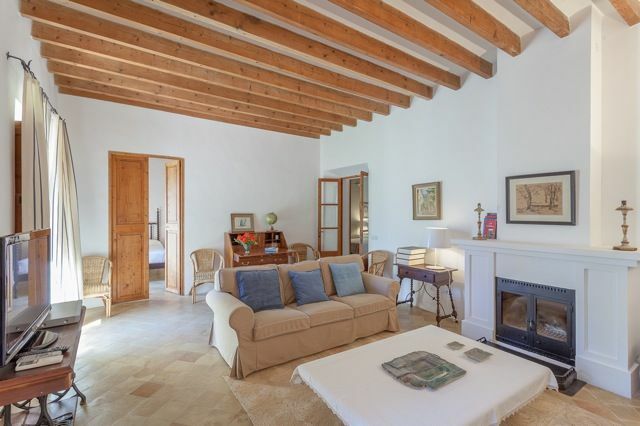 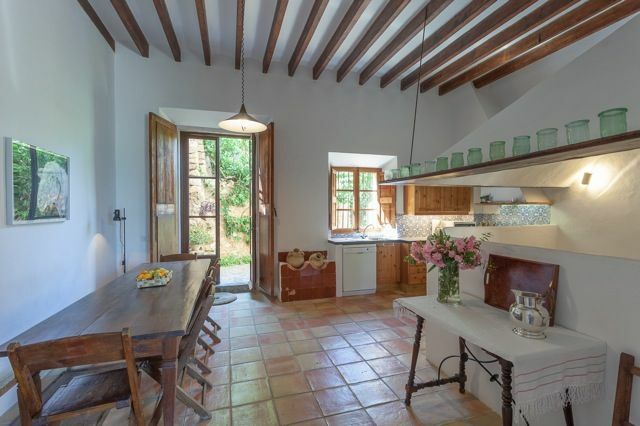 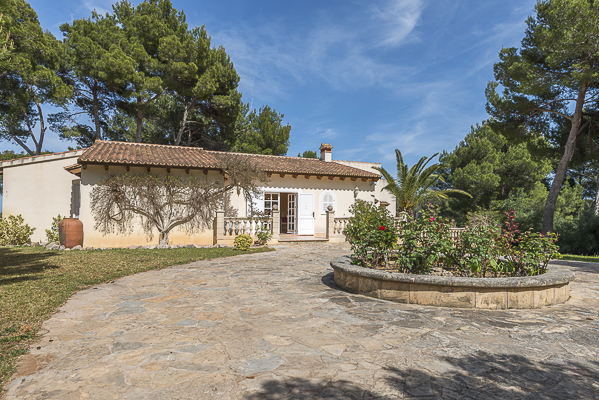 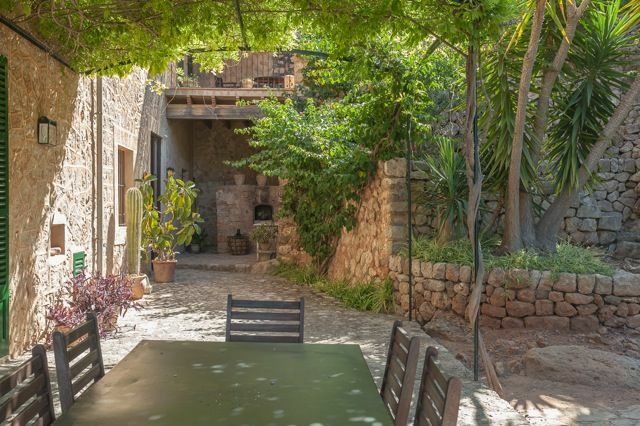 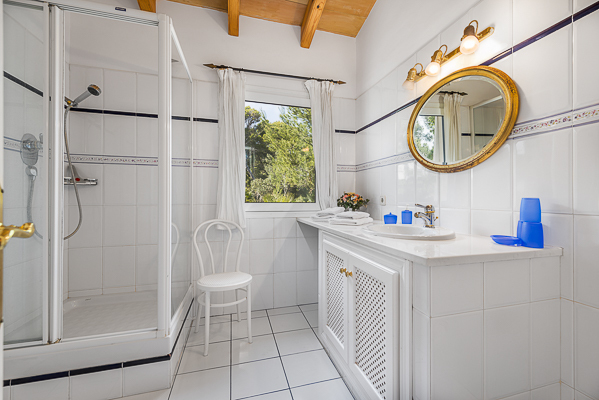 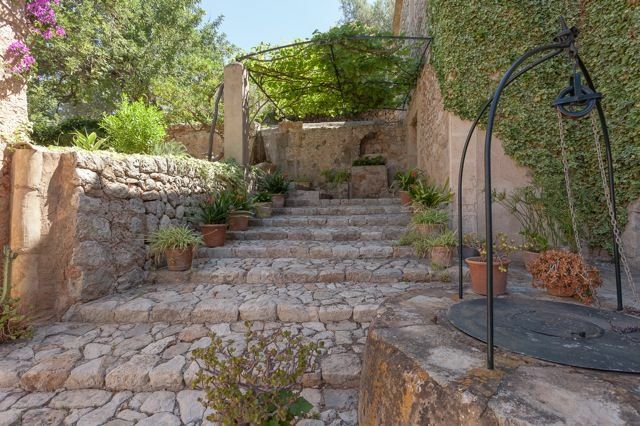 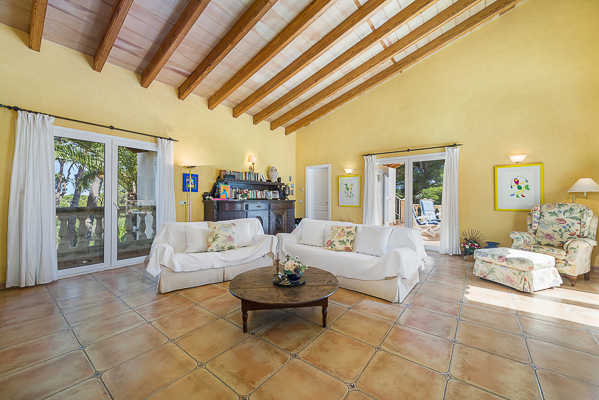 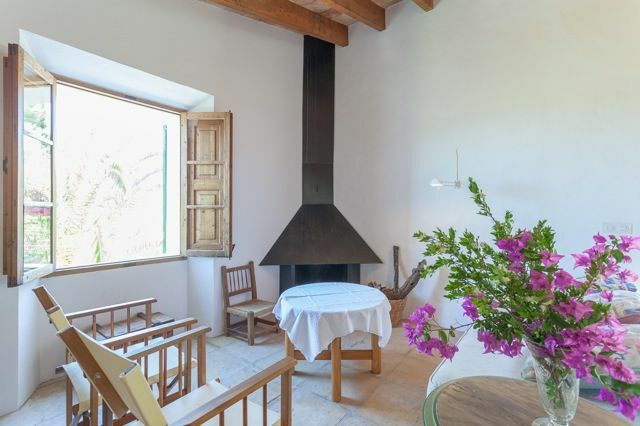 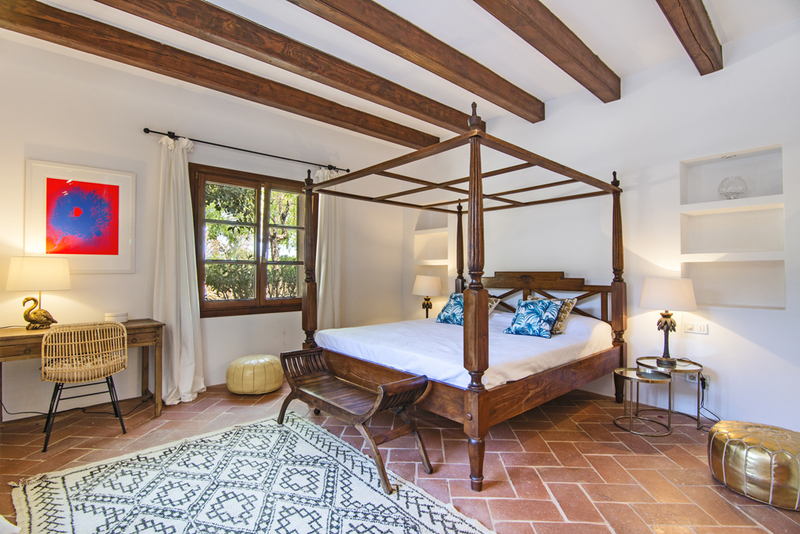 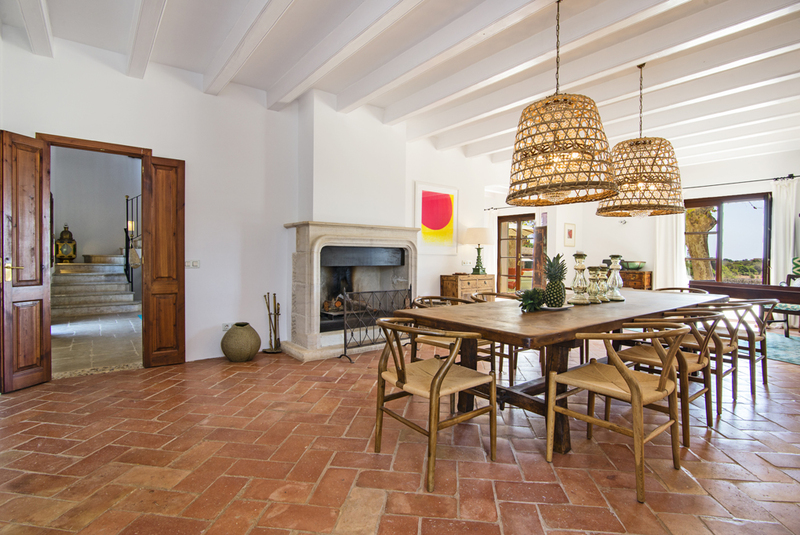 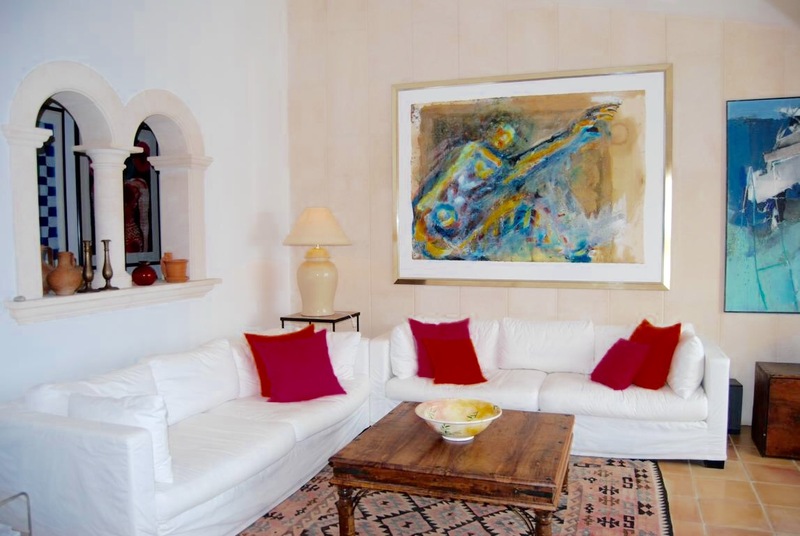 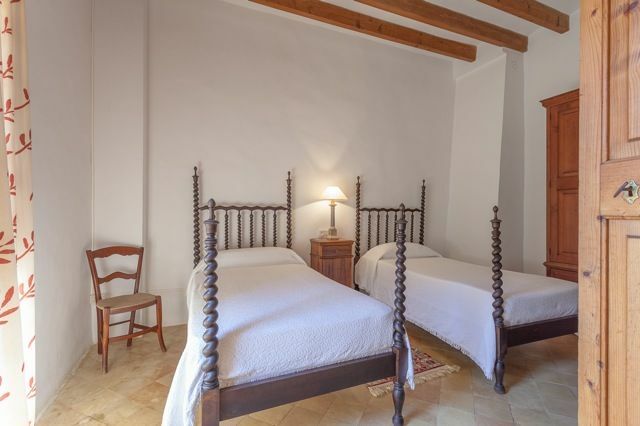 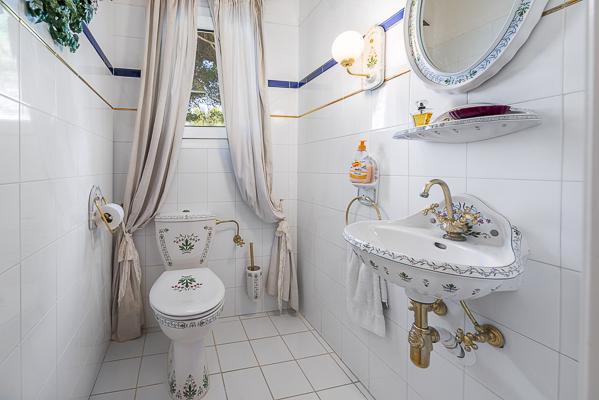 The property once belonged to a famous Majorcan poet, who once had the honor of being visited by King Juan Carlos in this house. 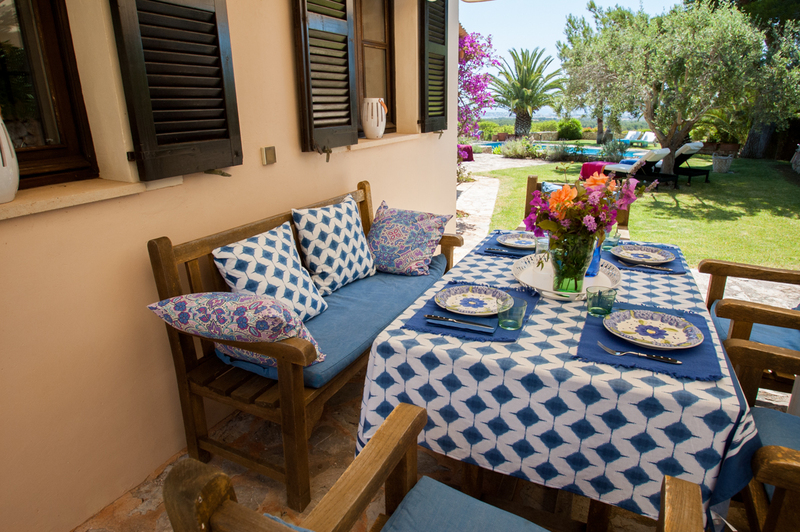 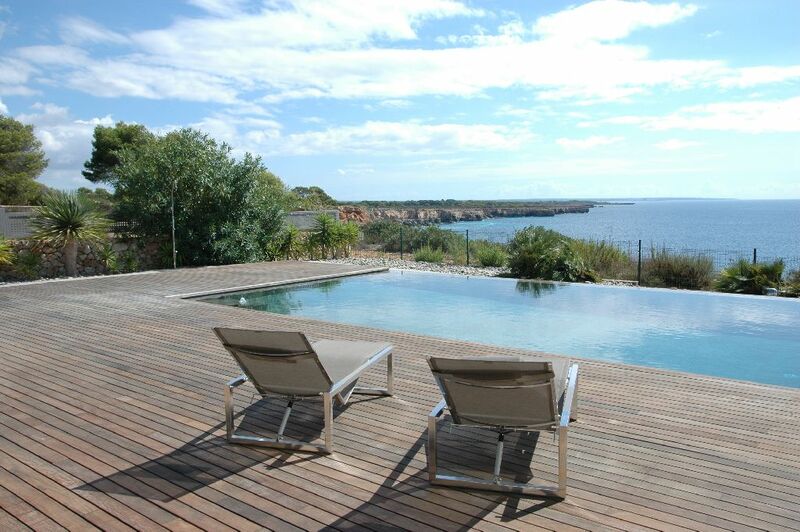 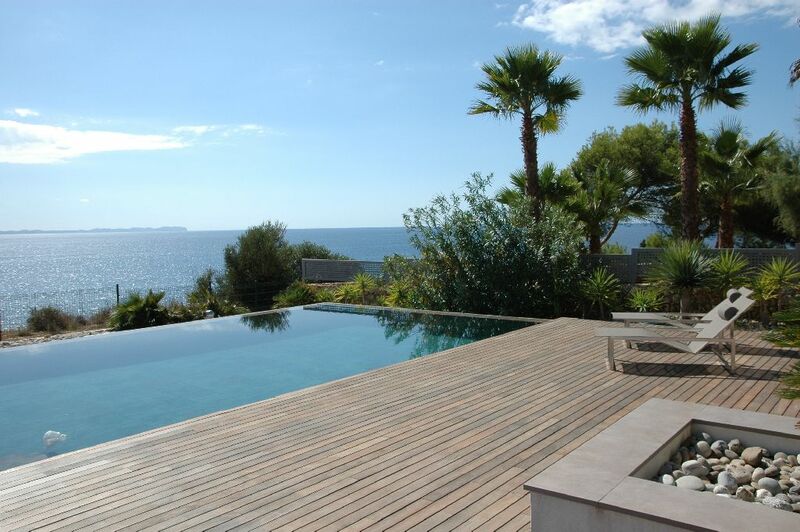 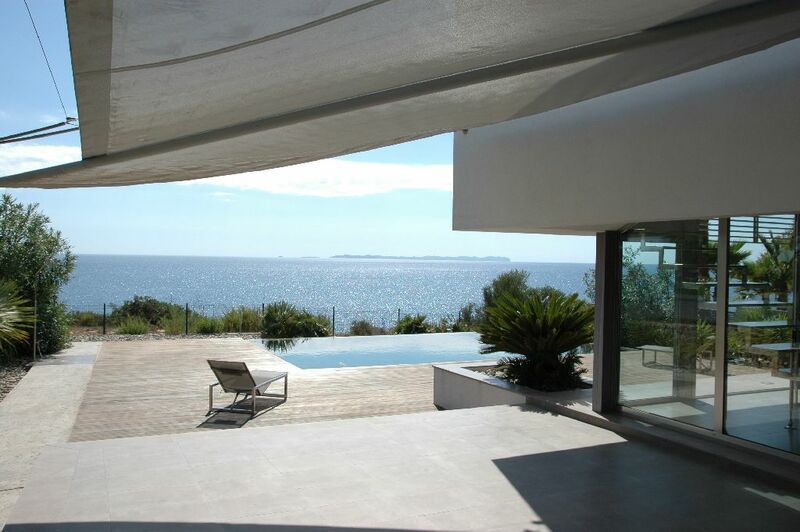 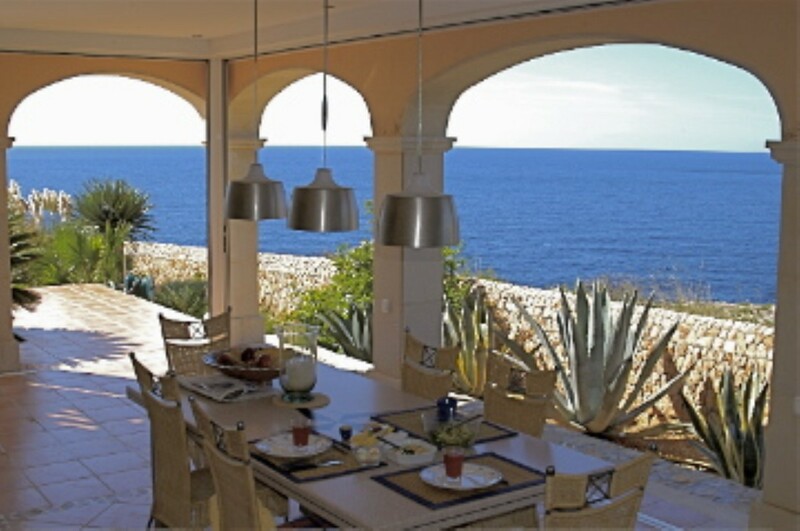 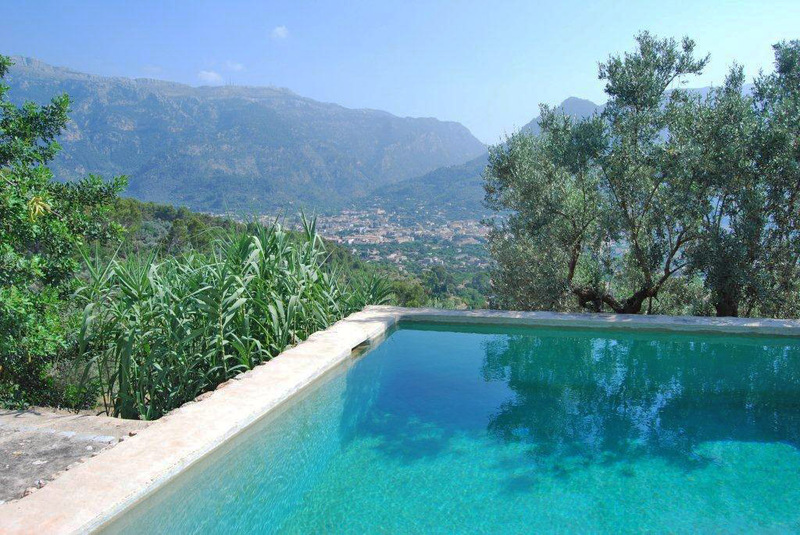 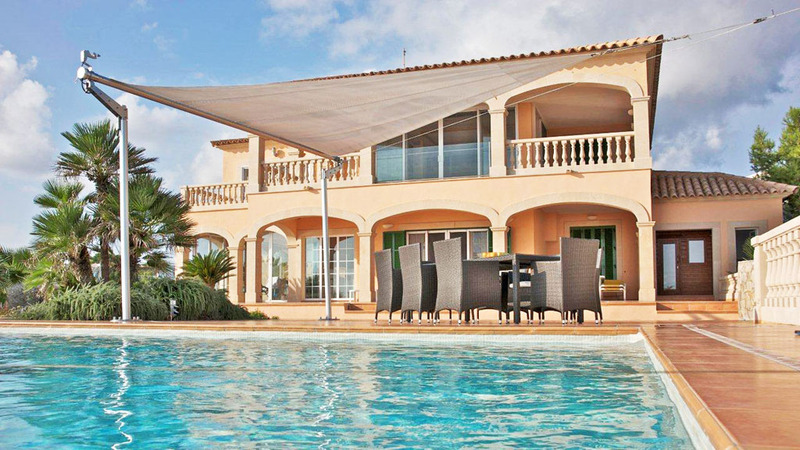 This charming holiday home boasts marvellous panoramic views of the deep blue Mediterranean Sea. 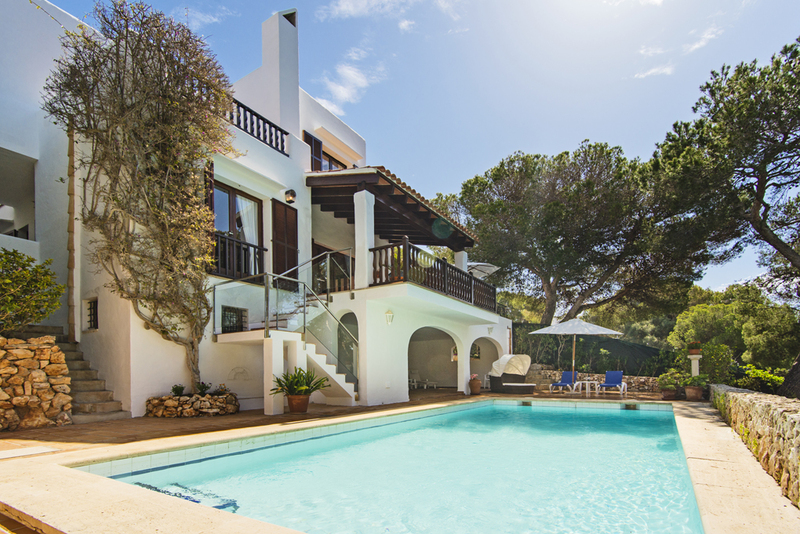 The roof terrace, the master bedroom balcony and the extensive pool terrace with summer kitchen are all facing the ocean and provide for comfortable seating and al fresco dining areas to indulge in a perfect holiday. 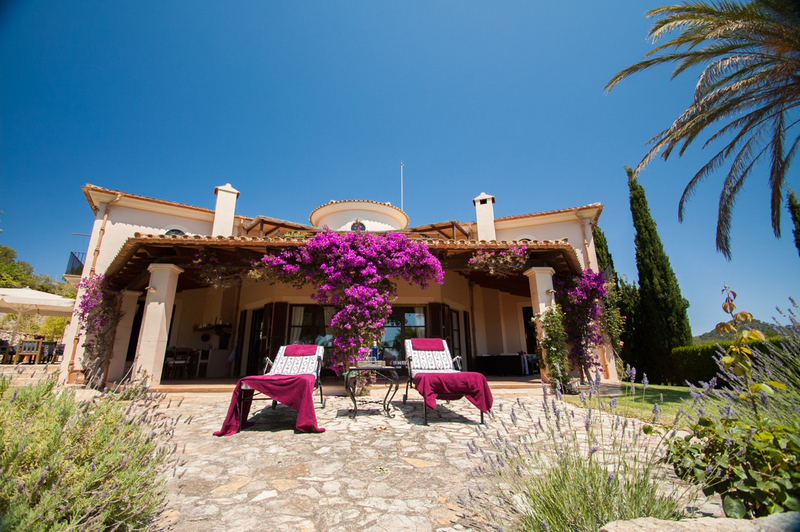 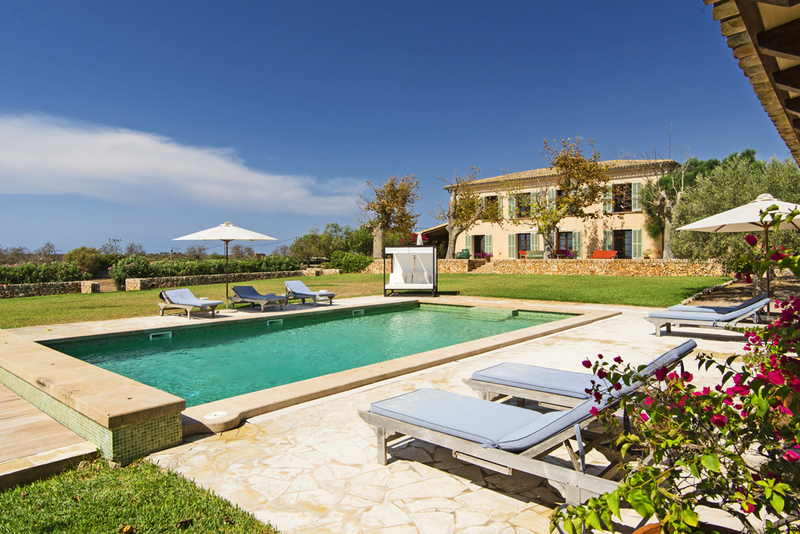 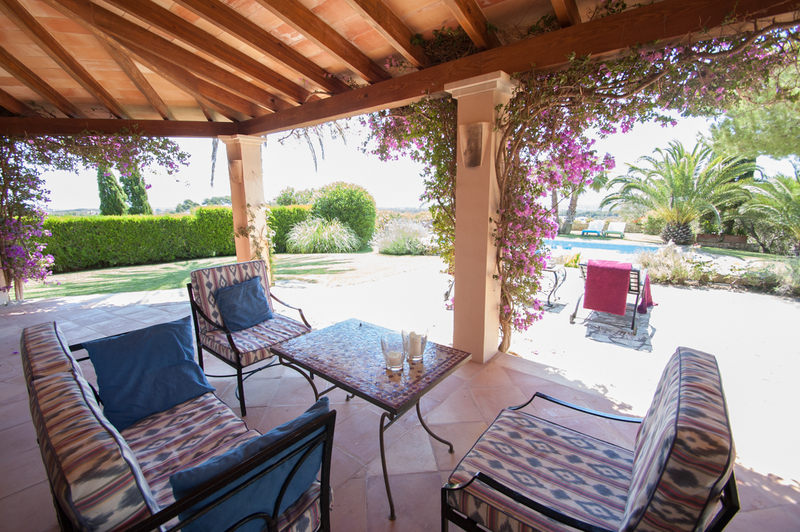 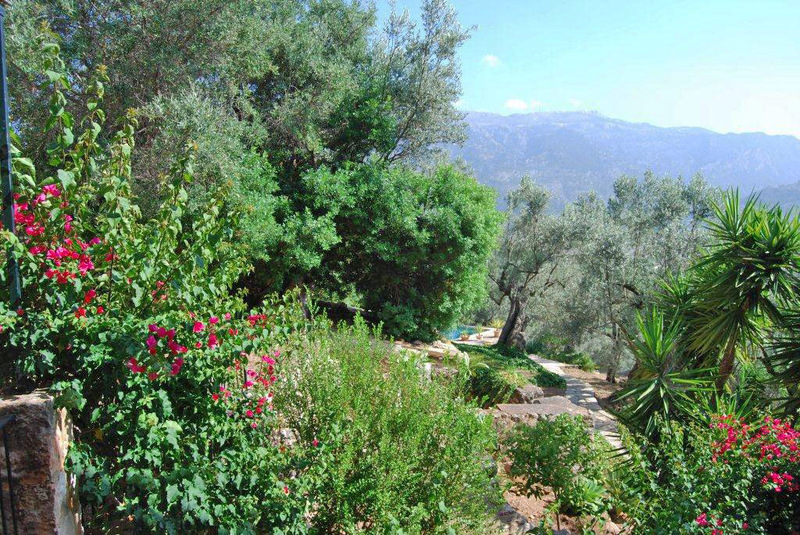 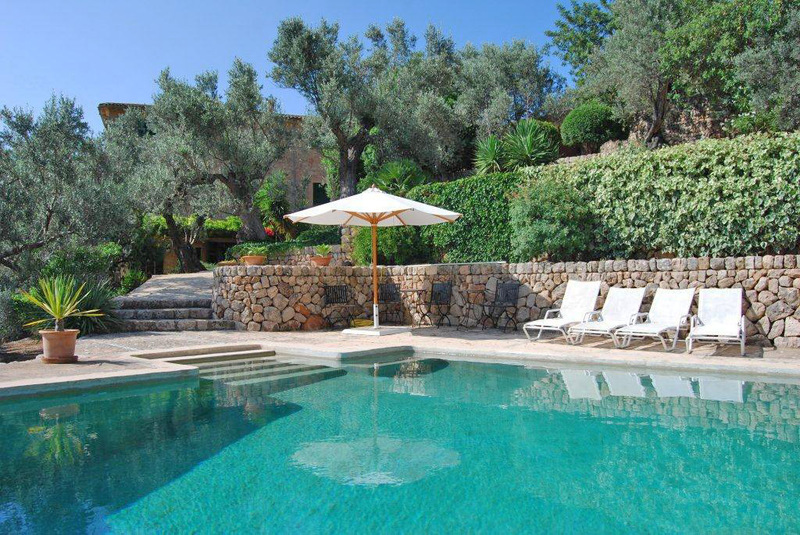 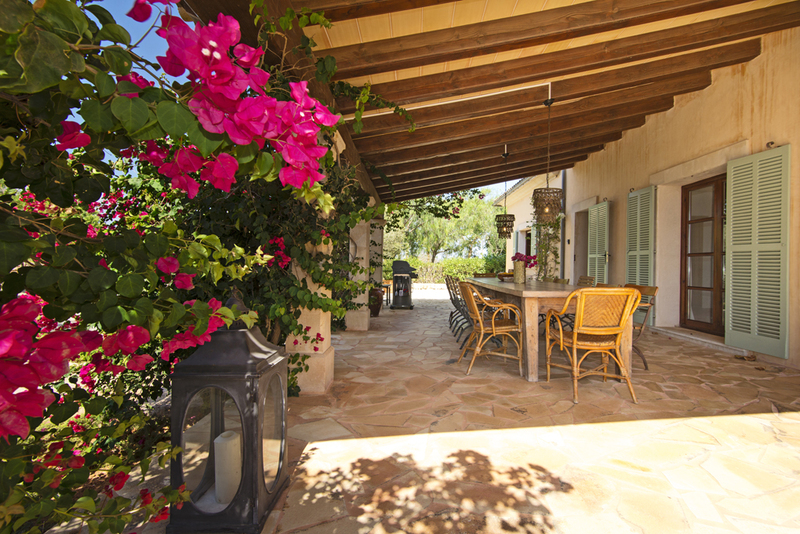 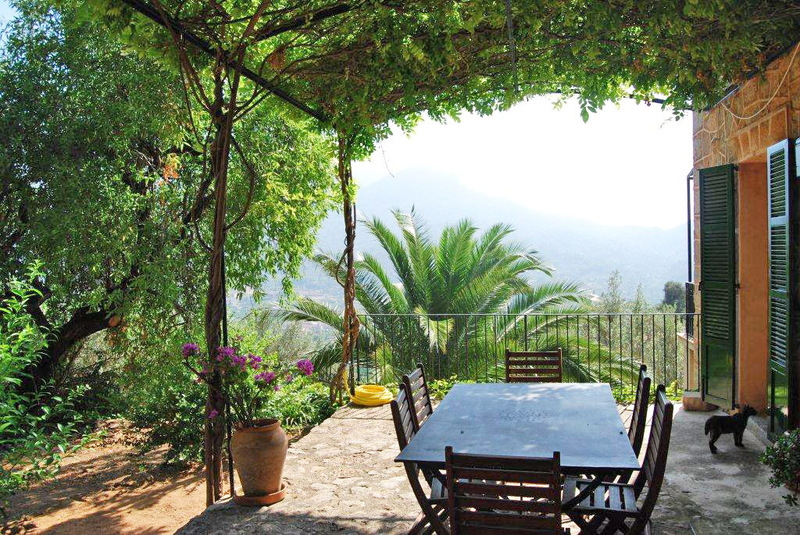 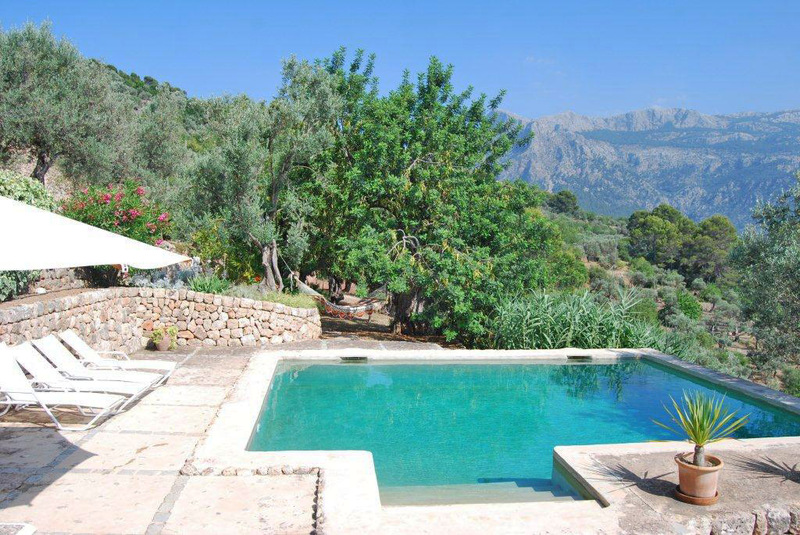 The Villa is surrounded by a well-tended Mediterranean garden. 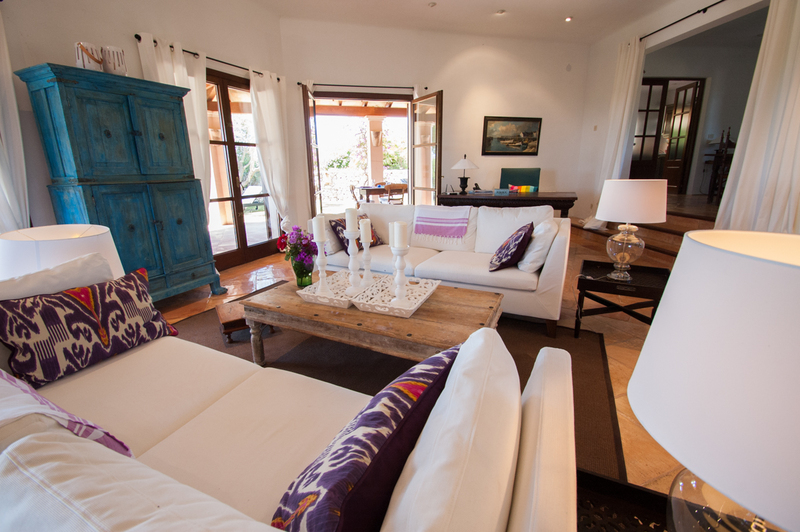 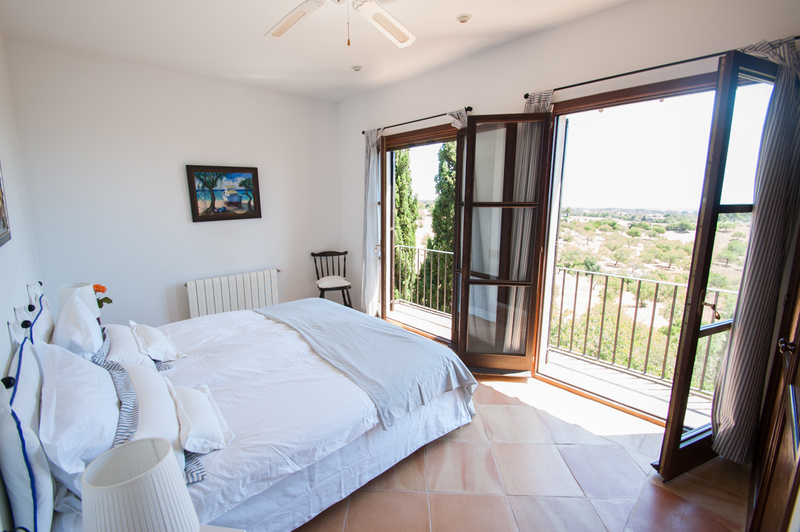 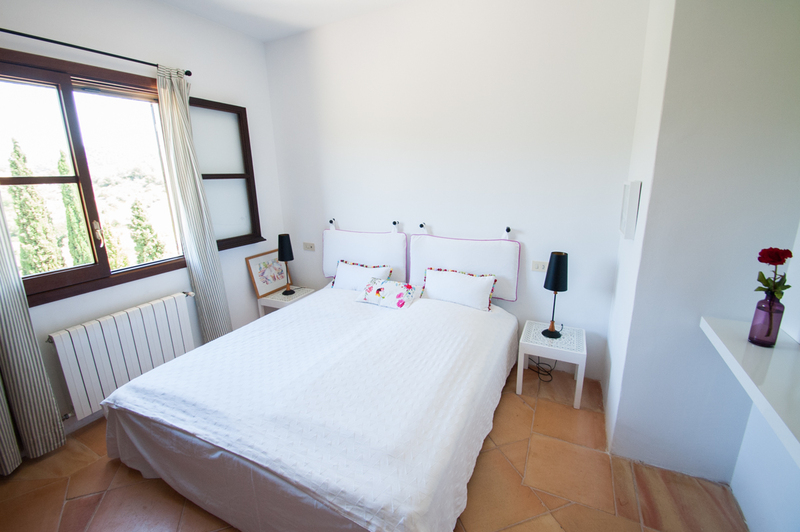 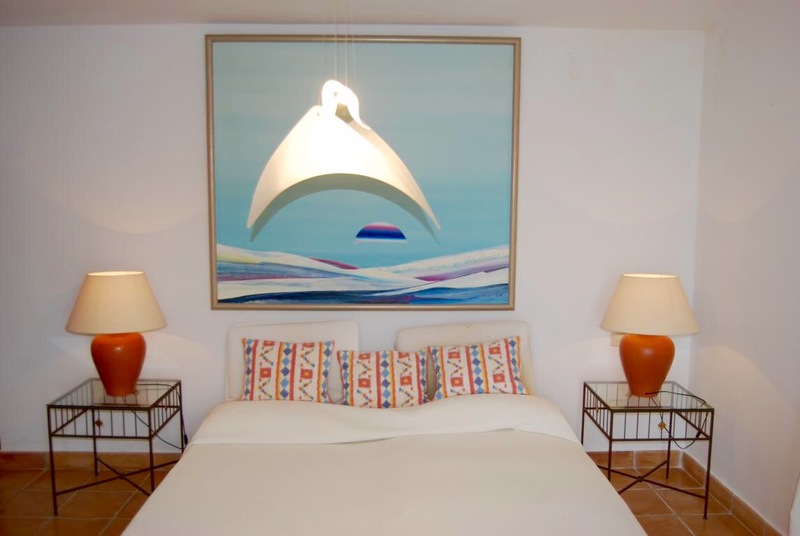 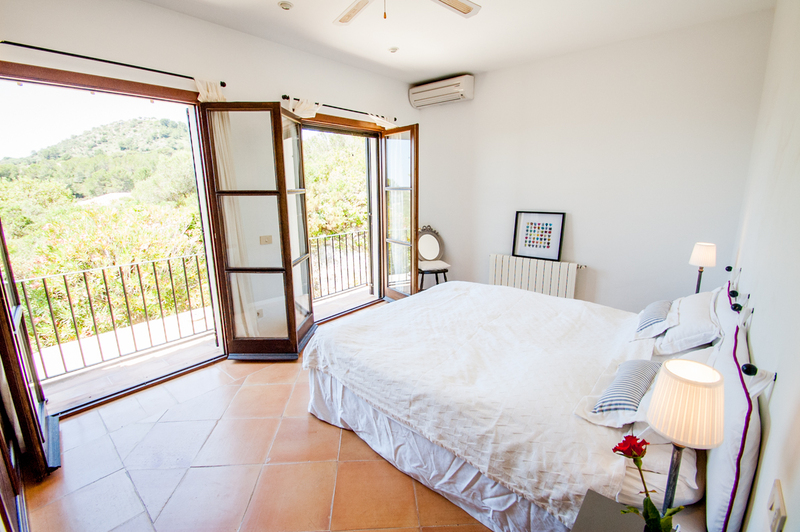 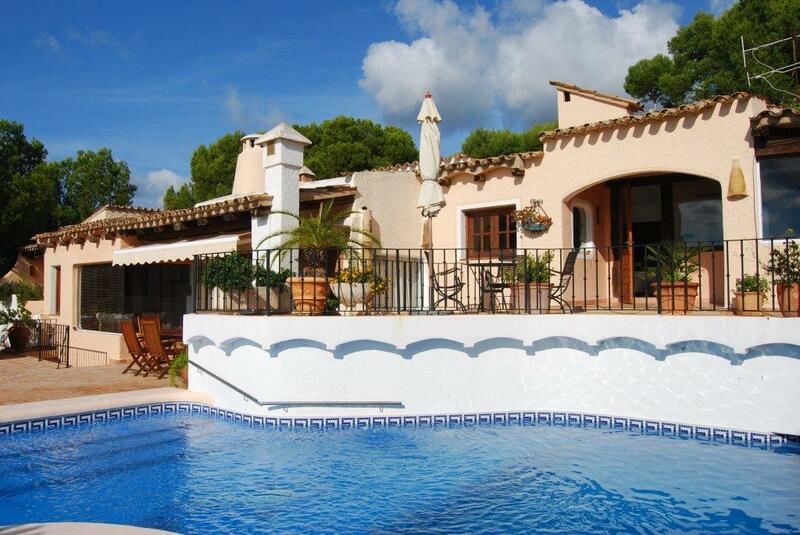 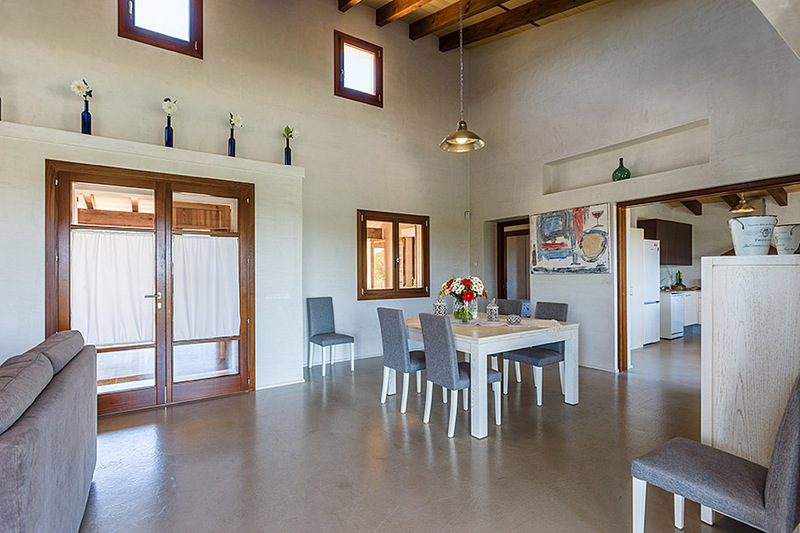 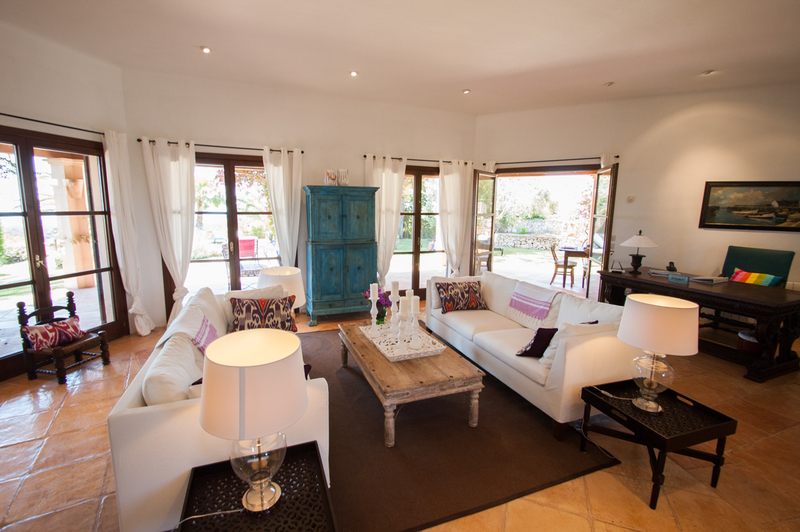 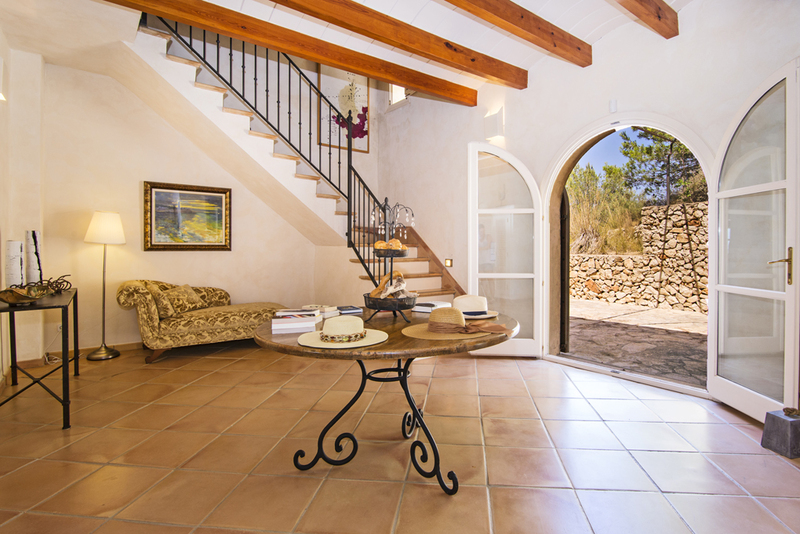 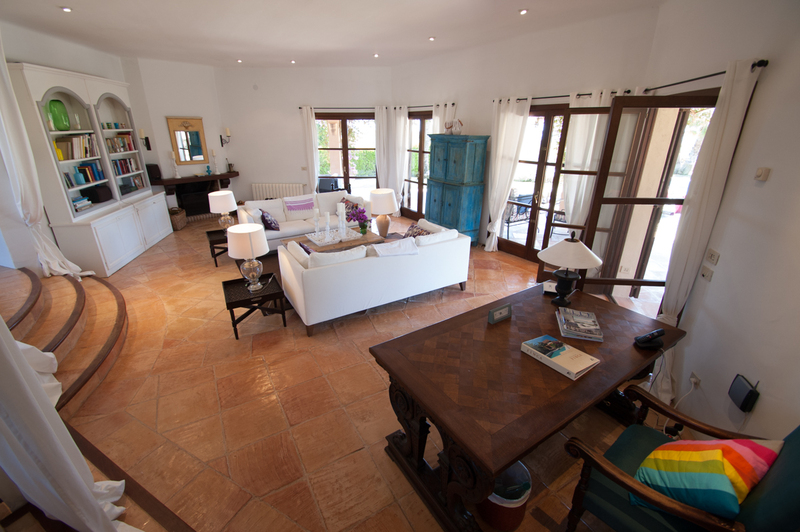 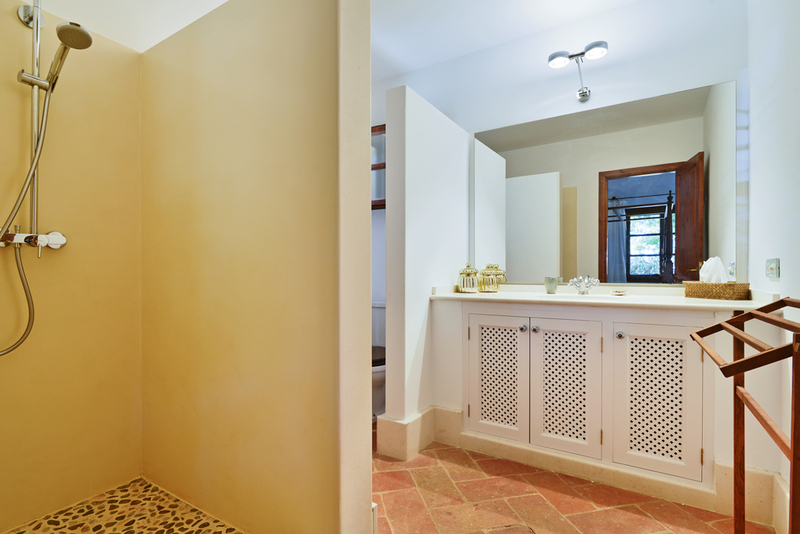 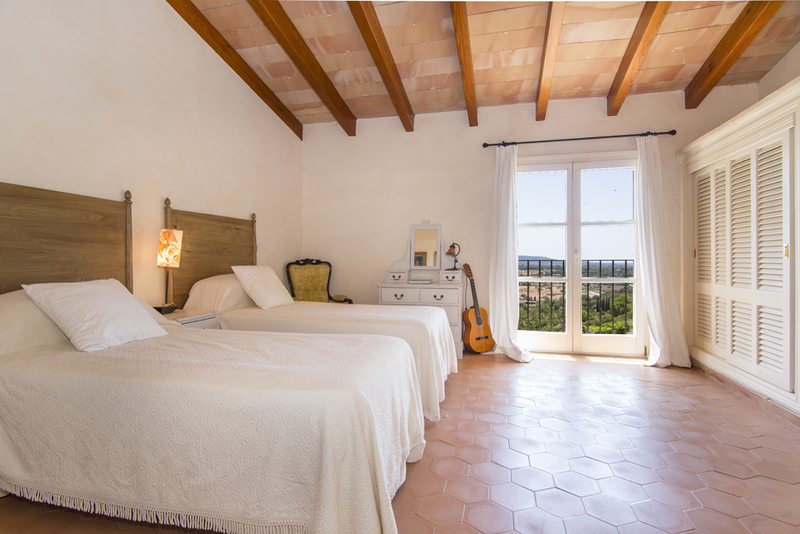 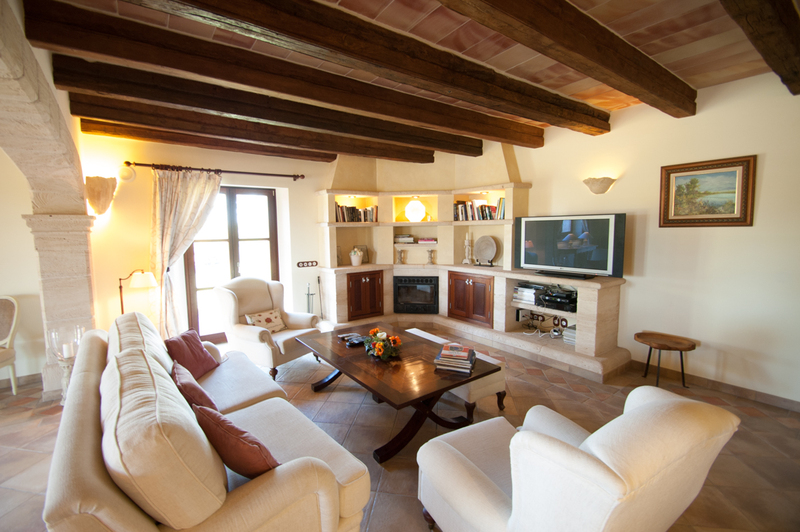 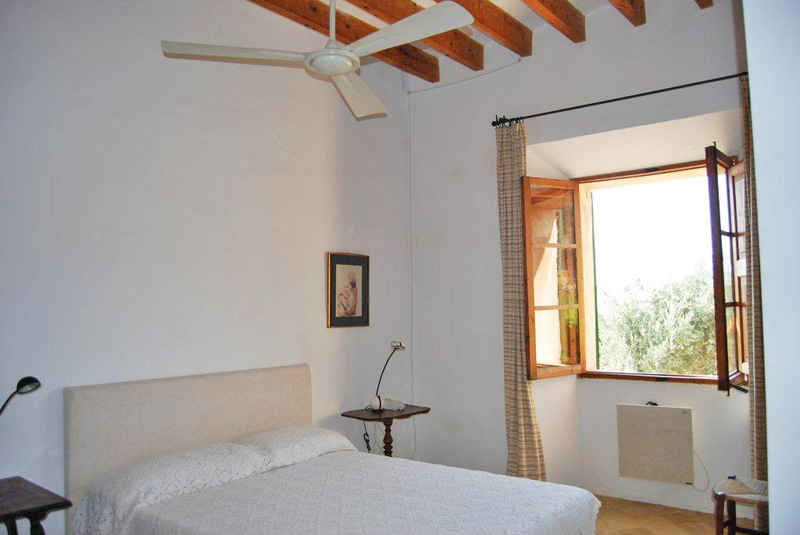 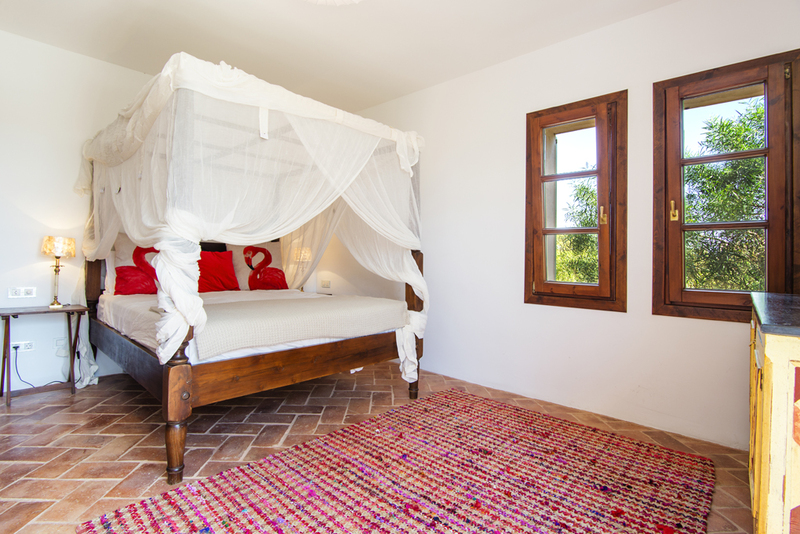 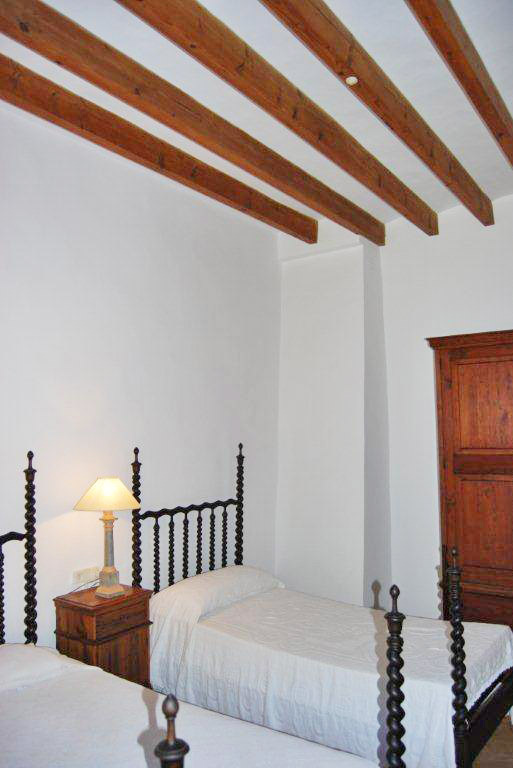 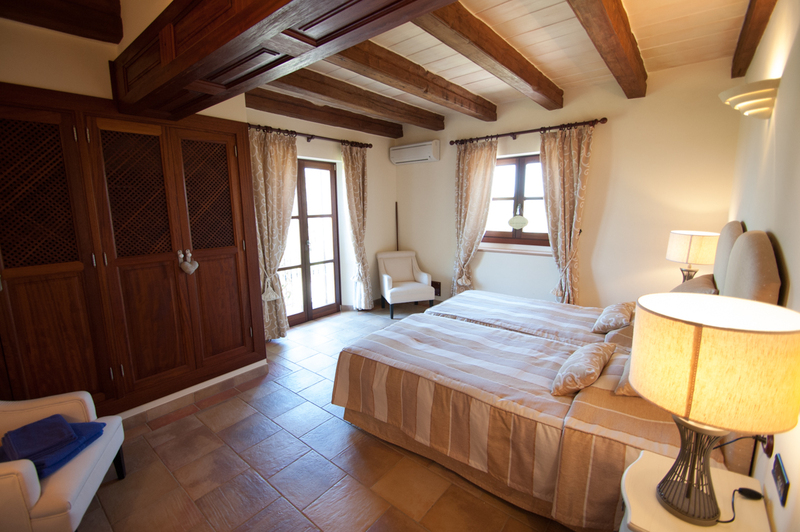 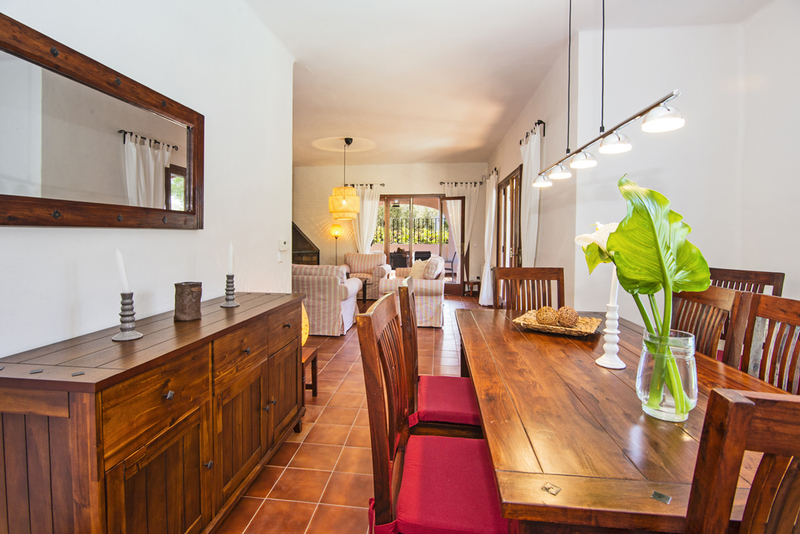 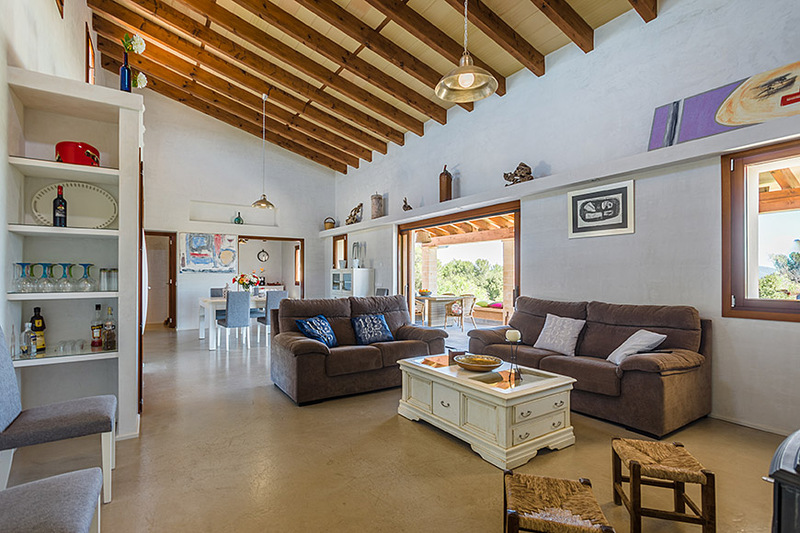 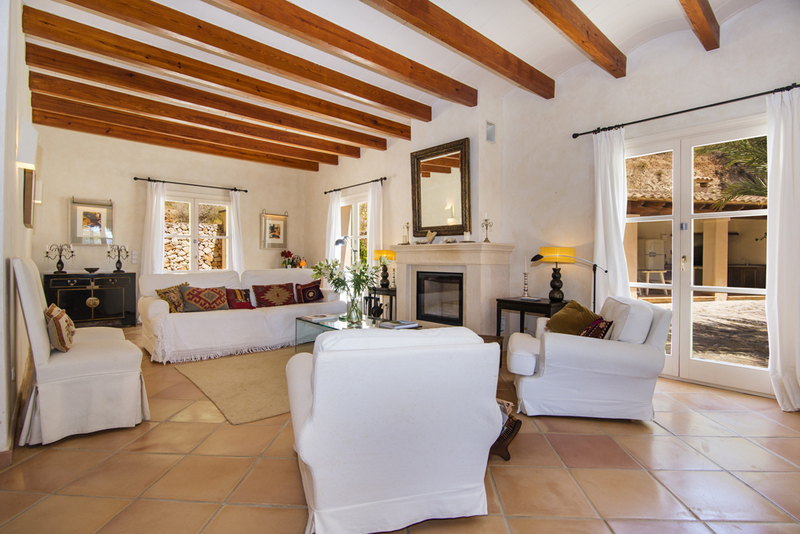 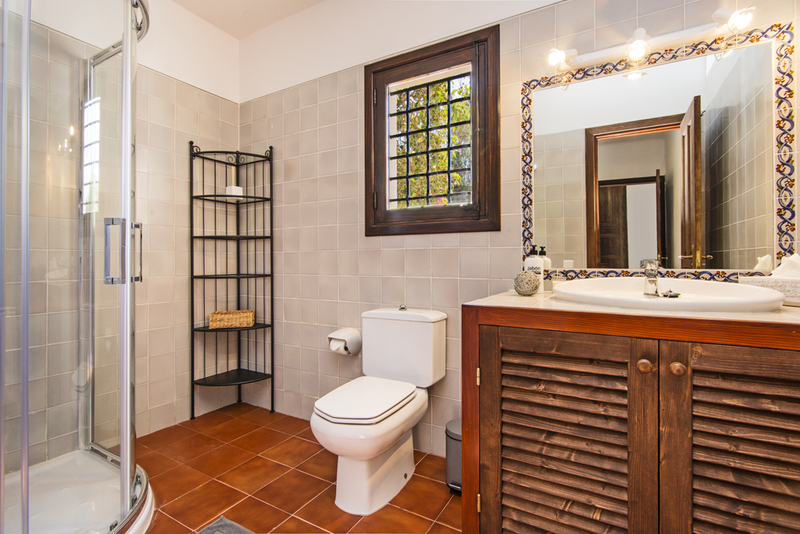 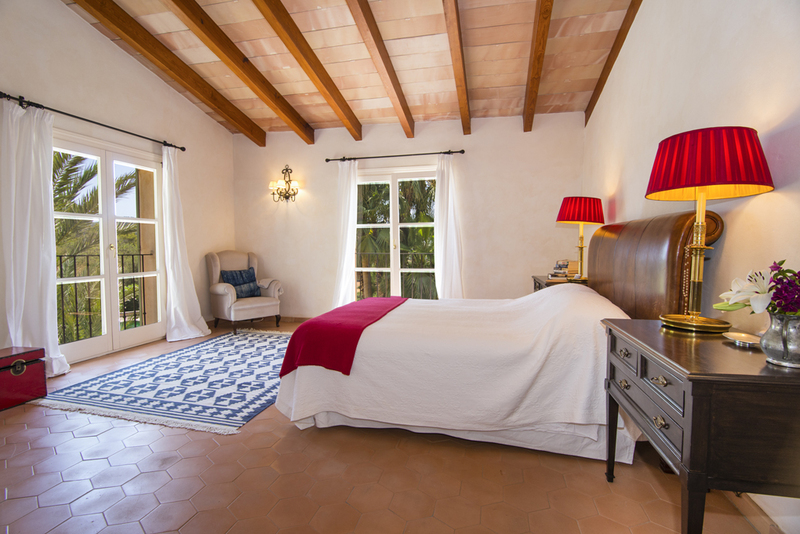 The finca consists of a main building and a guest apartment with a separate entrance. 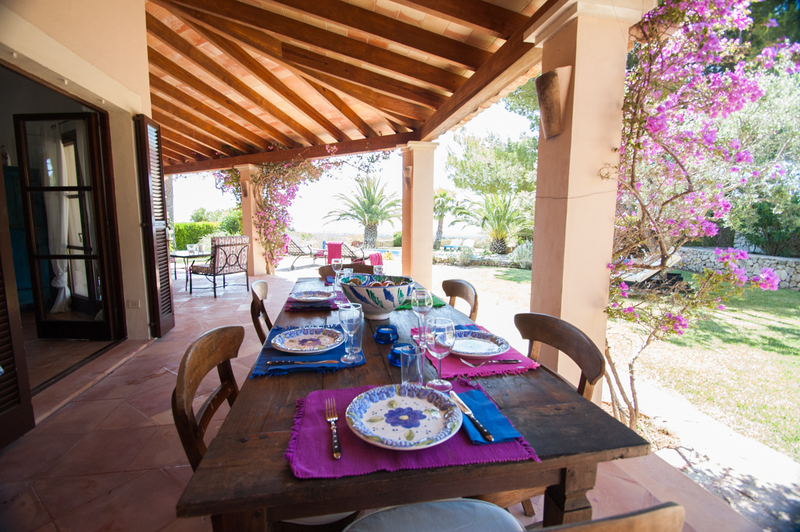 The generosity of the House and the garden is ideal for family or friends. 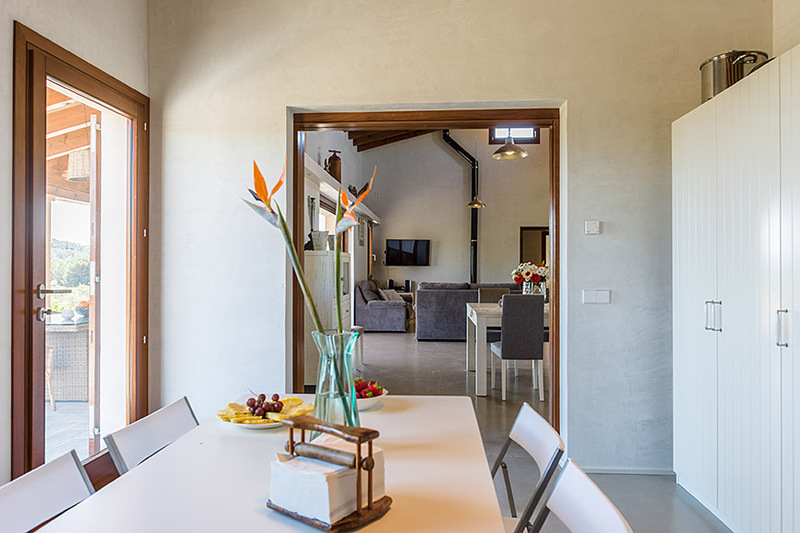 The new fully equipped farmhouse perched like an Eagle's nest on the slopes, boasts magnificent views to the sea. 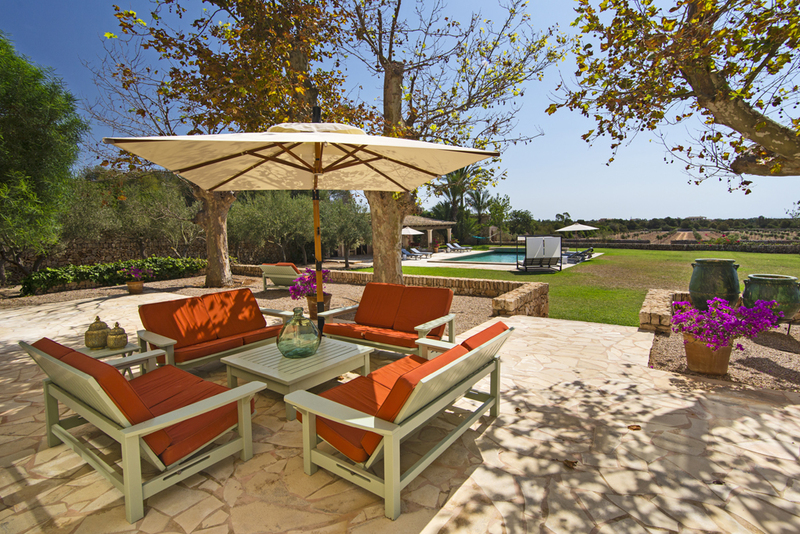 Enjoy the unique location of this luxurious hideaway in the midst of serene nature. 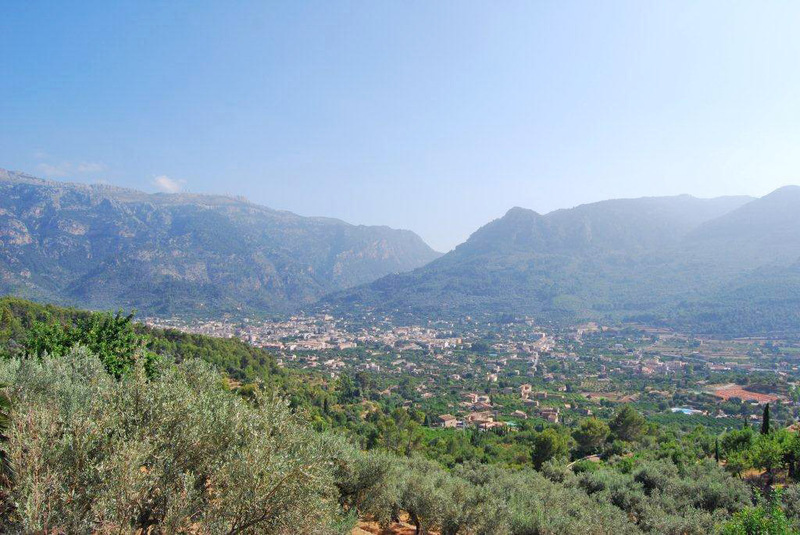 The pretty village of Felanitx with small cafes and restaurants is just 2 km away. 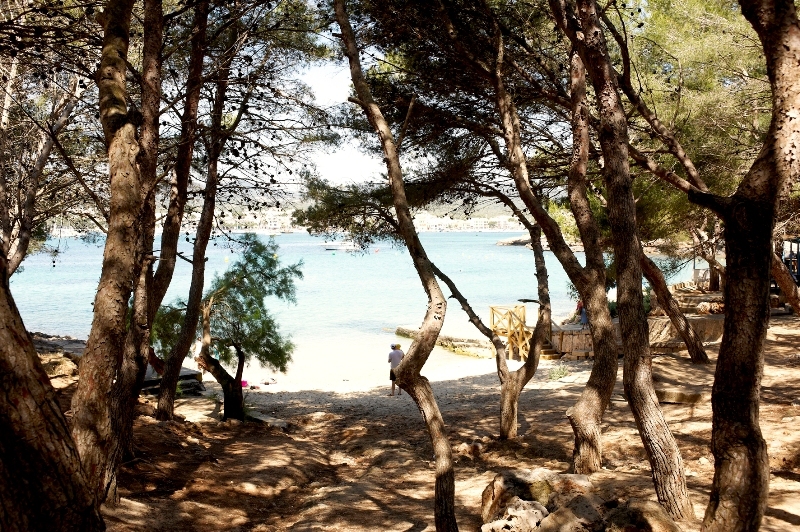 The south coast with many small bays and beaches can be reached in about 20 minutes. 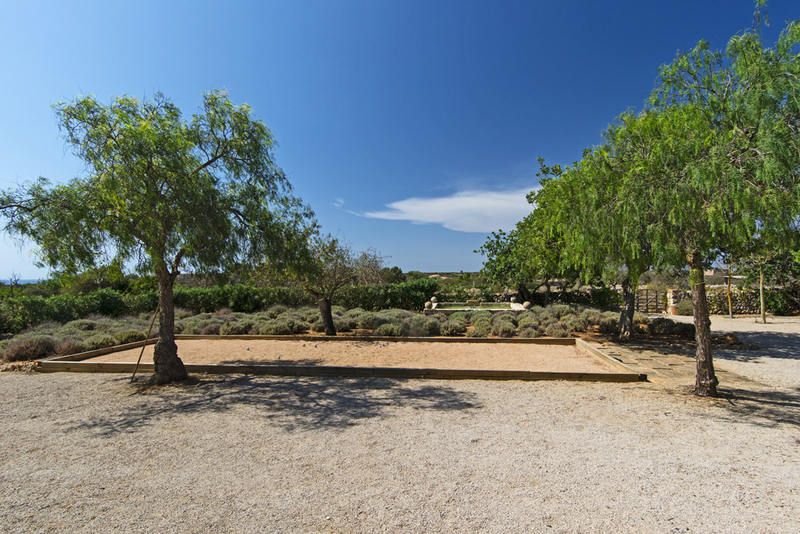 This spacious estate impresses with its spacious landscaped grounds as well as the beautiful, large Mediterranean garden. 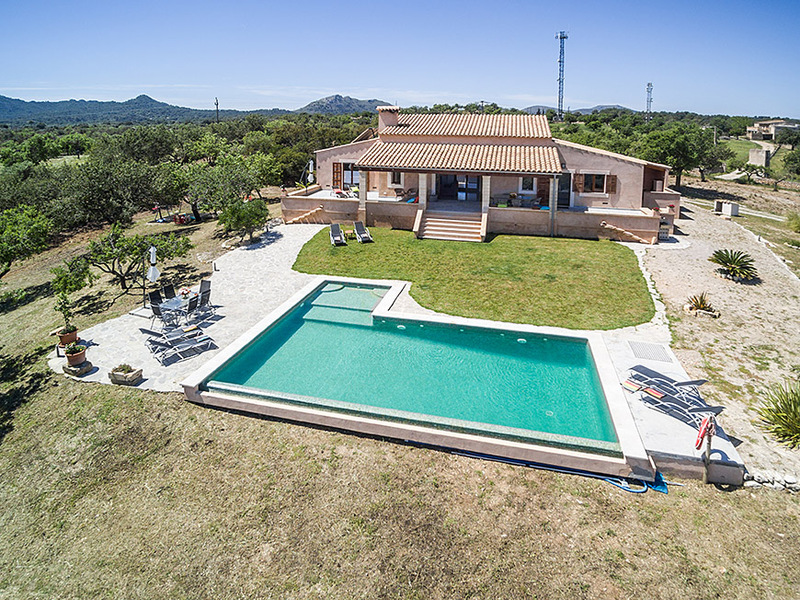 A pool with 5 x 10 meters, the pool house, the barbecue house and summer kitchen, as well as many other details add to the allure of this wonderful retreat. 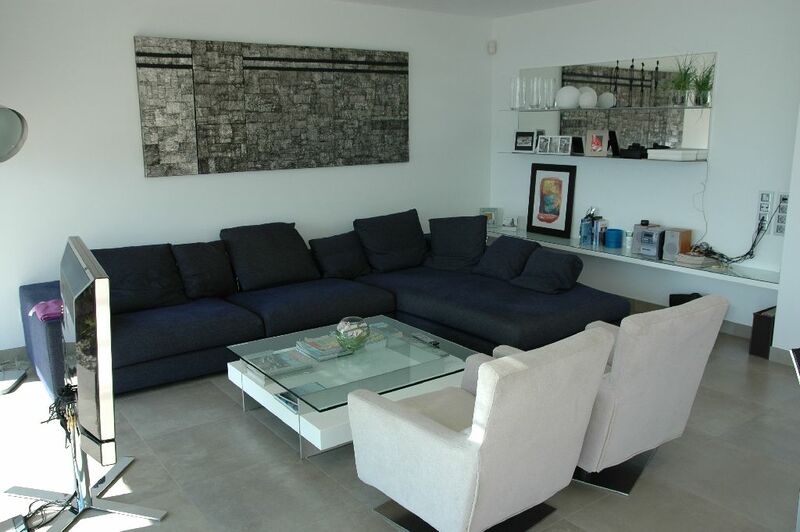 The furnishing is characterized by classical pieces and best quality works. 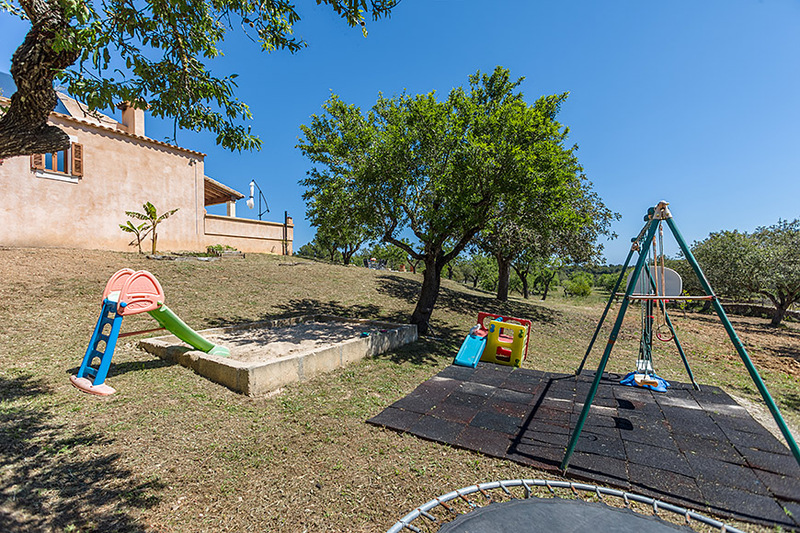 Finca Al Mar is an ideal holiday home for families with children, and those who do not want to go without luxury during their holiday. 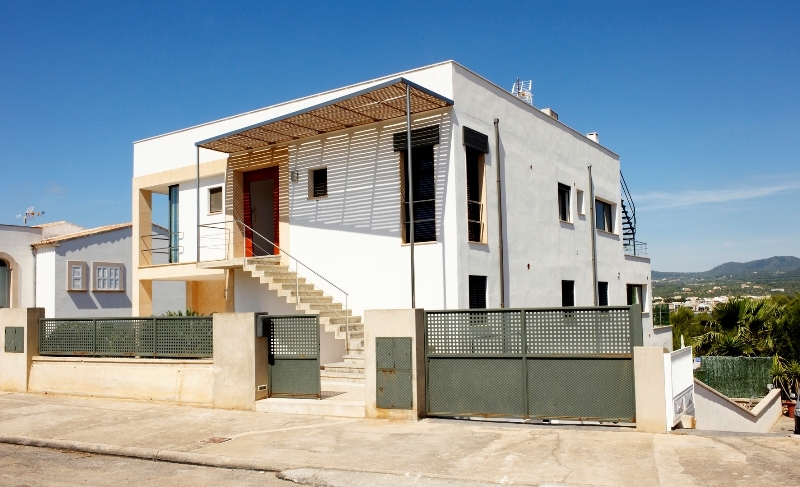 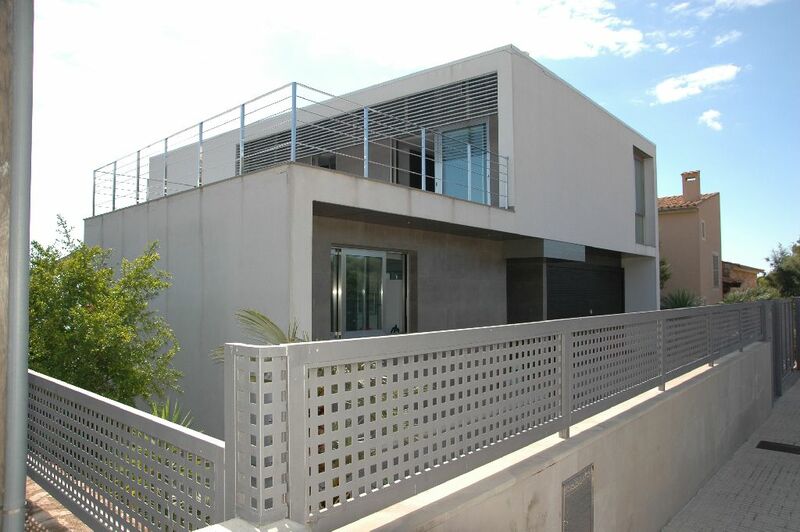 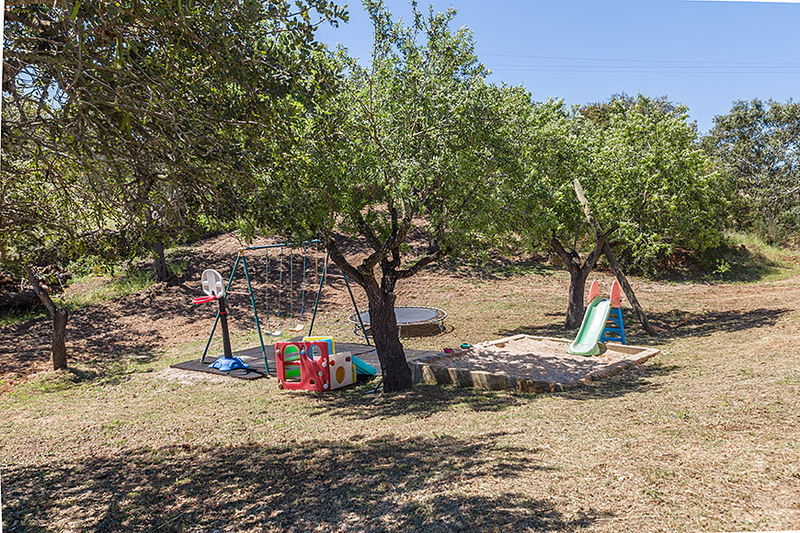 Thanks to its position, the villa is suitable for families with children as one can move about easily without car. 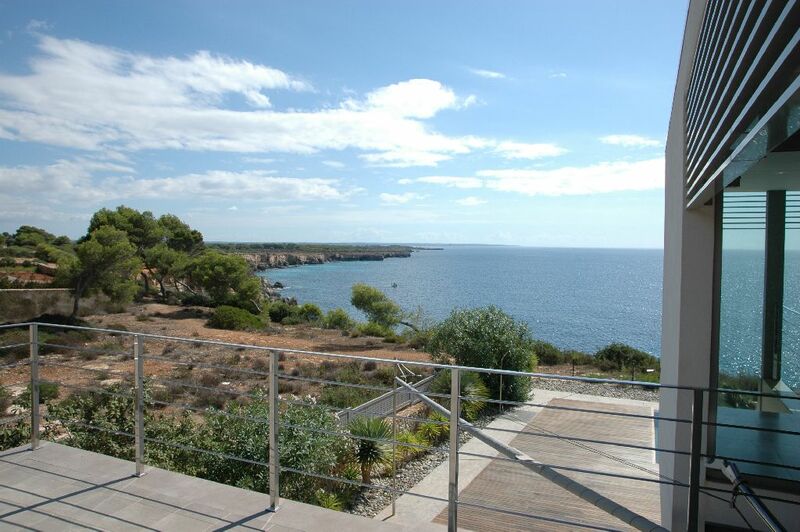 There are several beaches within walking distance and the town offers a great variety of shops, restaurants and bars. 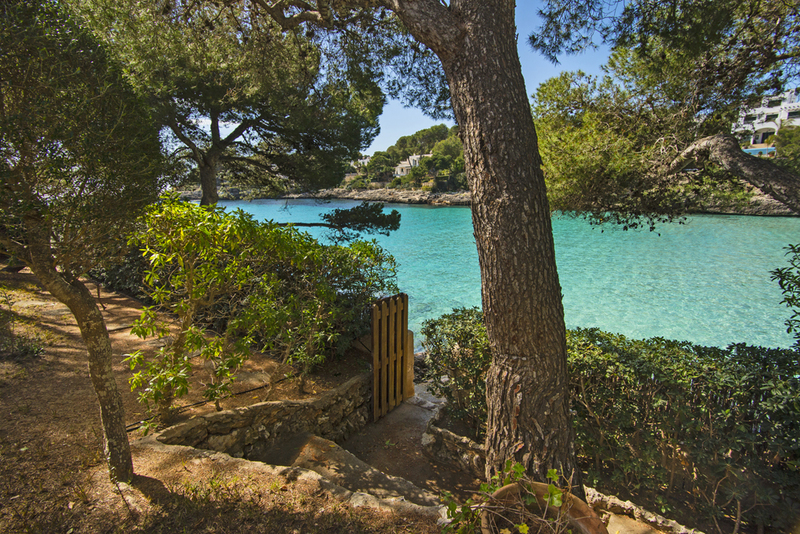 The marina of Cala D’Or with its big yachts is also reachable trough a footpath, where you will also find several good restaurants. 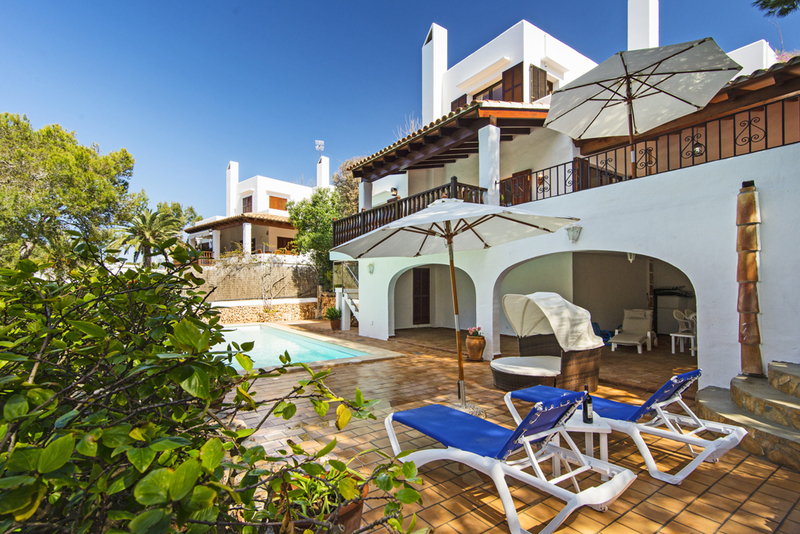 This beautiful villa built in Ibicenco style, nestles in a spectacular location in first sea line on the cliffs of Cala Egos. 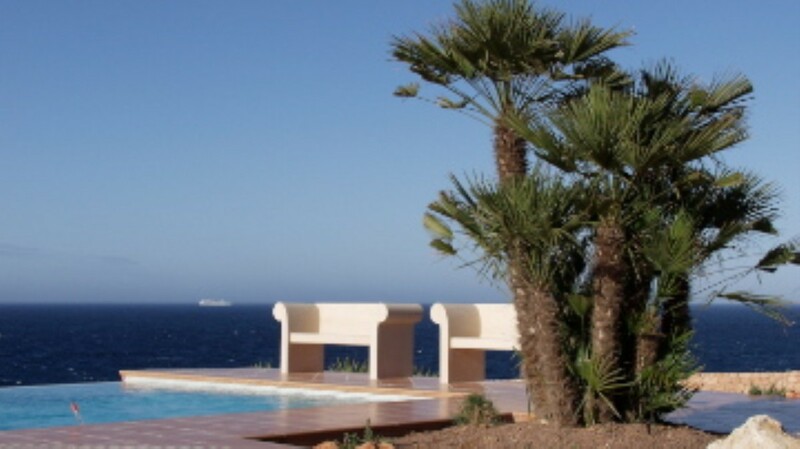 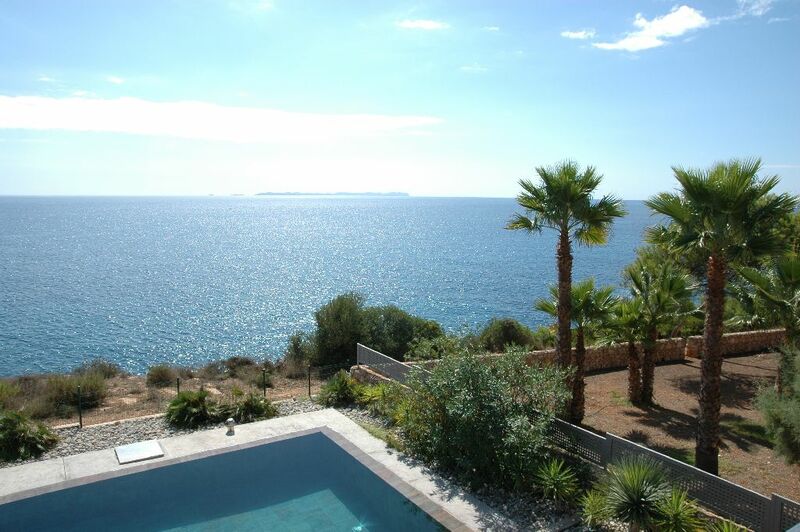 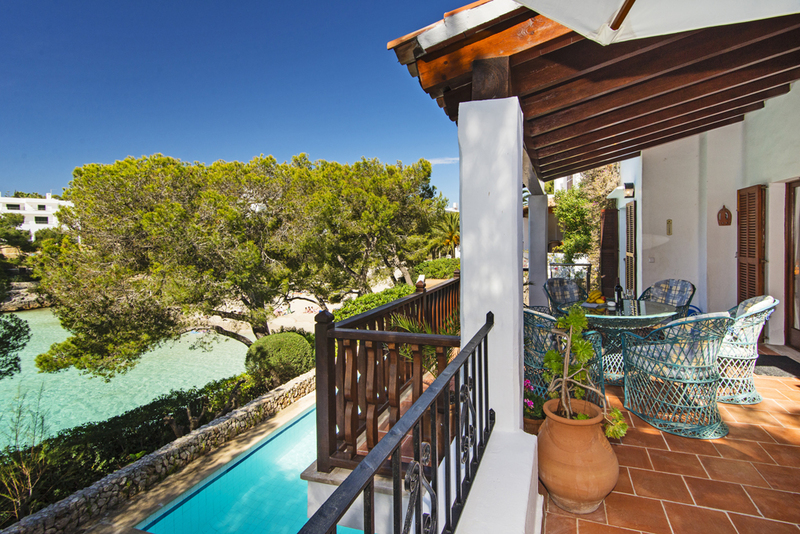 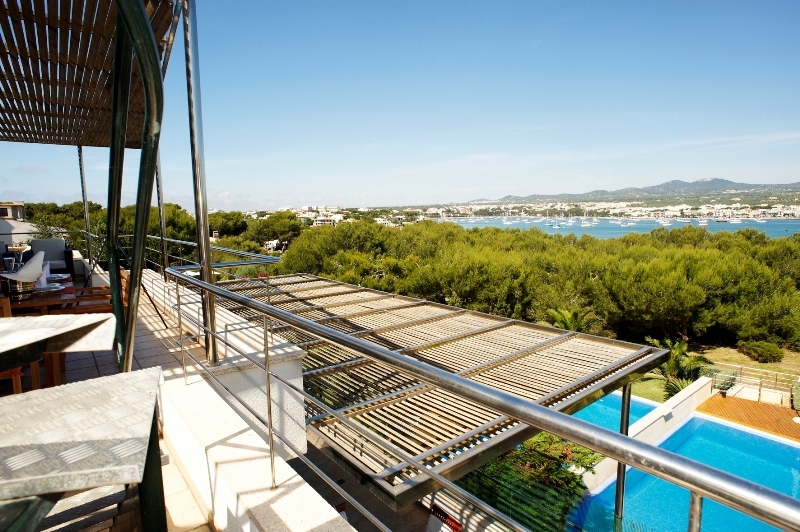 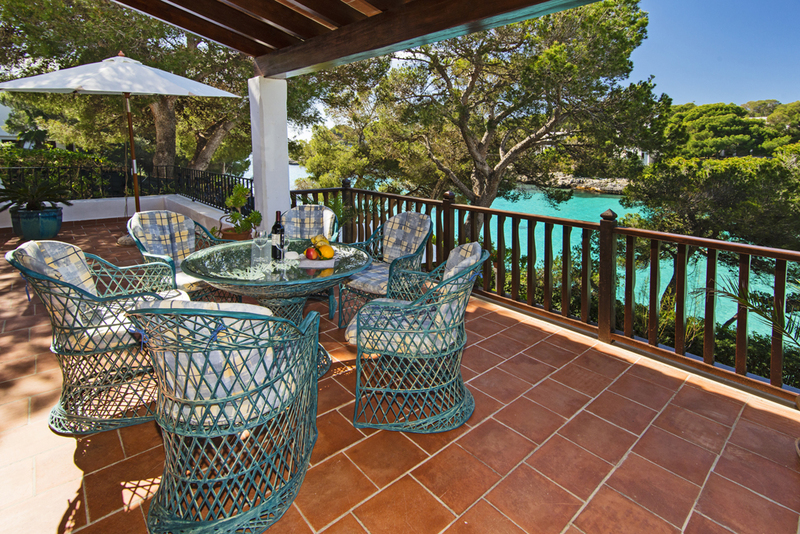 Marvellous views across Cala Egos Bay and the open sea unfold from the pool terrace. 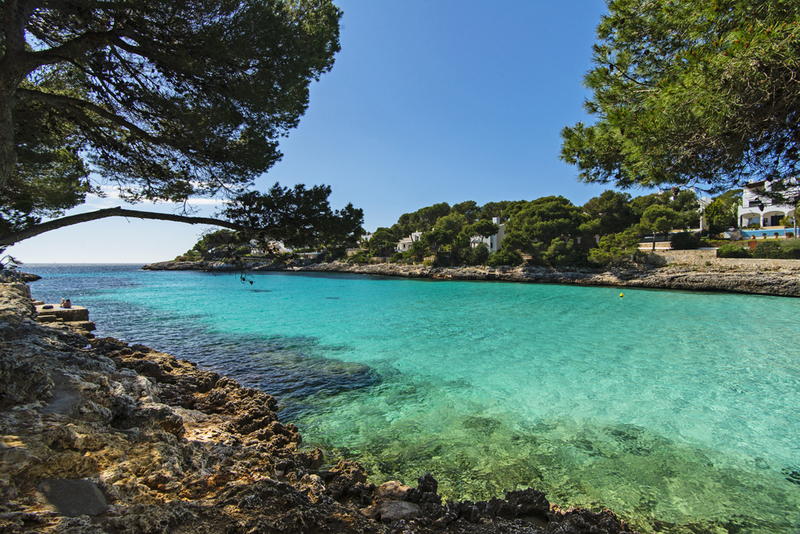 Cala Egos is part of Cala d´Or and offers a variety of restaurants, cafes and shops and so does the glamorous marina nearby. 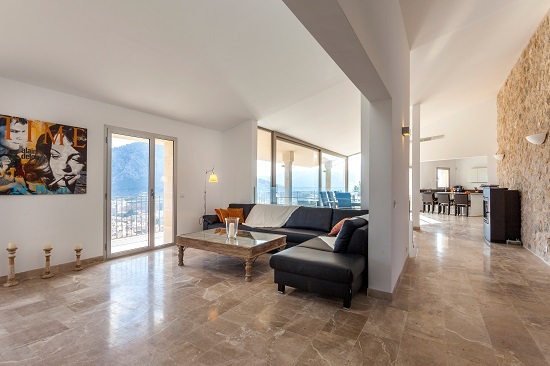 The roof terrace on 2 levels to chill out and relax with wonderful views across the picturesque port of Port de Andratx and into Tramuntana mountains, is the perfect spot to quickly create the relaxed holiday atmosphere, everybody is looking for. 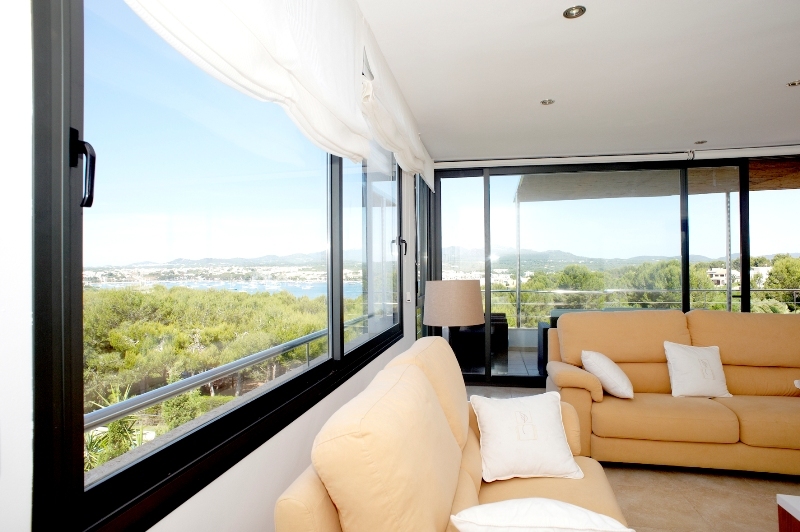 At night, myriads of lights sparkle in and around the harbour and harbor promenade - the views are just gorgeous. 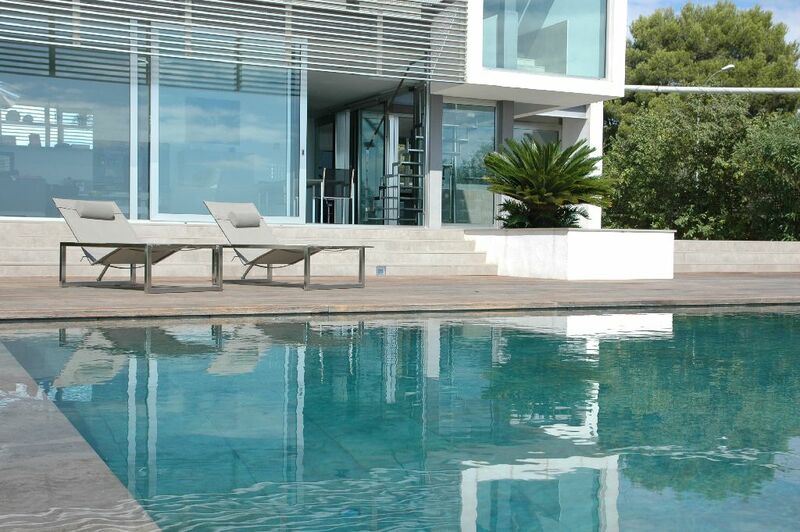 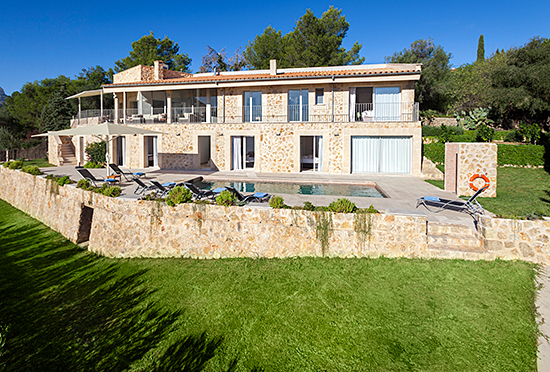 The exceptional location right at the ocean, as well as the stylish ambience of this designer Villa are an ideal combination for relaxation and sun-worshippers who want to experience the diversity of the southeast of Mallorca. 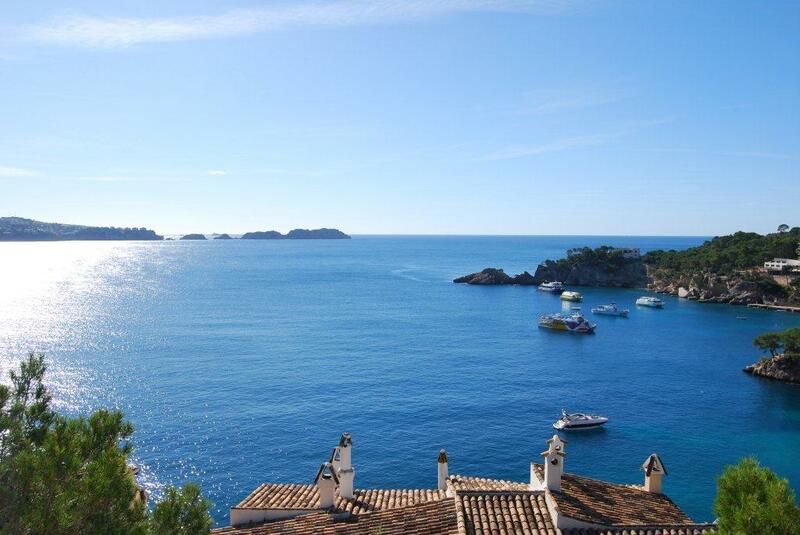 The fantastic panorama views across the open sea leave nothing to be desired. 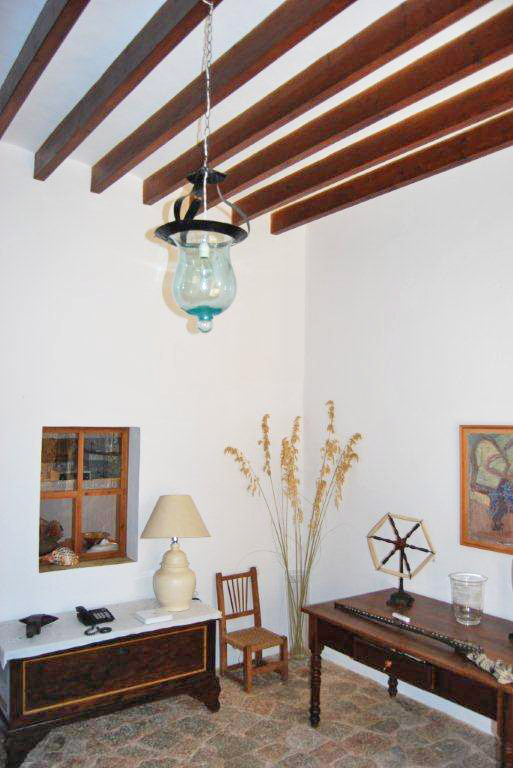 Free Internet access (Wi-Fi). 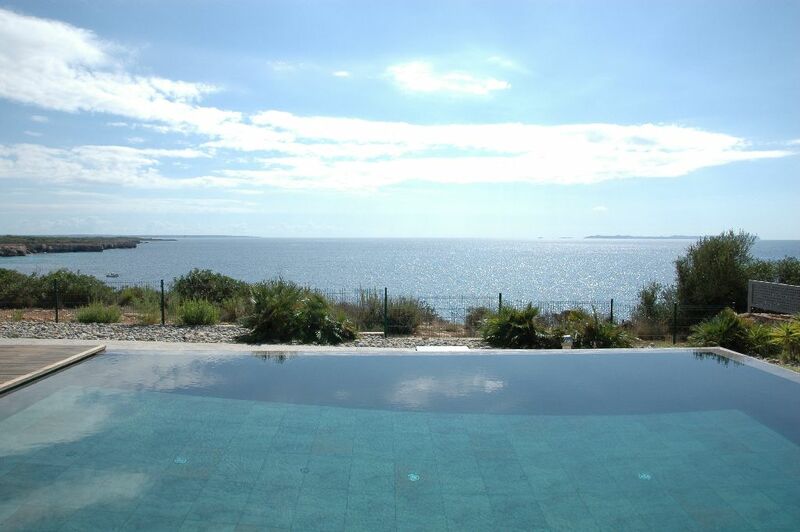 The exceptional property is magnificently positioned high above the ocean in first sea line and thus with endless views across the deep blue sea to the island of Cabrera. 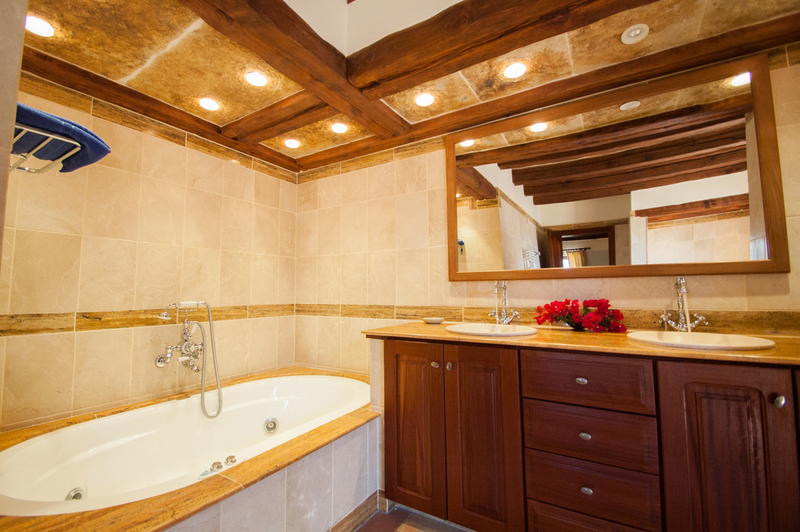 The Mediterranean dream features a modern, sun-drenched and luxurious ambience throughout. 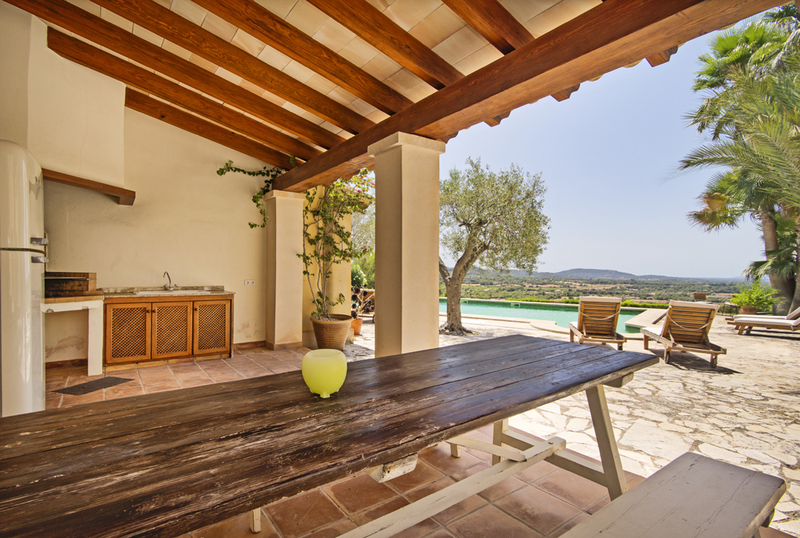 Large vitreous walls, which open up to an open-air summer-kitchen extending the generous outside entertainment area, add to the exclusivity of this holiday treasure. 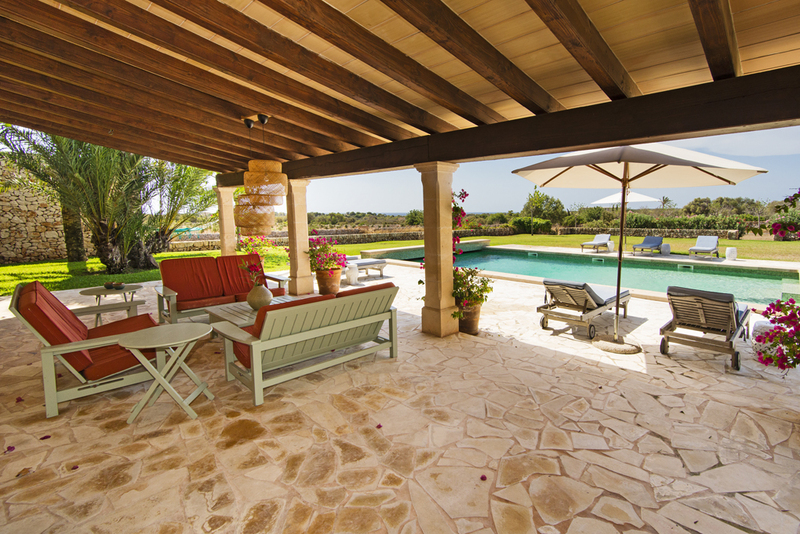 The pool billiard room and a ping-pong table for in- or outdoors are appreciated entertainment options. 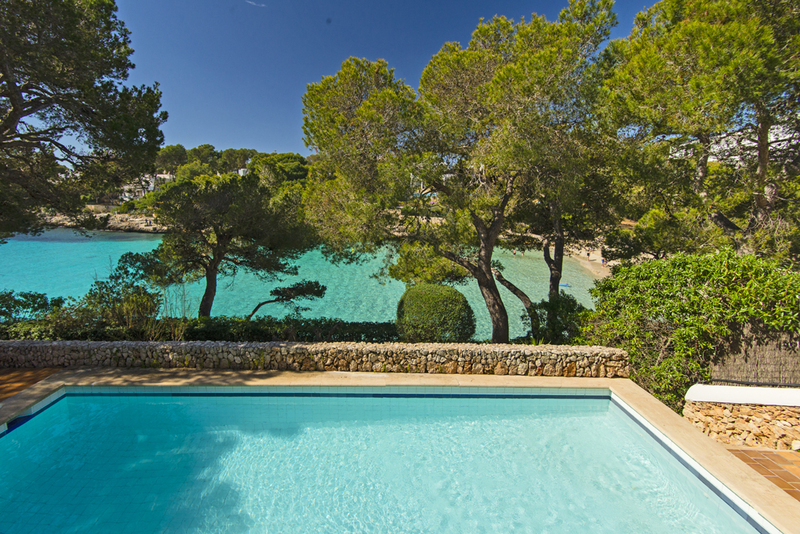 Please note: Villa Roca Mar is a non-smoking villa. 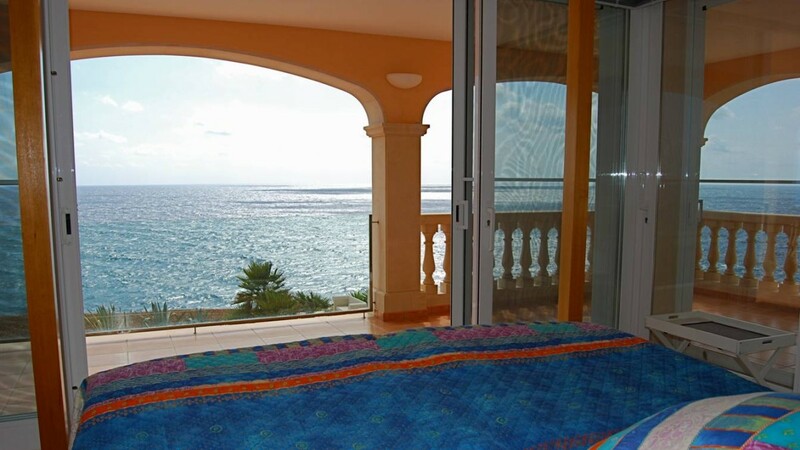 The superior seaside villa with breathtaking views from all rooms, terraces and the pool area was built by one of the most well-known architects of the island and boasts an intriguing Mediterranean interior design on several levels, as well as a most luxurious lifestyle in a most privileged coastal setting. 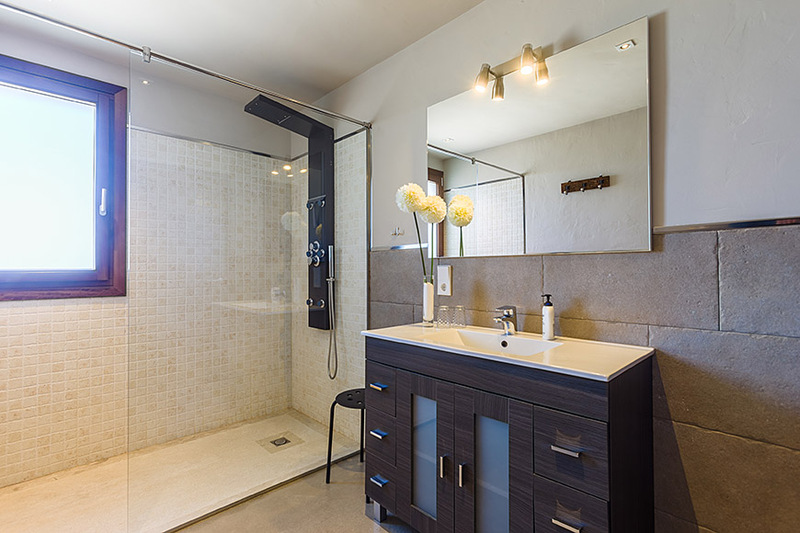 The sauna, the gym or the option of booking additional cleaning days or a breakfast service, are just a few extra features. 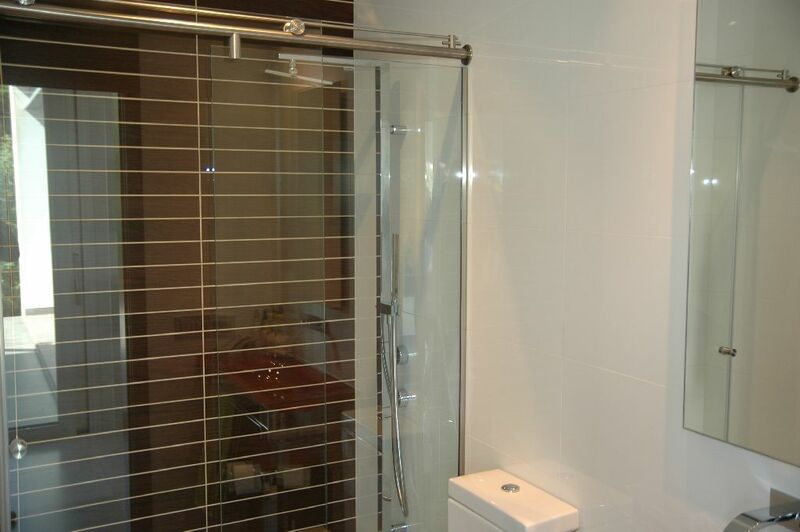 Central heating provides for all year occupation of this property. 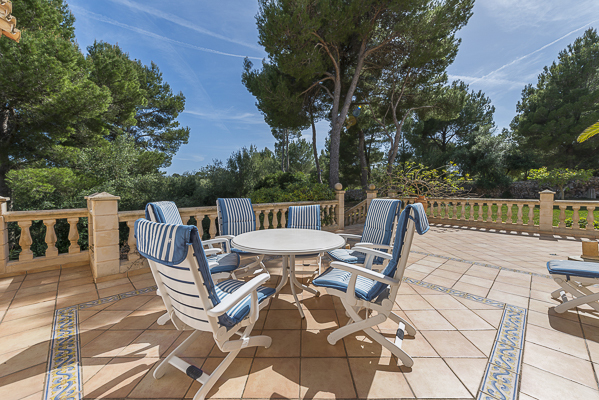 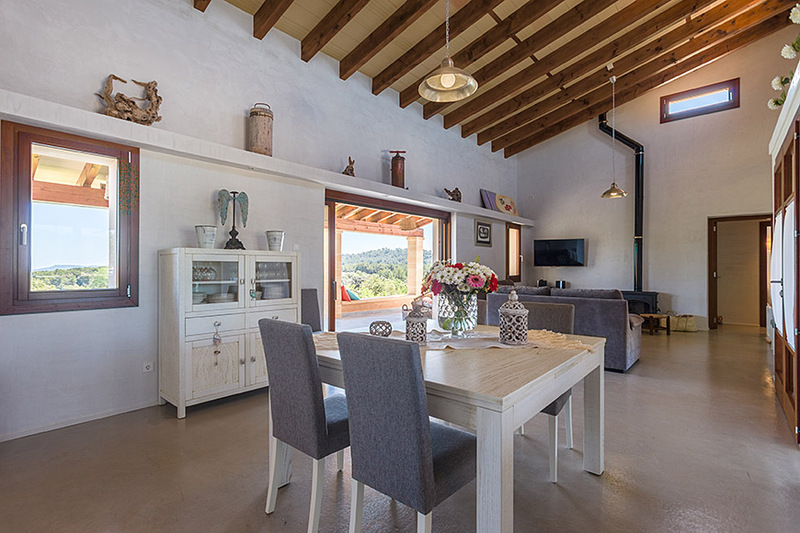 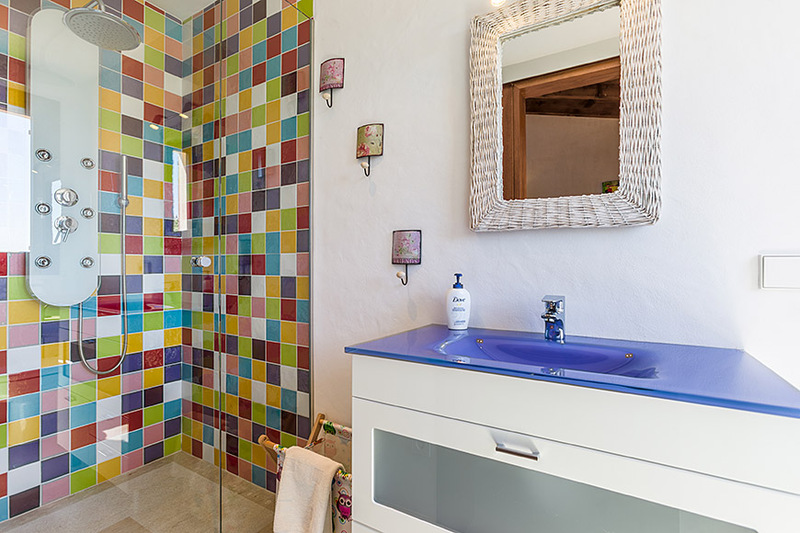 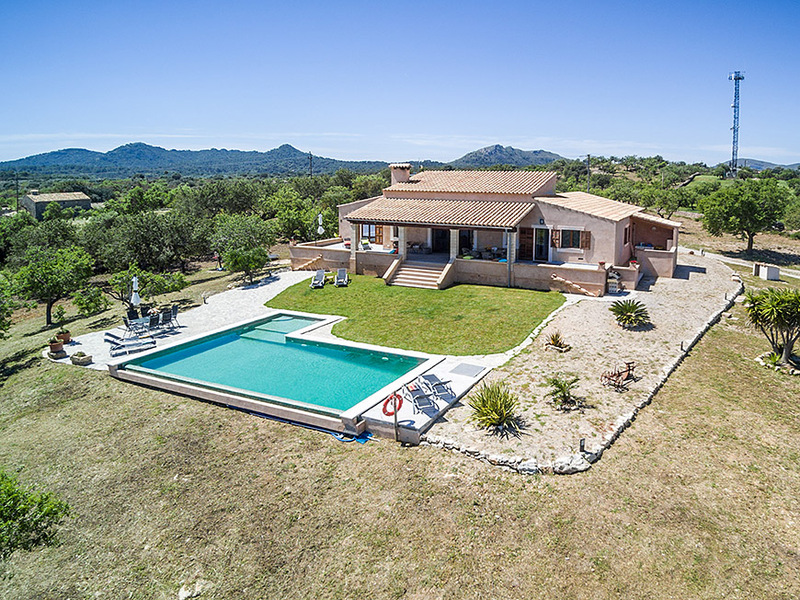 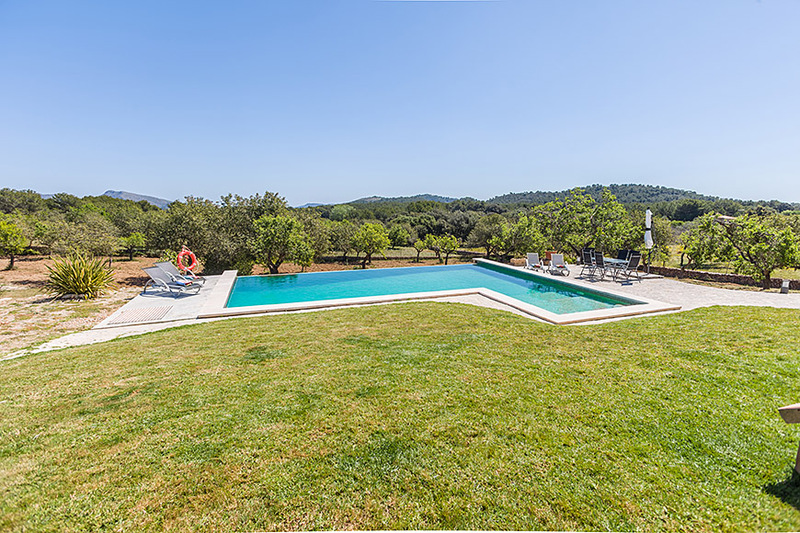 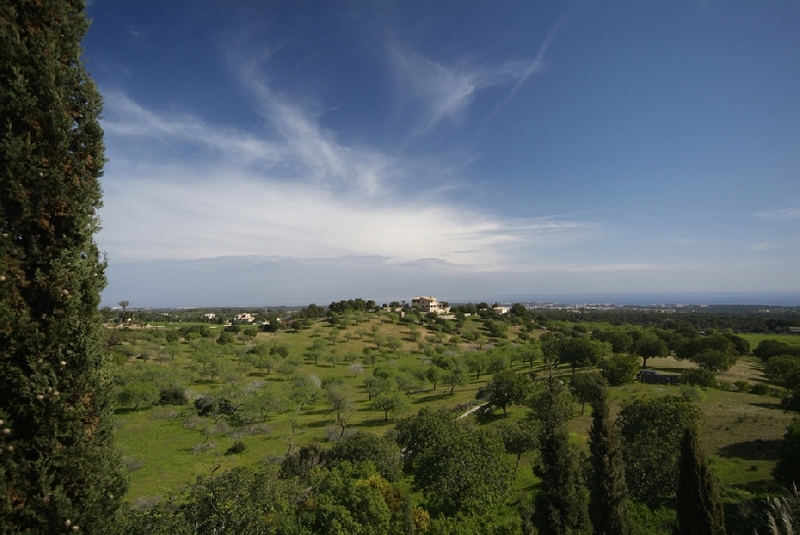 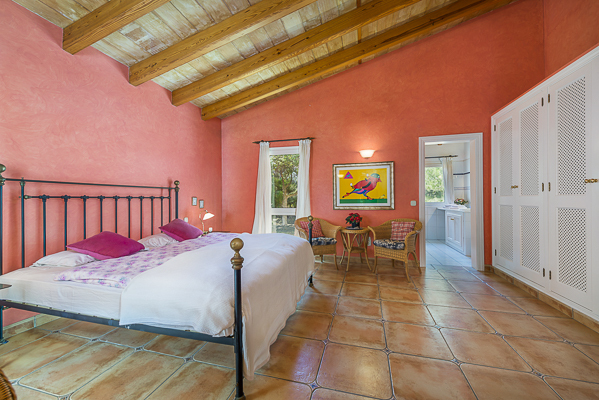 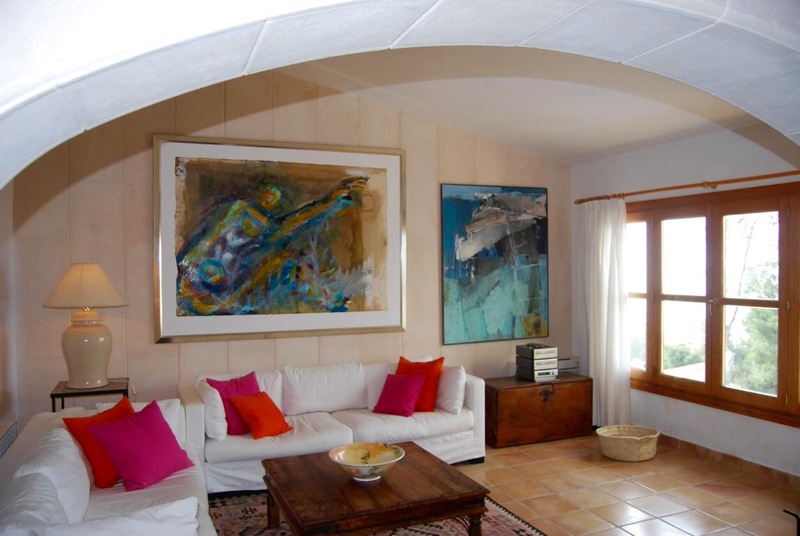 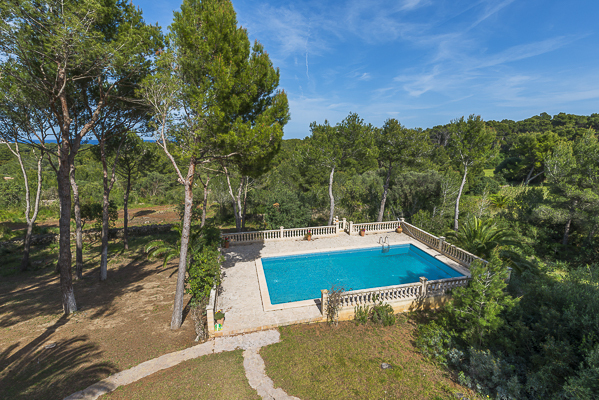 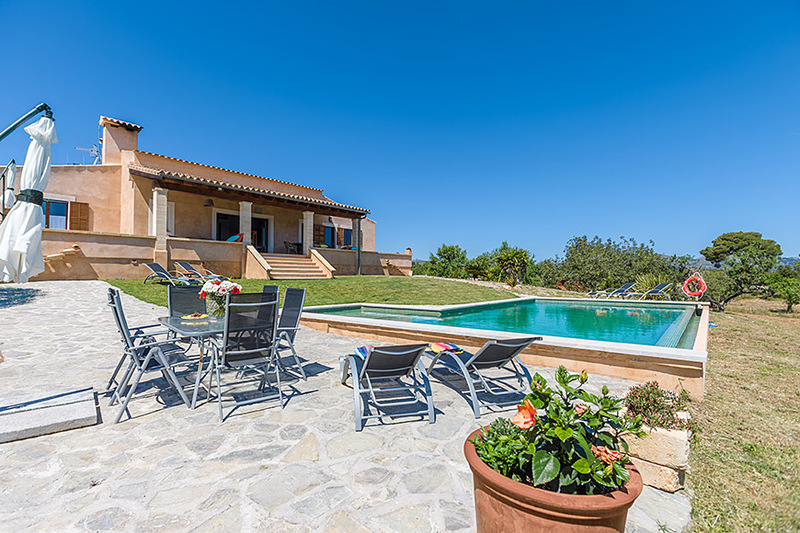 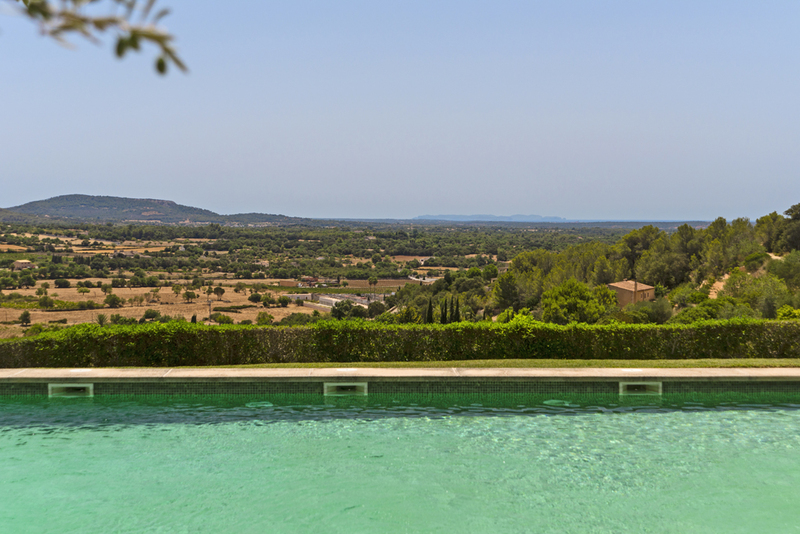 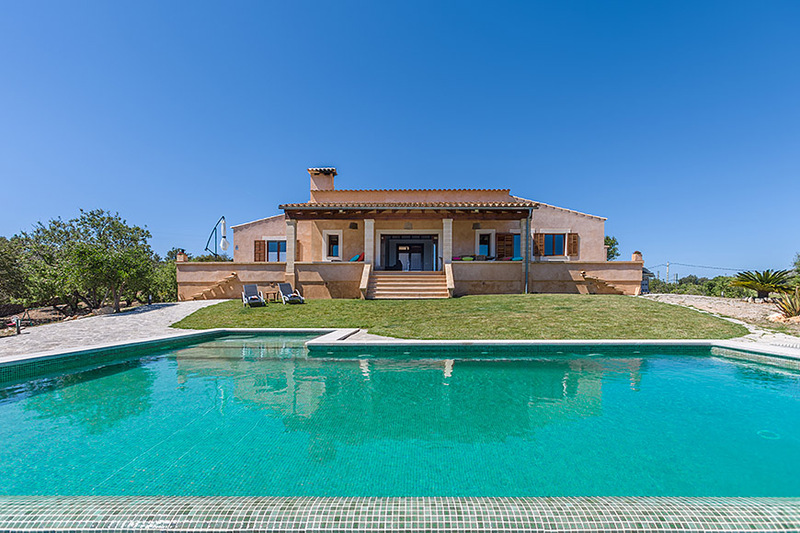 Finca Es Turo del Golf rests peacefully on an elevated plot of 15.000 m², overlooking the golf club Val d´Or with its stately club house, as well as the charming surrounding of S´Horta, the quaint little village nearby – and the ocean. 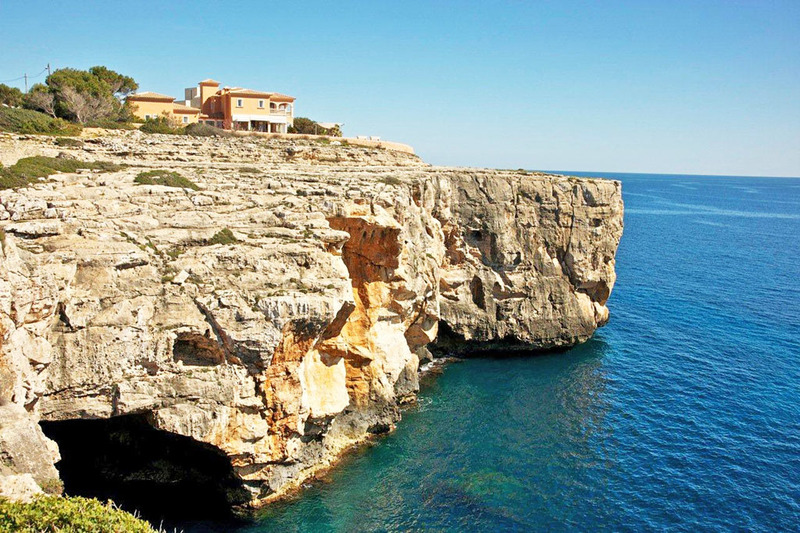 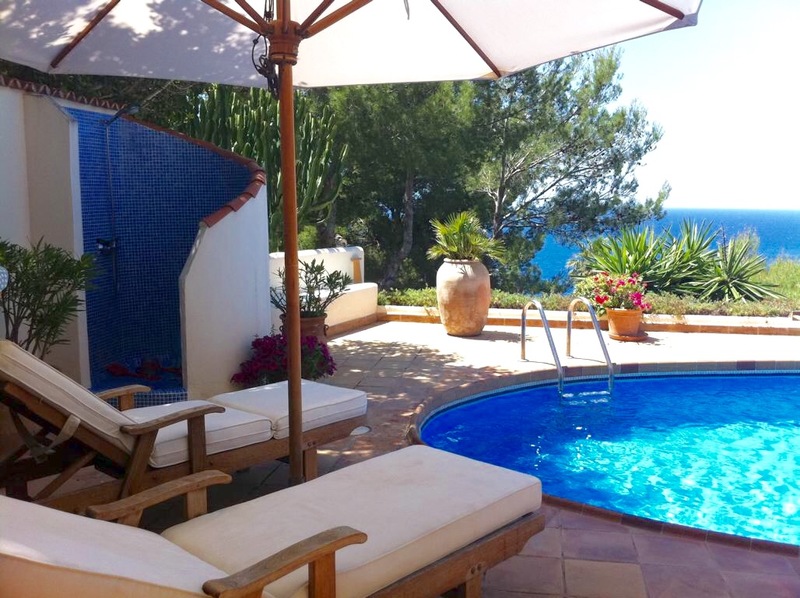 It is also not much further to attractive beaches and the pretty fishing village of Porto Colom, which is known for its large natural harbor lined with shops, cafés and elegant restaurants. 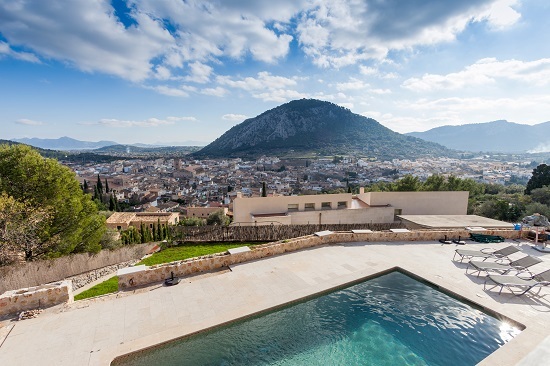 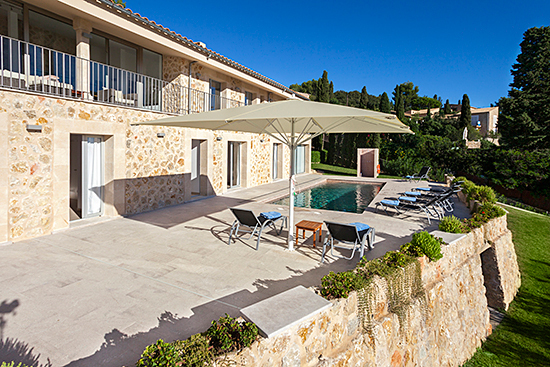 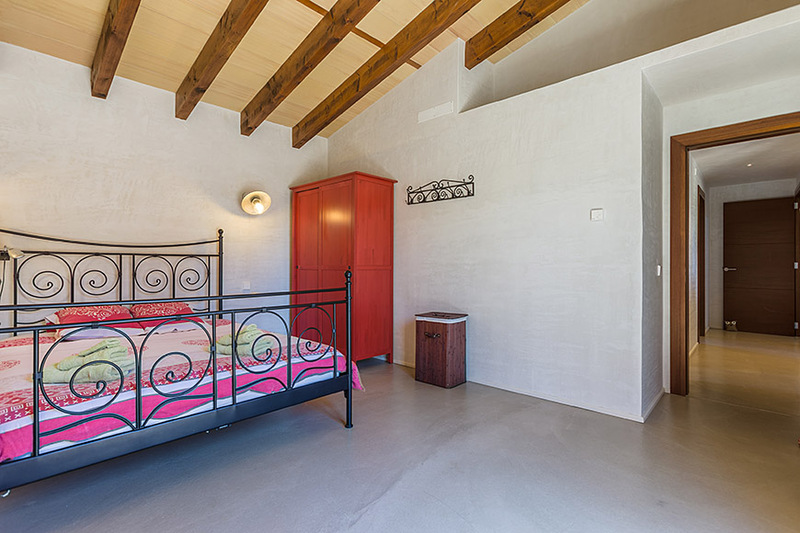 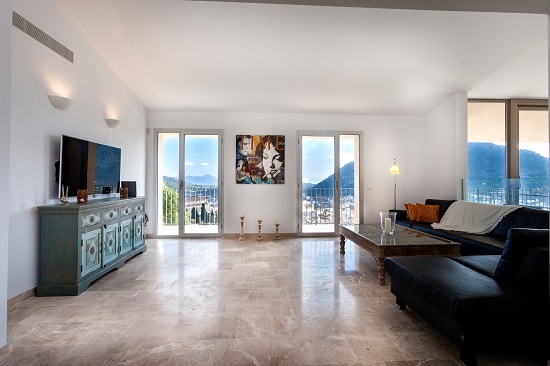 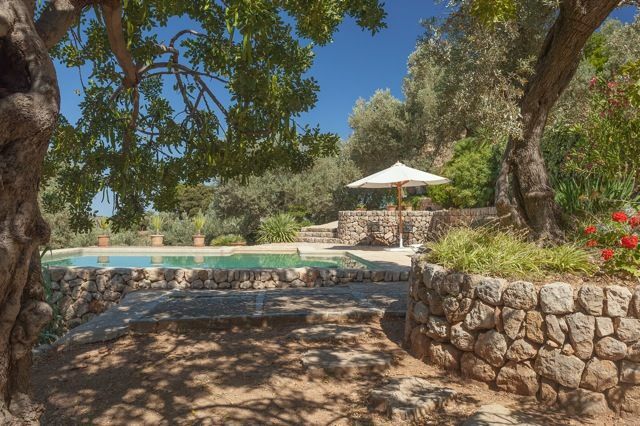 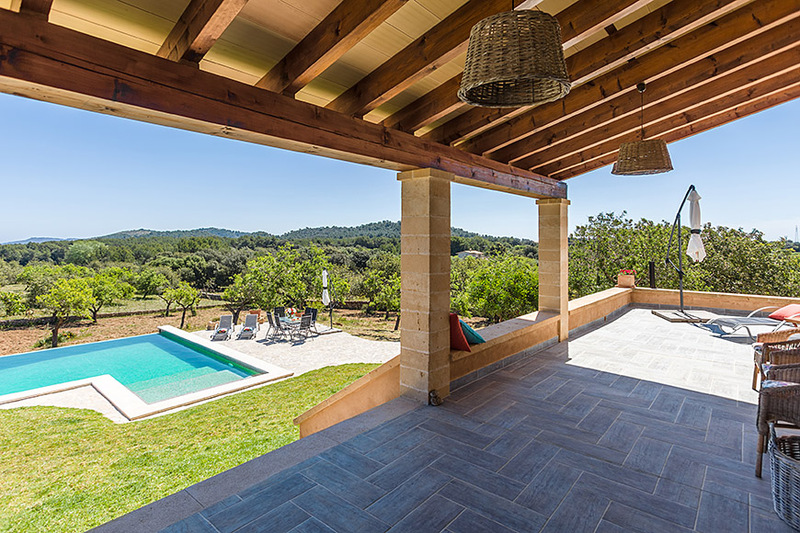 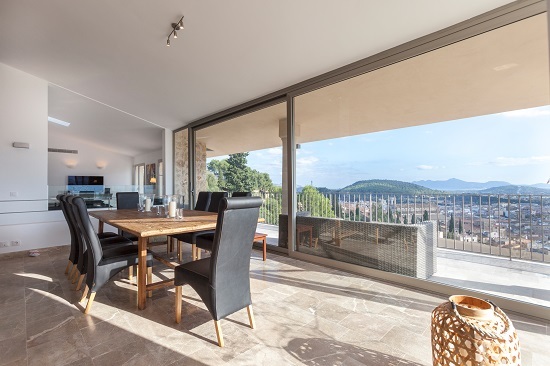 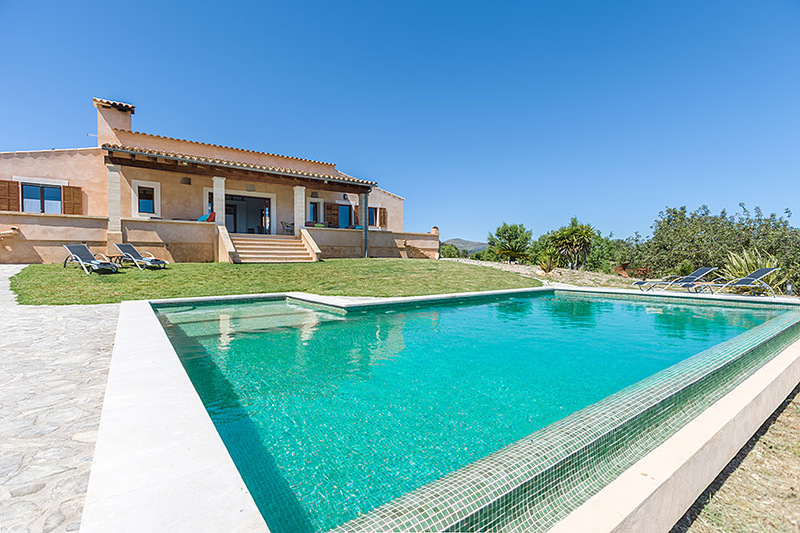 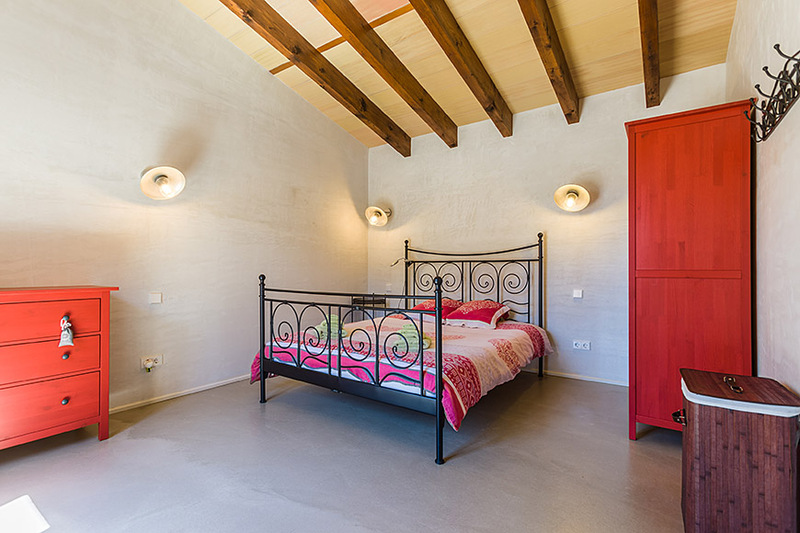 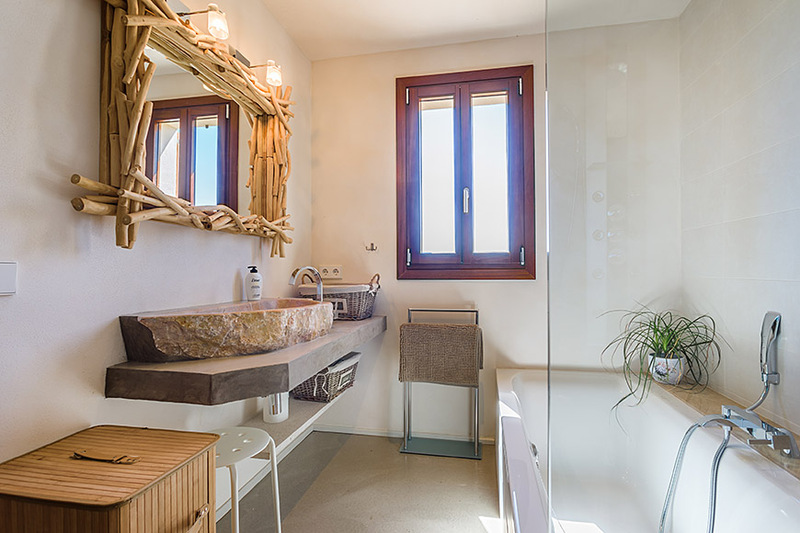 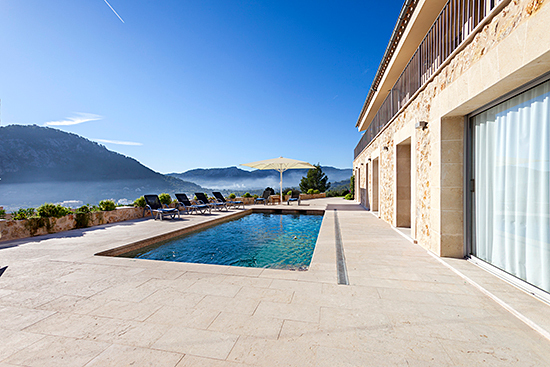 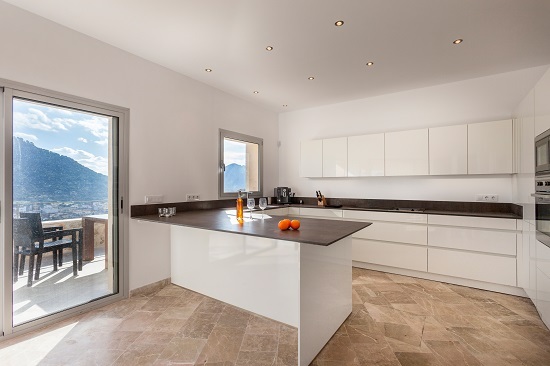 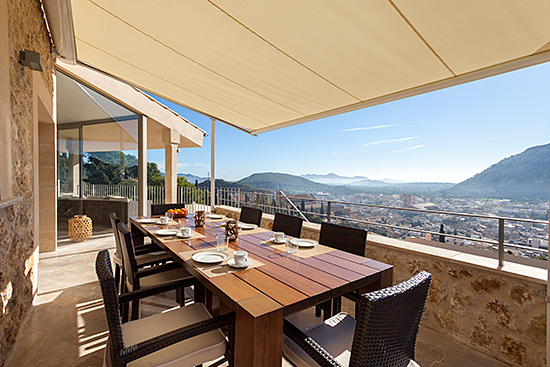 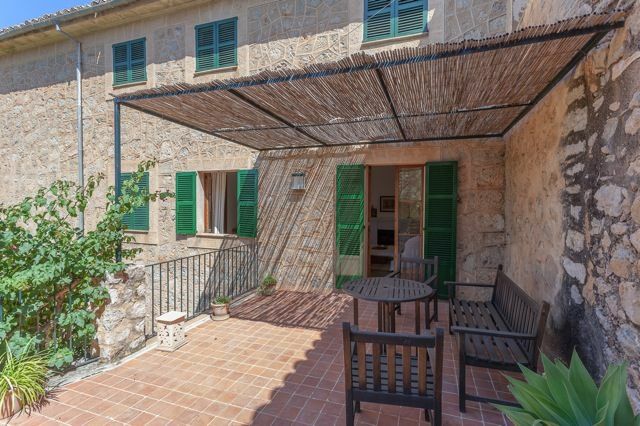 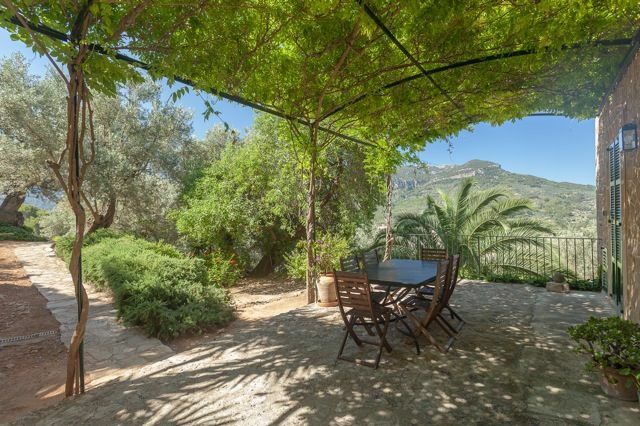 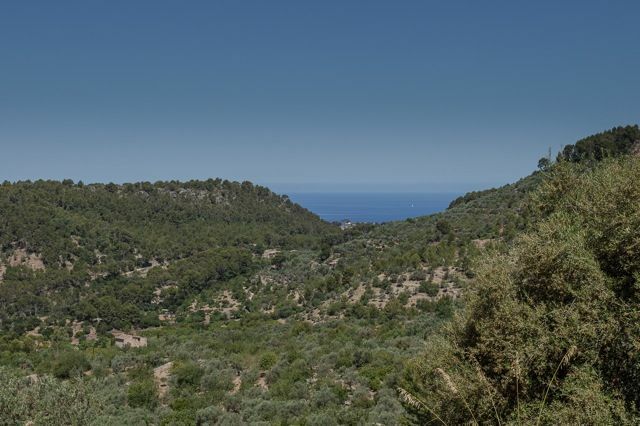 The newly-built, exclusive property perched on Calvario Mountain in Pollença boasts spectacular panoramic views of Pollença and the Monastery on Puig de Maria. 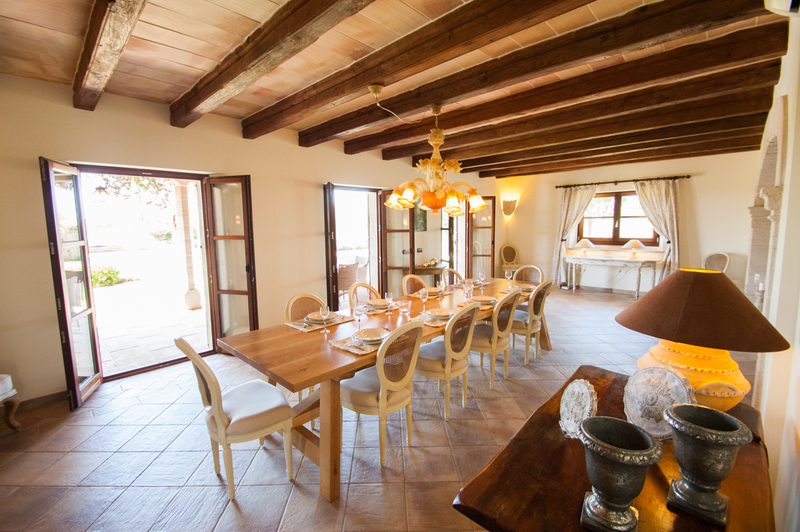 It is a rare gem for discerning guests. 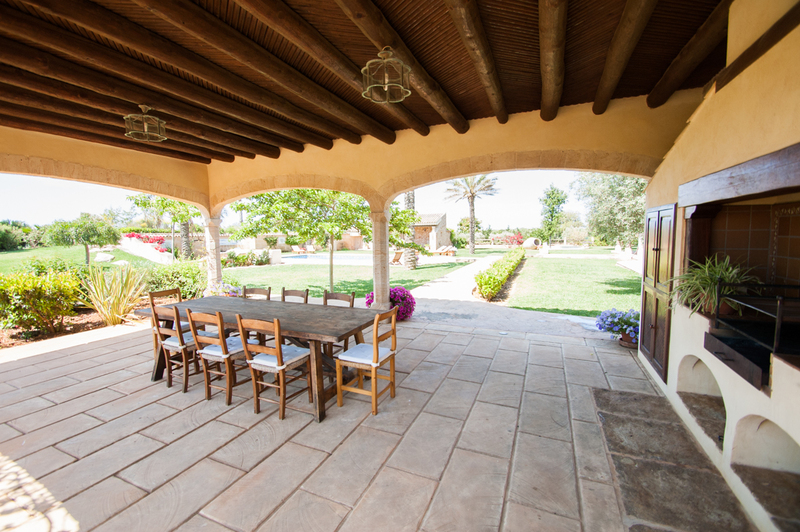 The beautiful, spacious covered terrace with various seating options invites to relax and to enjoy al fresco meals. 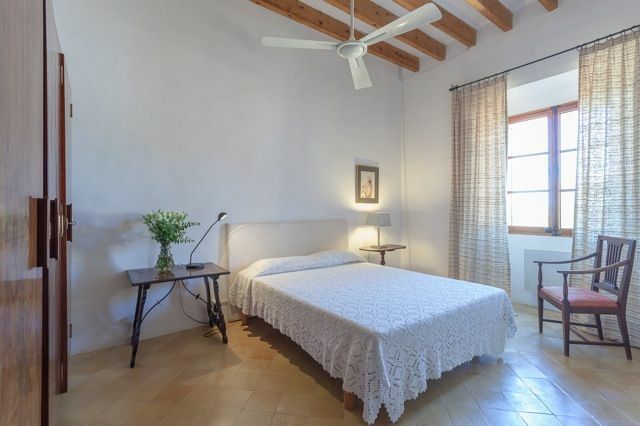 Ideal for guests, who like to abandon the car once in a while, as the historic market square, numerous restaurants and cafés are all within easy walking distance. 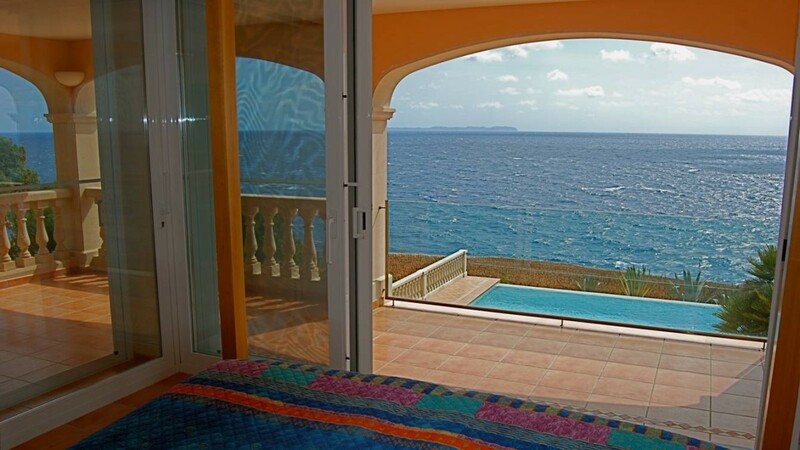 From the terrace revel in sweeping views over the beautifully landscaped Mediterranean garden to the deep blue sea. 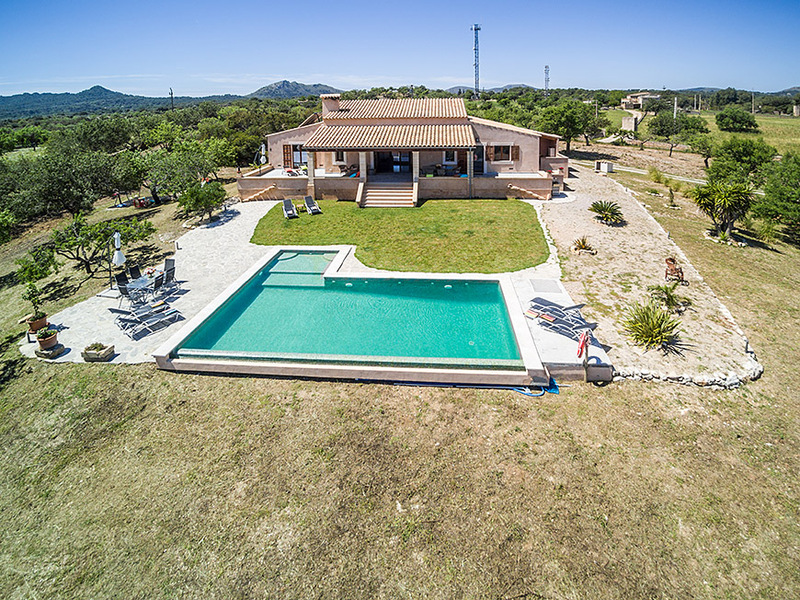 The salt water swimming pool is connected tot he solar energy system and can thus be used almost all year round. 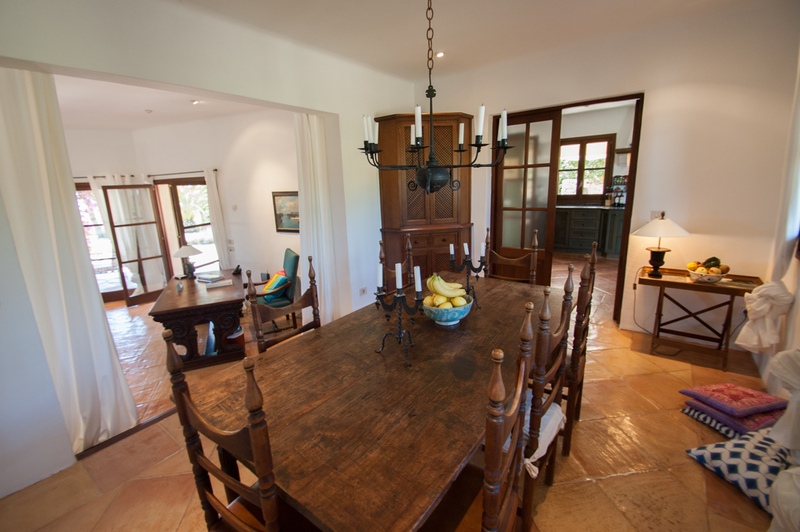 The ceiling height in the living and dining room is about 6 metres and creates a very luxurious, special ambiance. 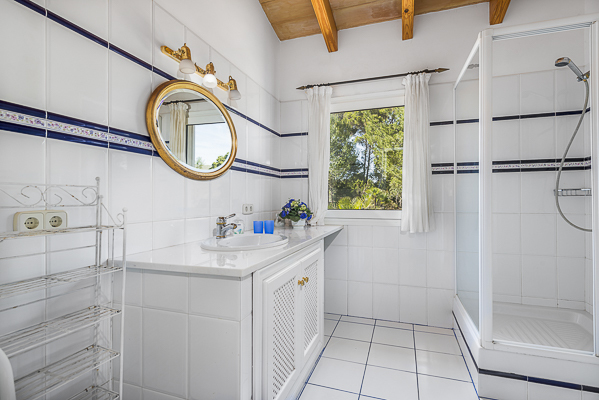 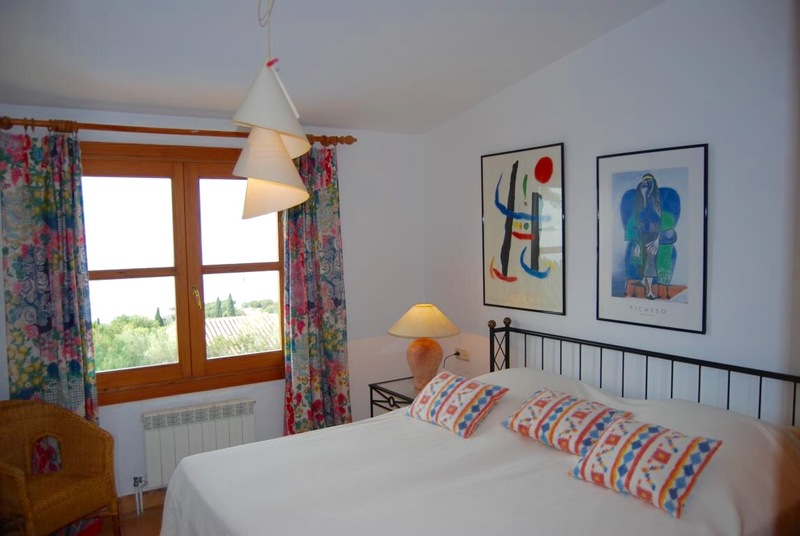 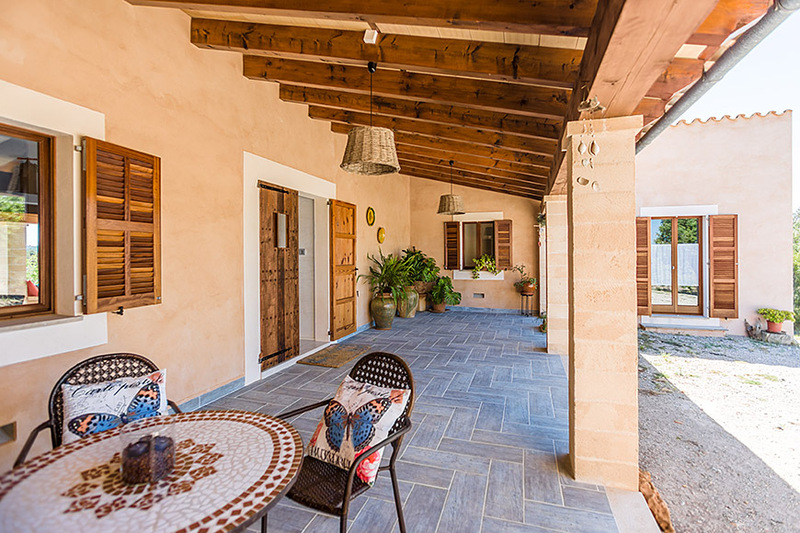 The holiday home is a true little gem, if you seek for comfort and total relaxation. 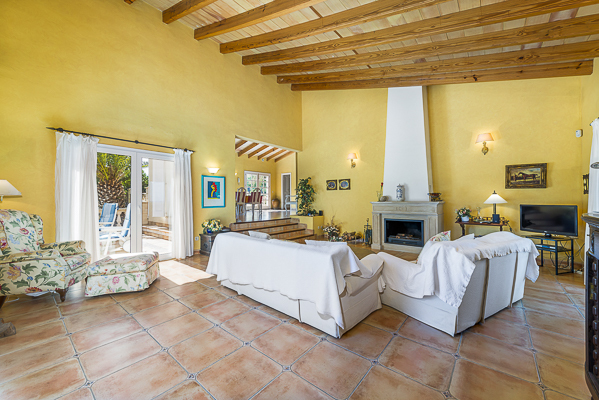 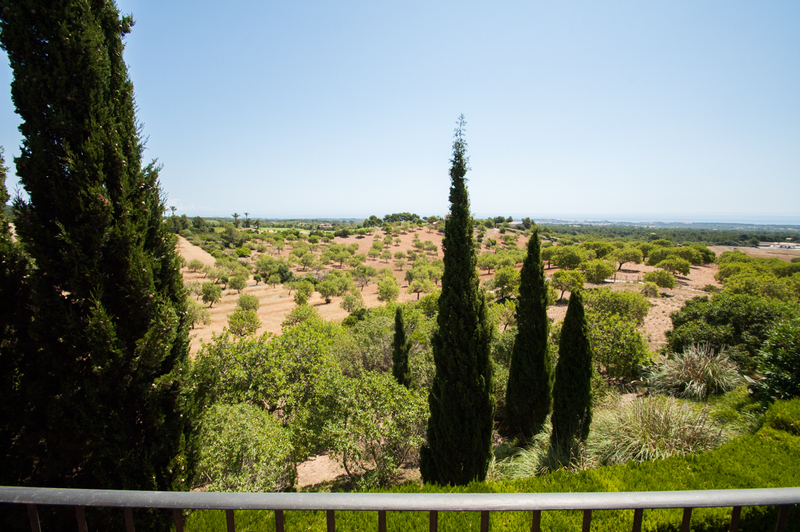 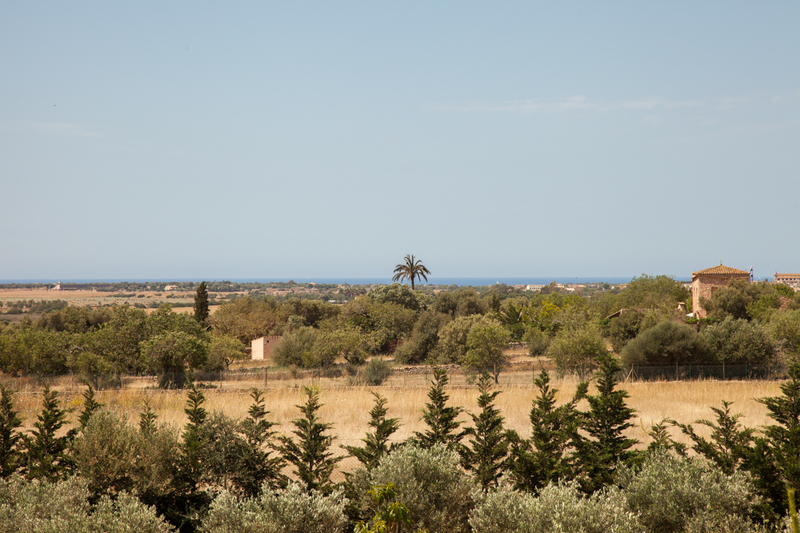 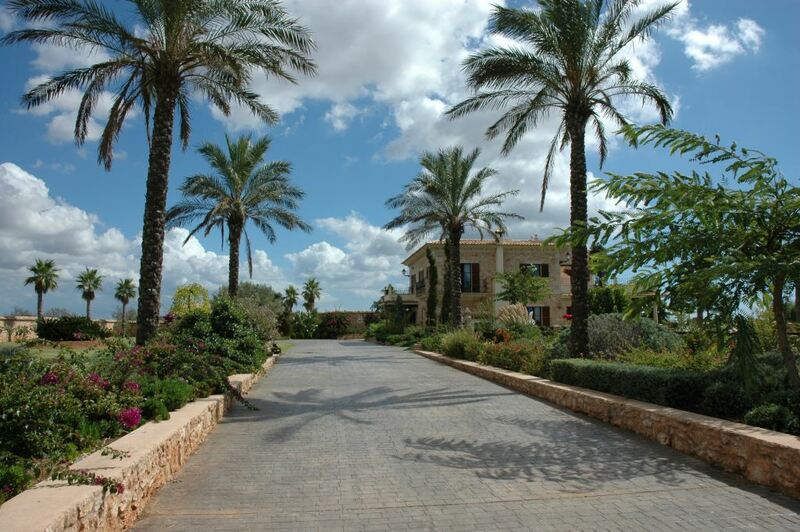 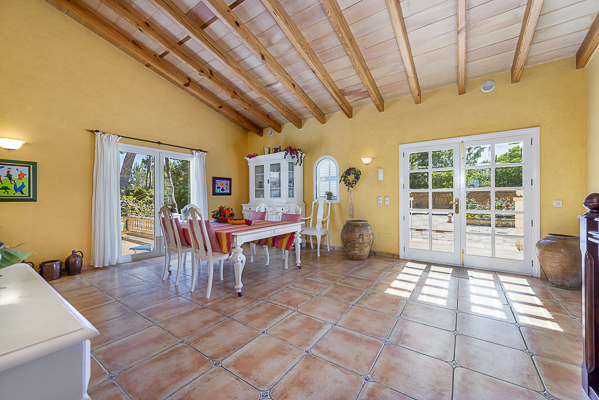 The Finca lies proudly amidst its 60.000 m² property, 50.000 m² of which are orange and lemon orchards. 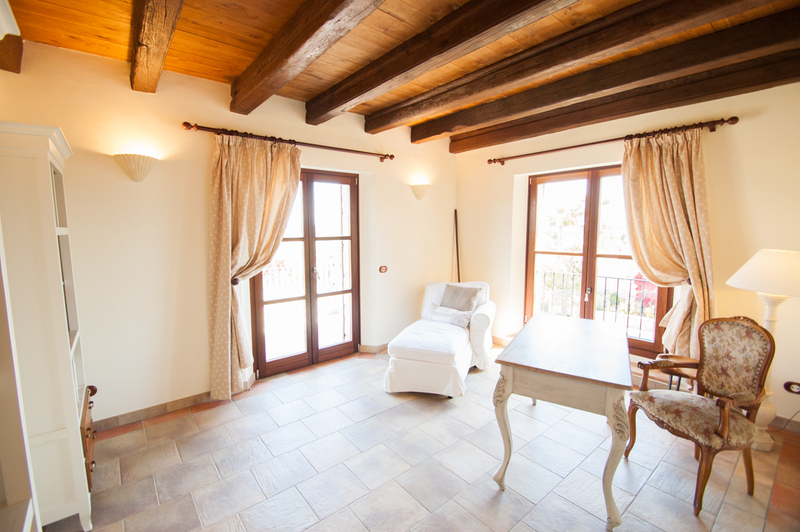 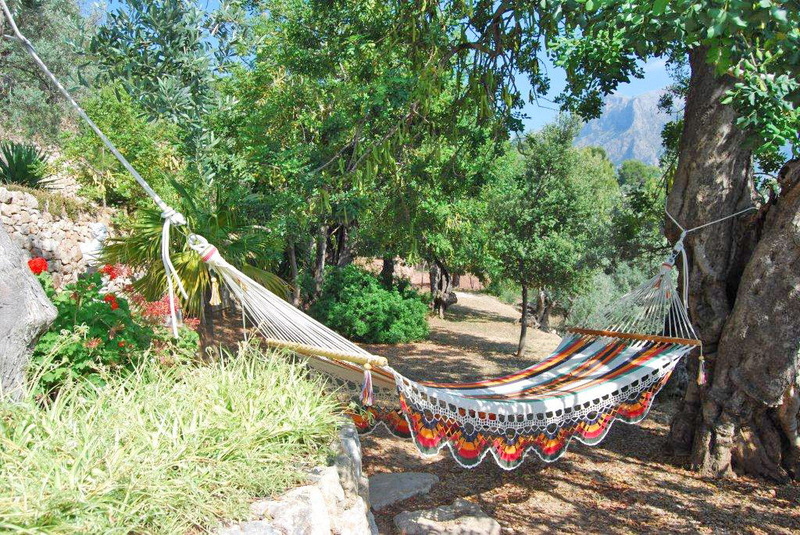 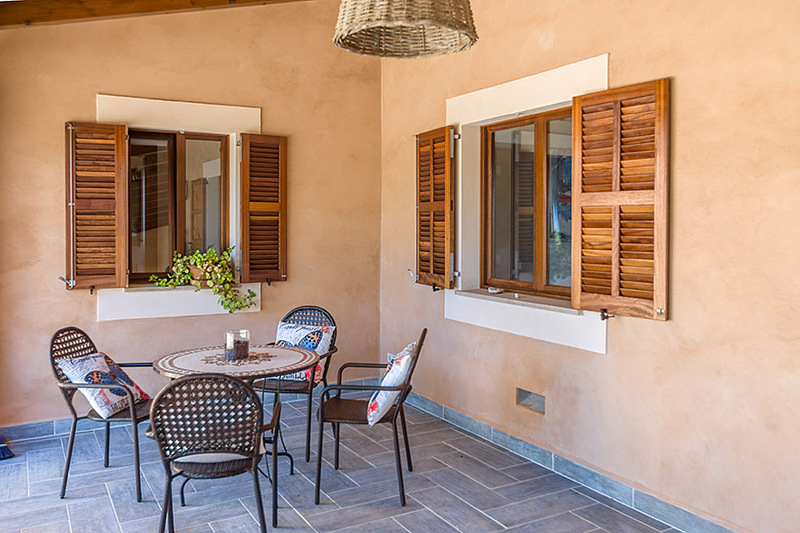 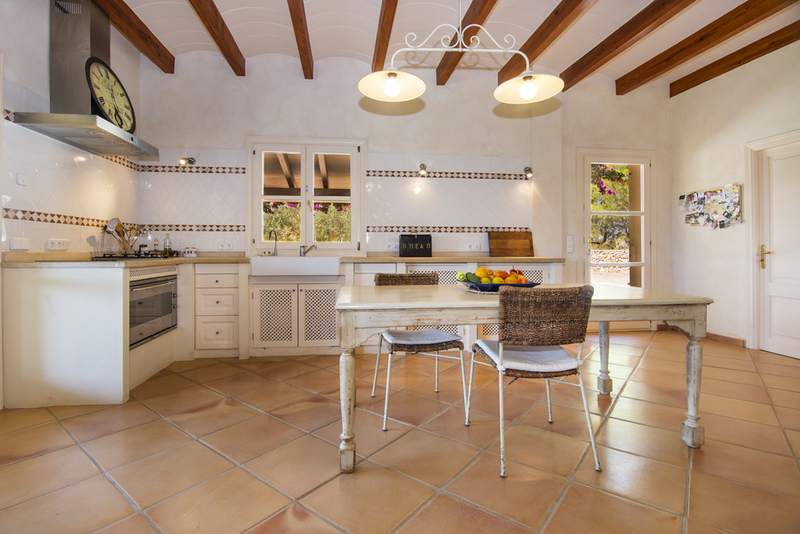 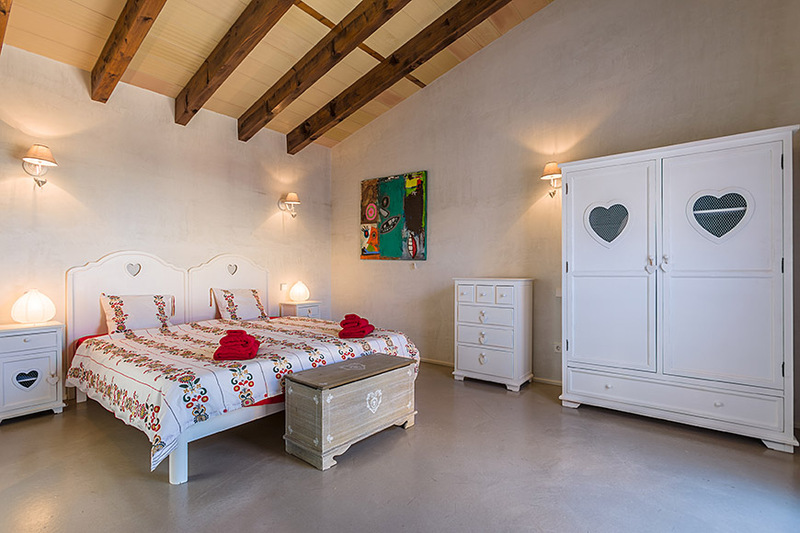 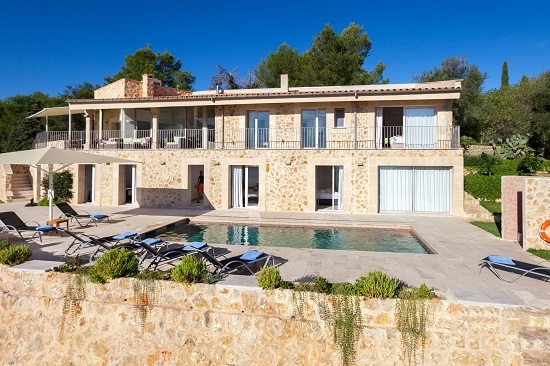 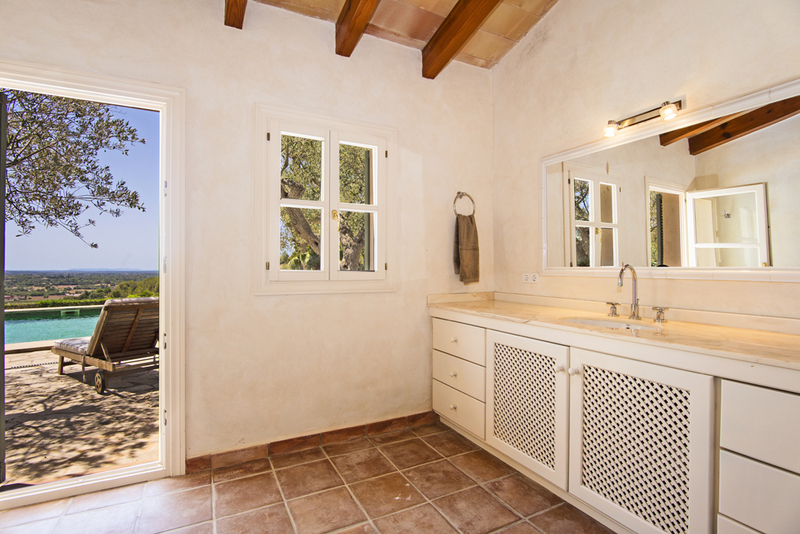 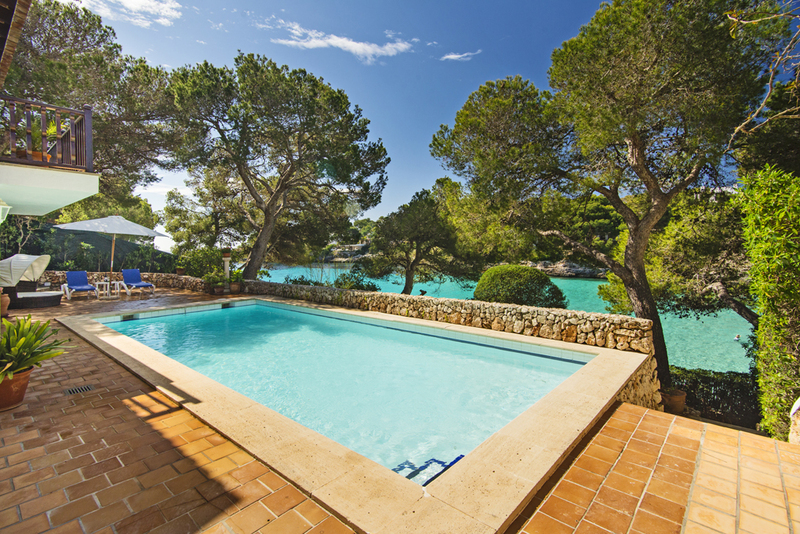 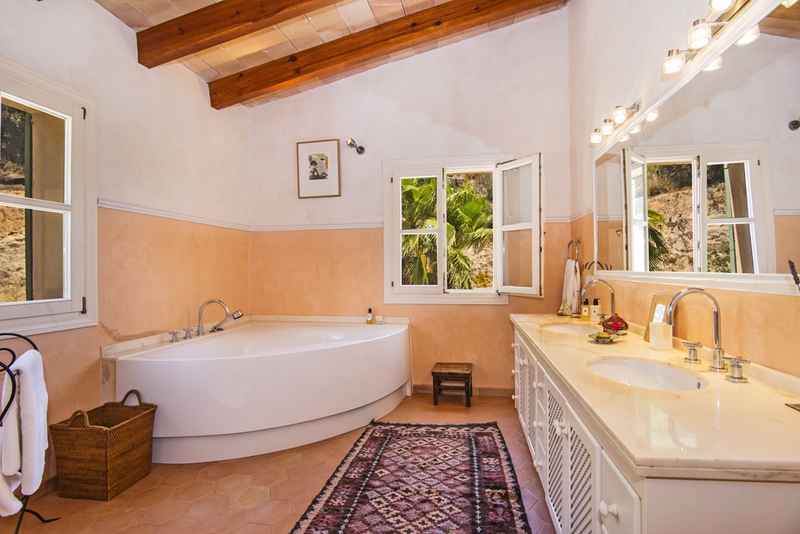 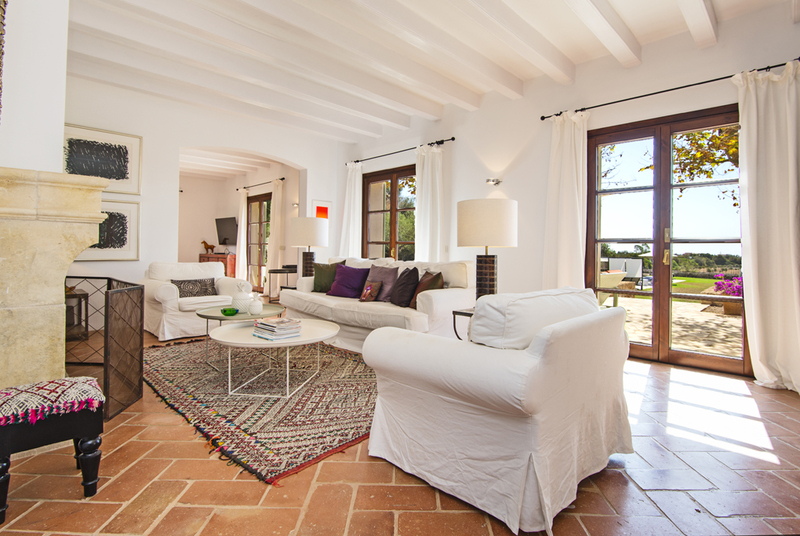 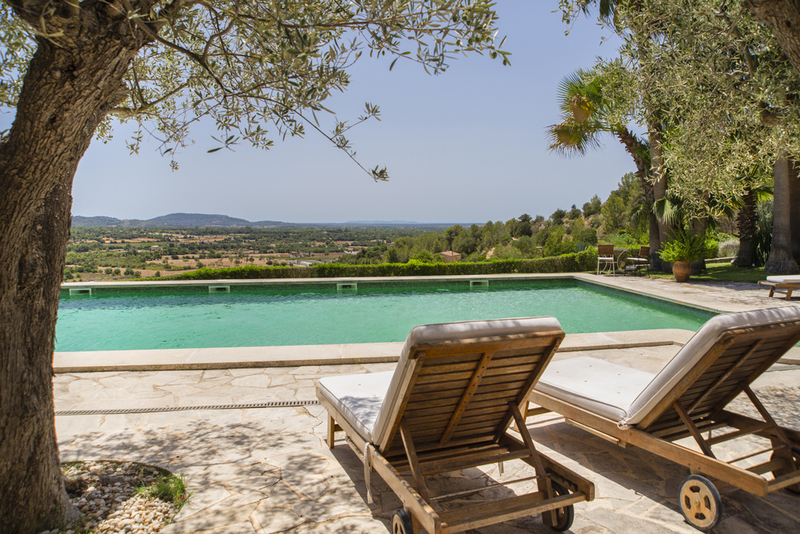 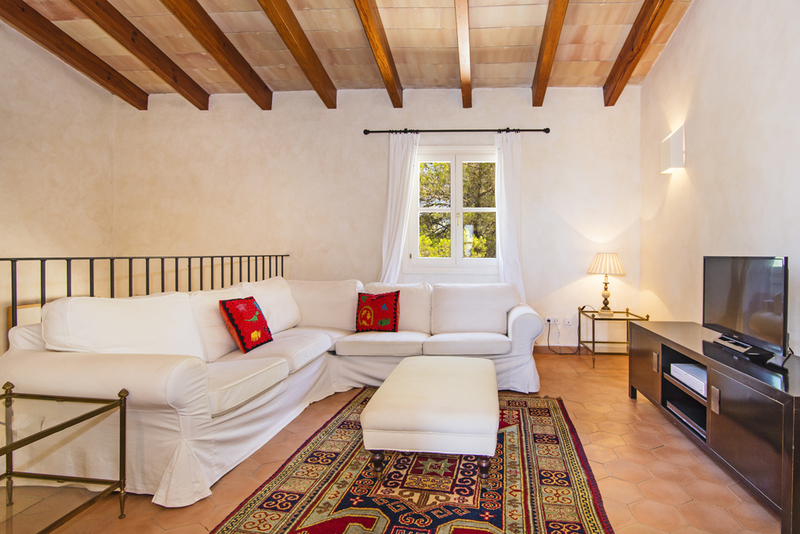 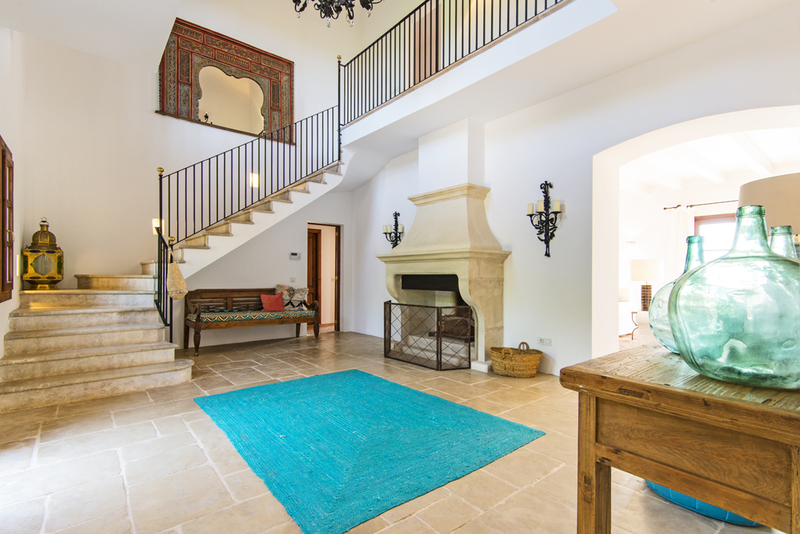 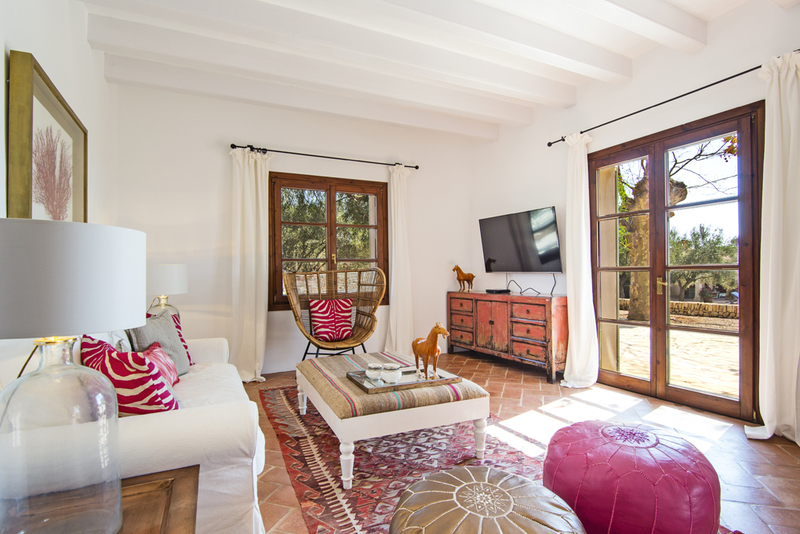 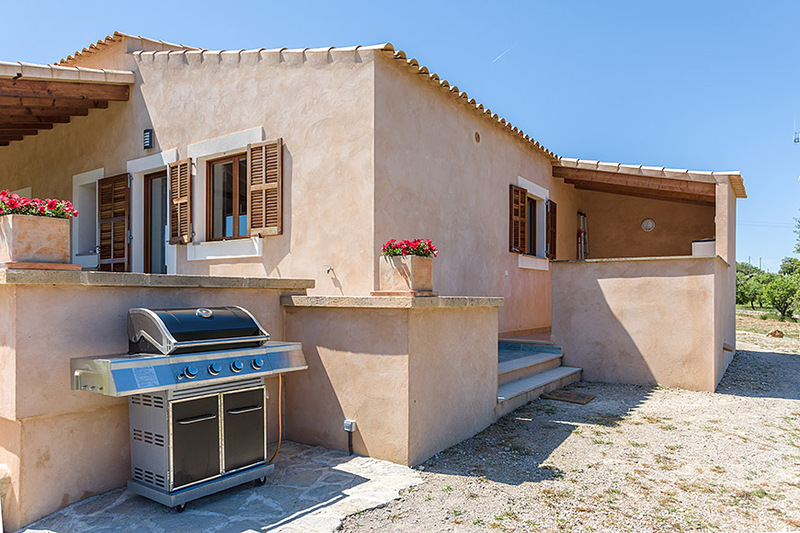 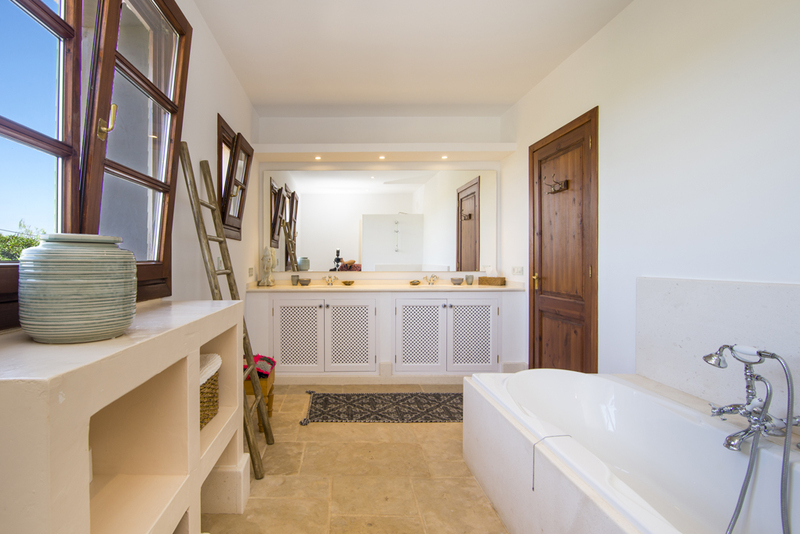 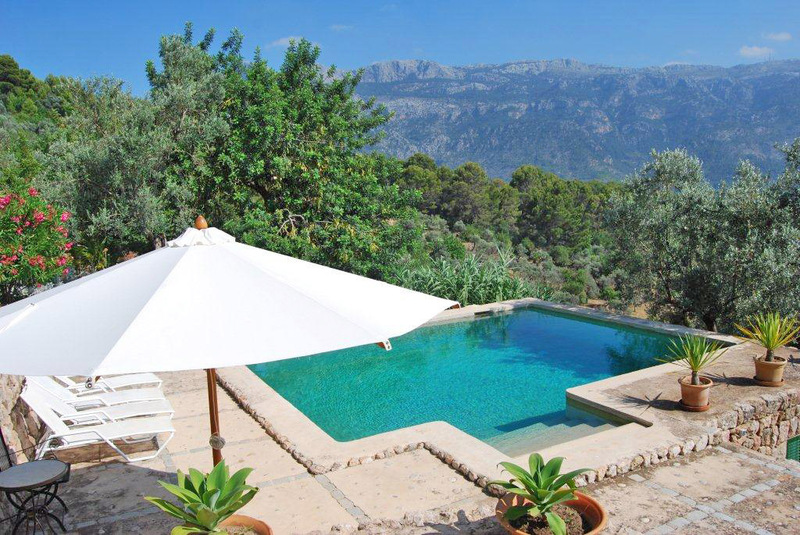 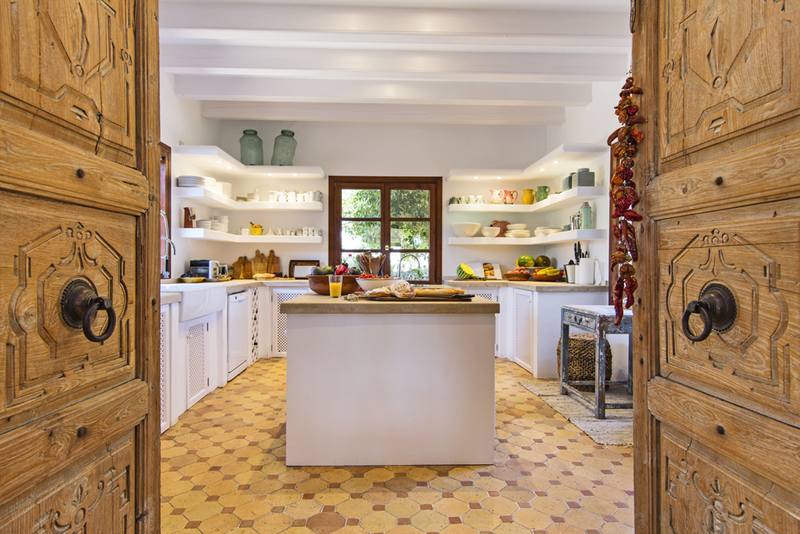 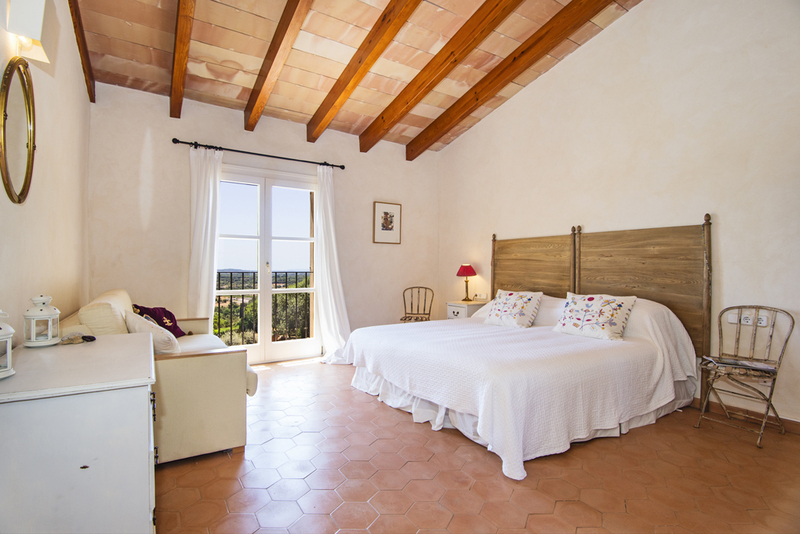 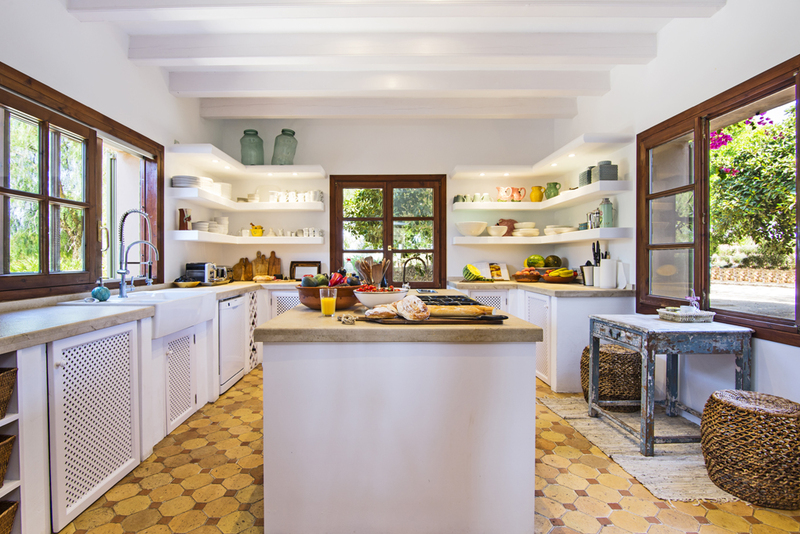 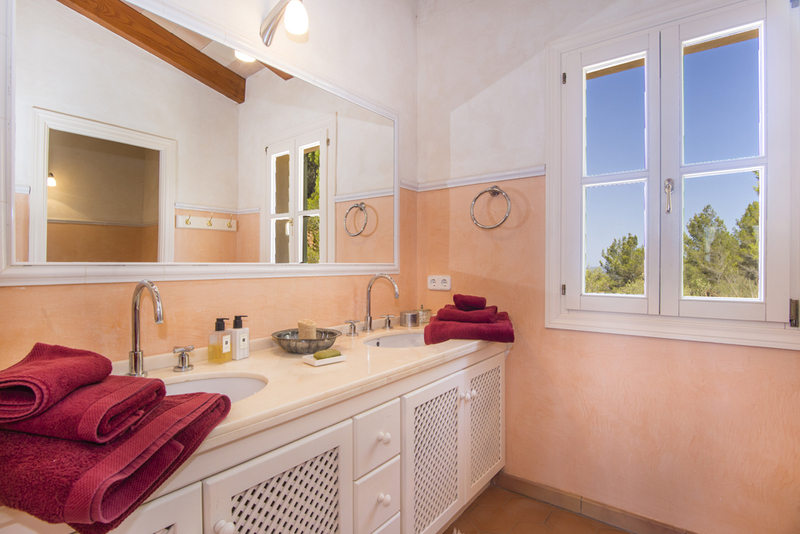 The Majorcan country home combines modern comfort and appliances with the charming ambience of authentic Mediterranean lifestyle. 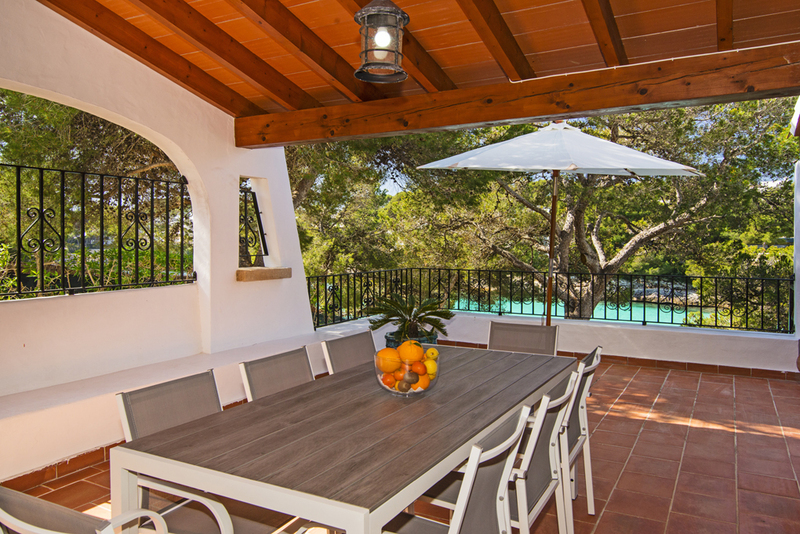 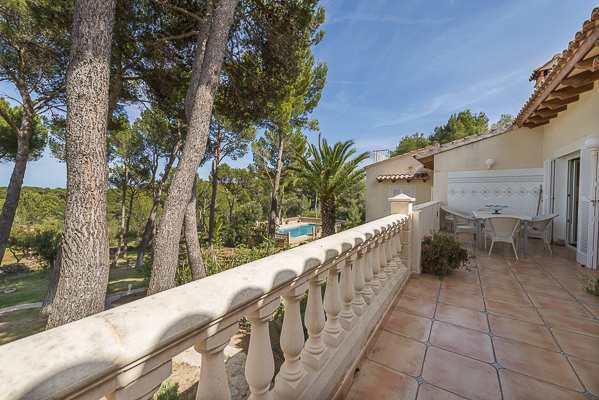 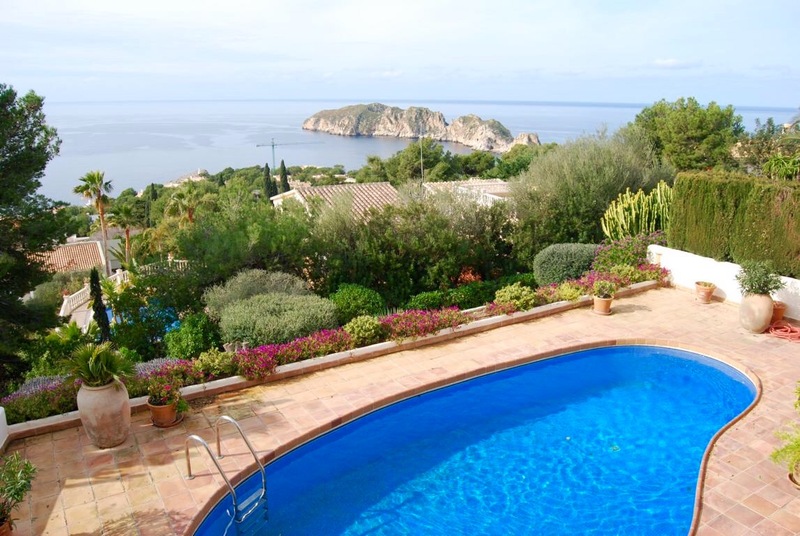 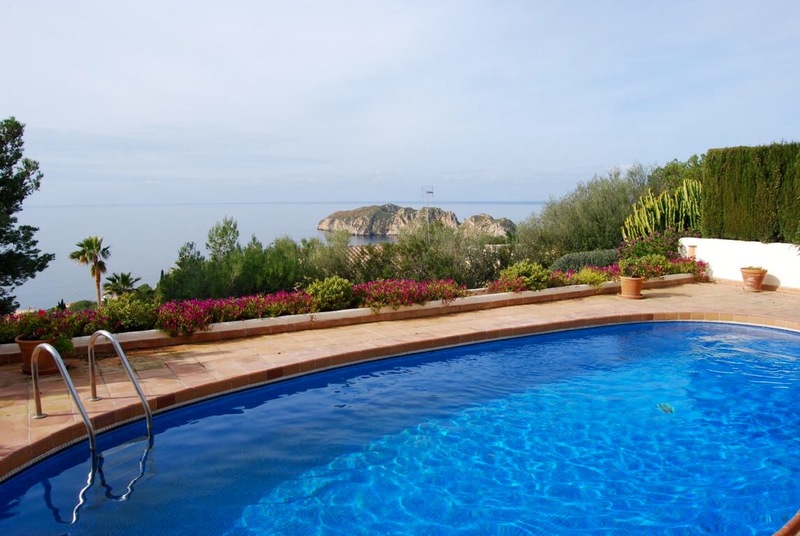 This lovely villa is situated in a private street in the urbanization of Cala Santanyi directly at the sea, which offers wonderful views over the open sea and the well-known rock “Es Pontas”. 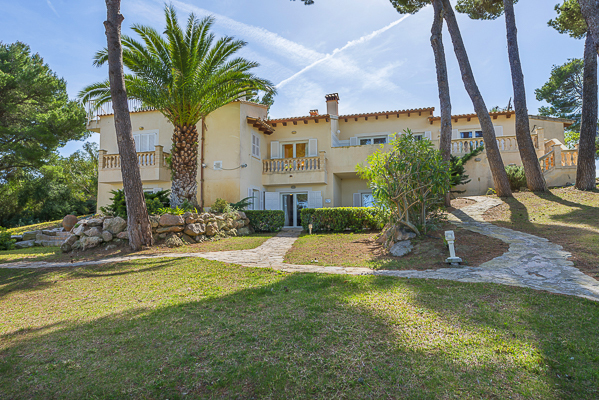 The independent villa will be totally reformed over the winter and the reformation should been finished at the middle/end of April 2018. 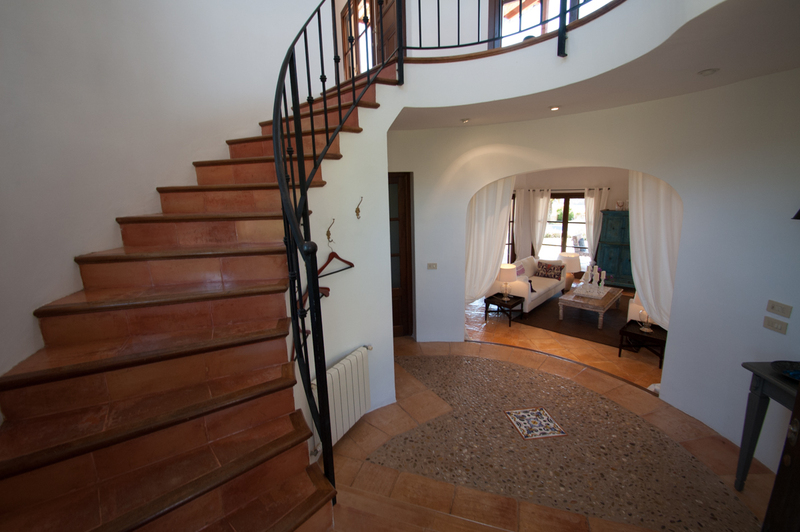 The house has been divided over 2 floors. 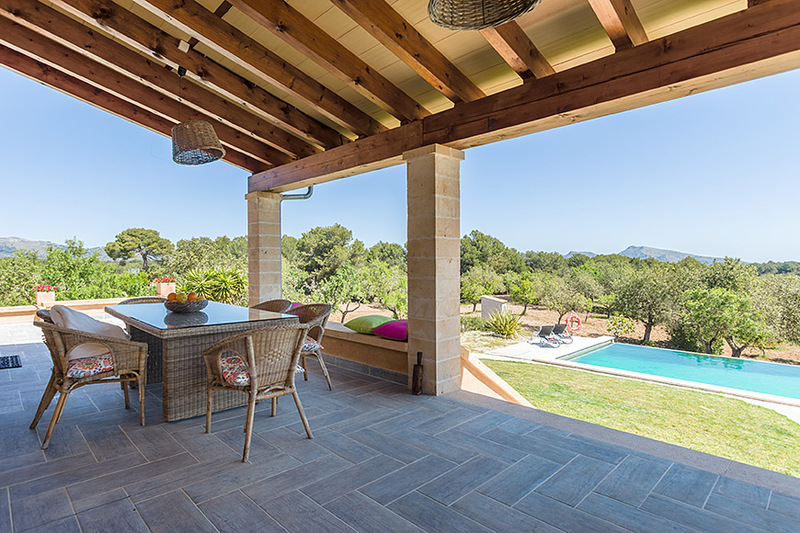 The kitchen on the ground floor will be extend and there will be a dining area with access to the covered terrace and the garden and pool area. 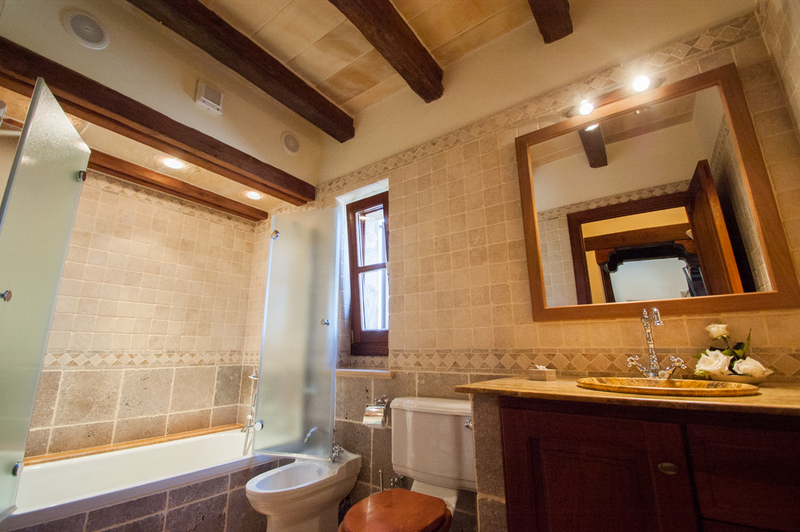 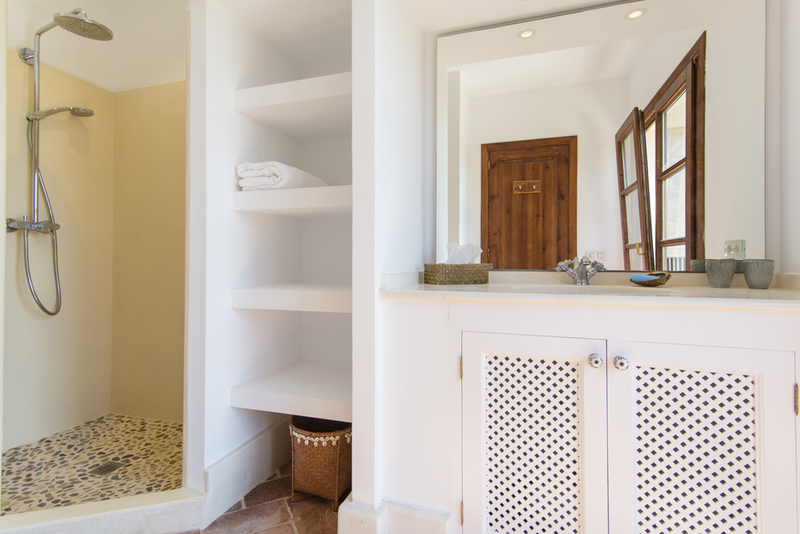 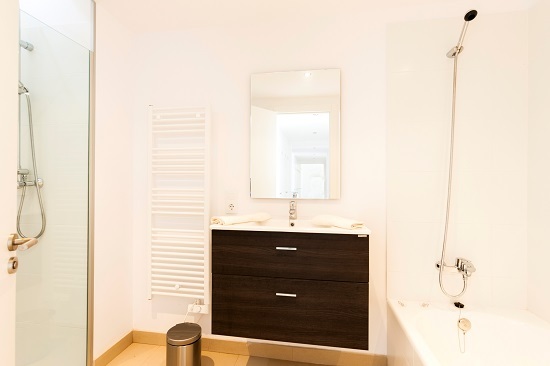 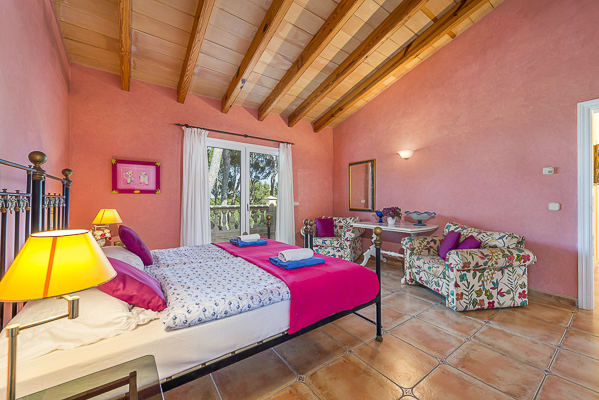 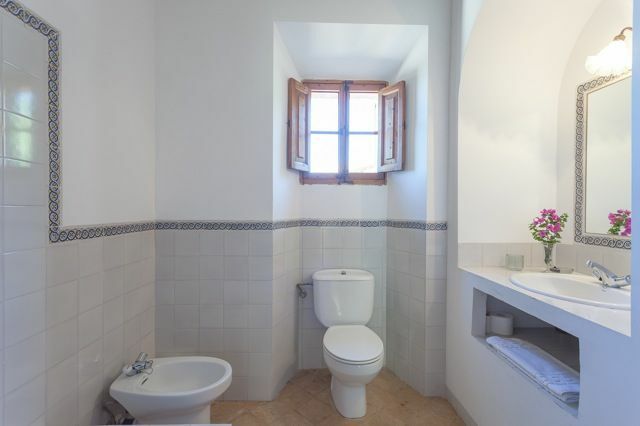 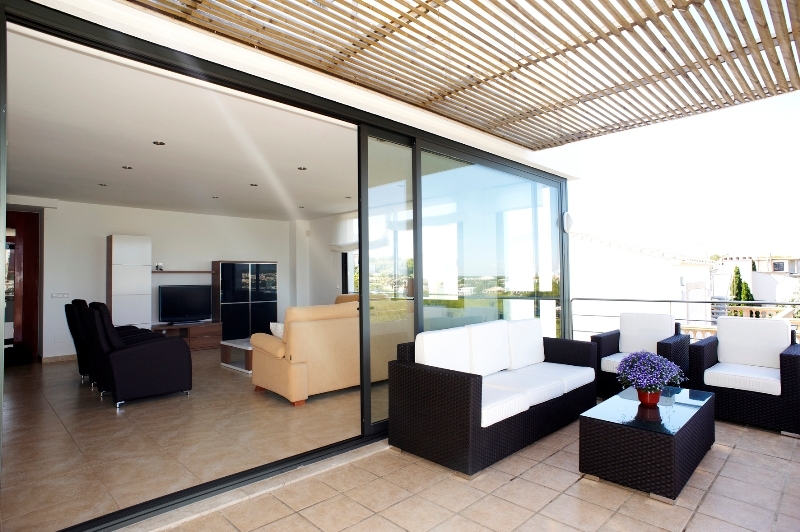 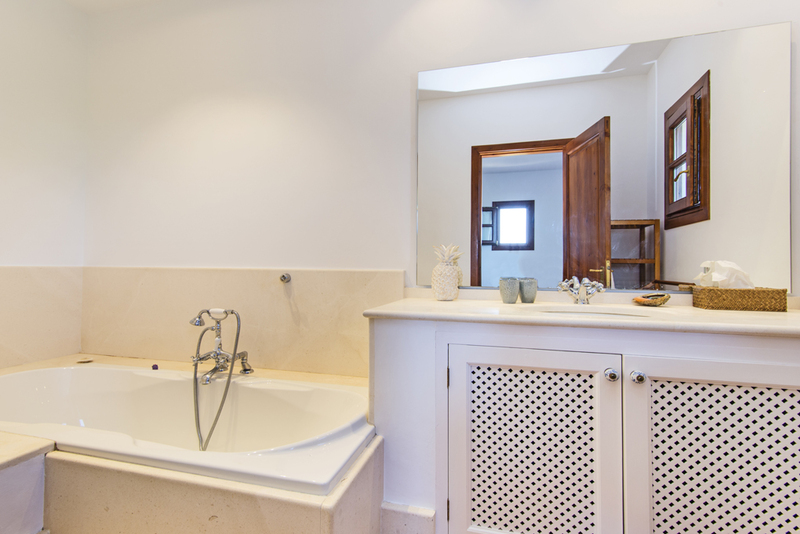 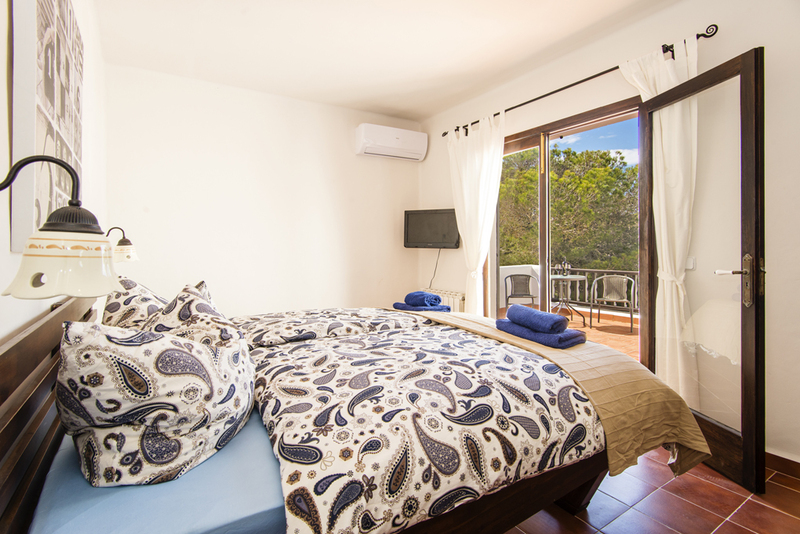 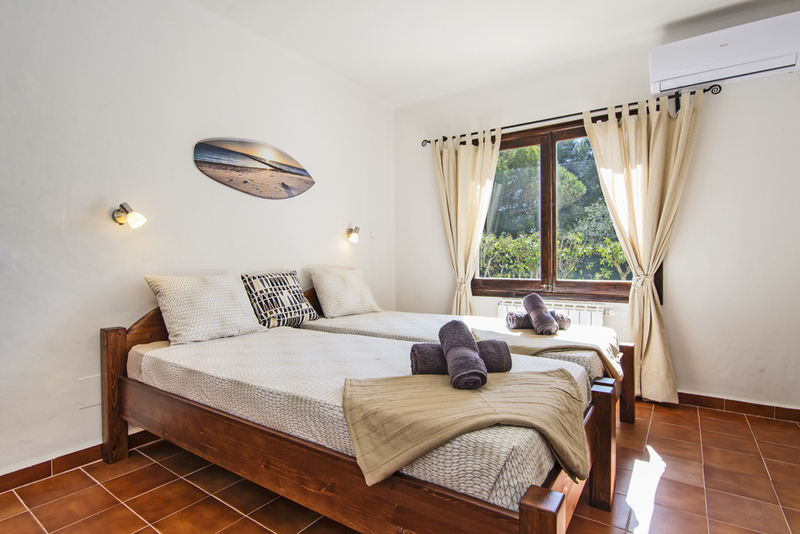 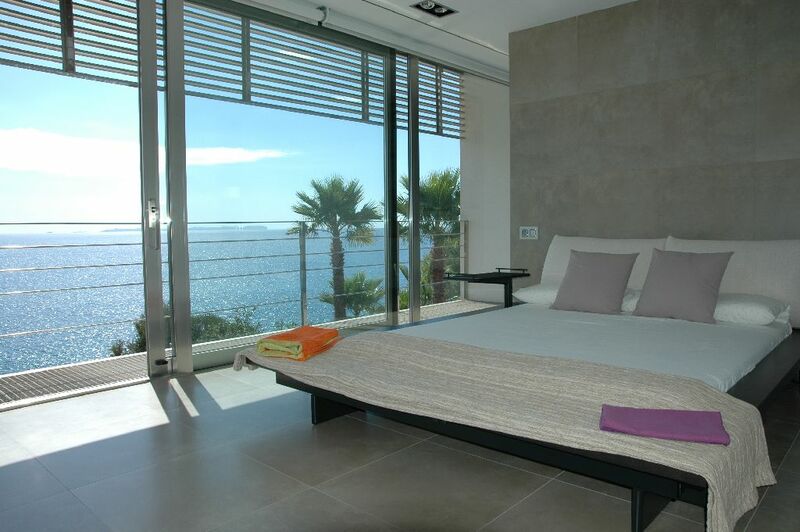 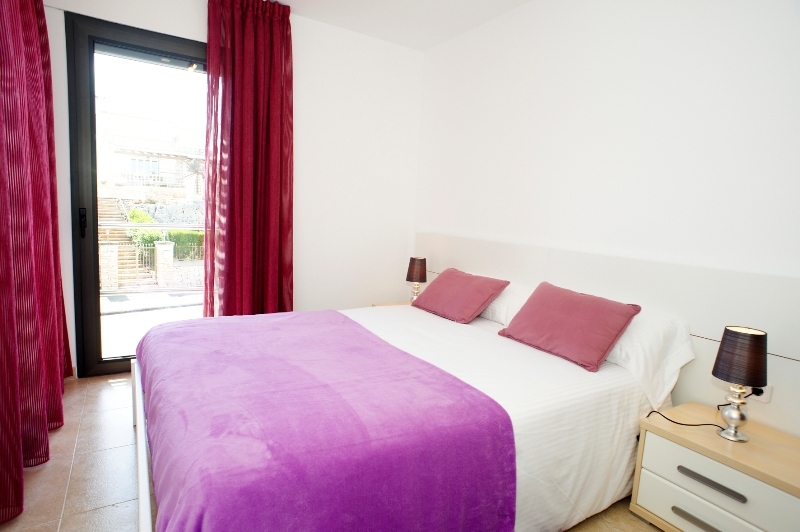 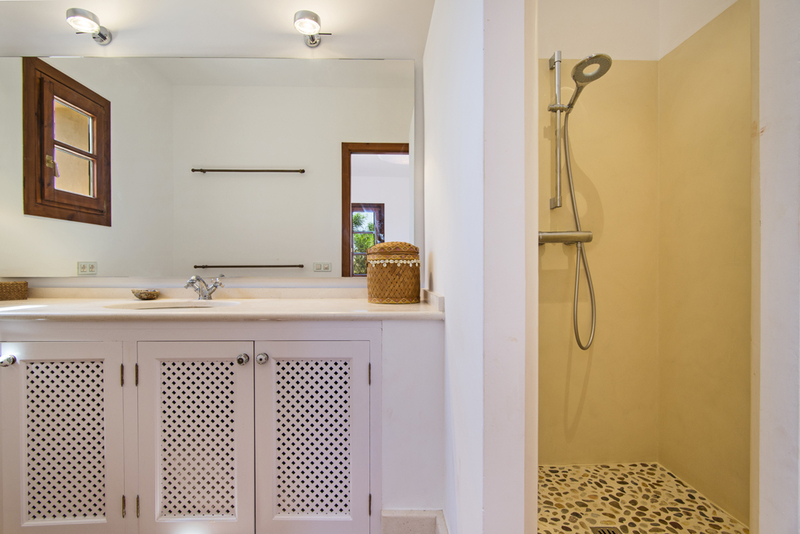 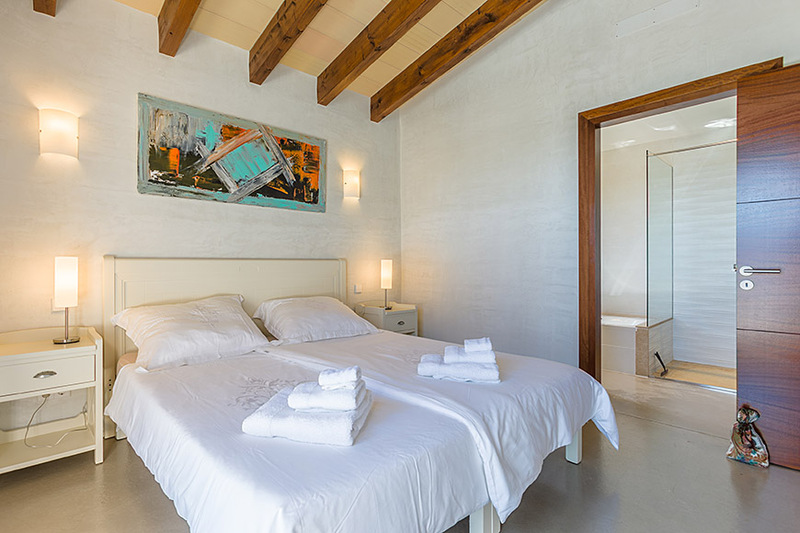 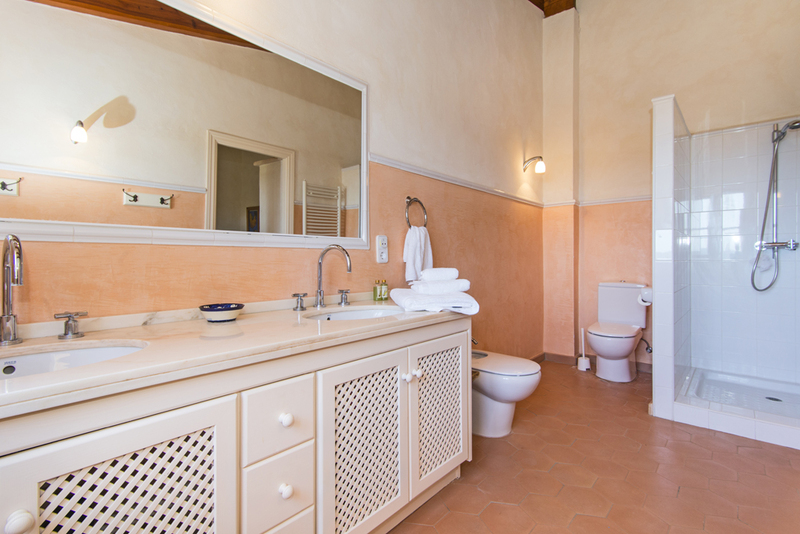 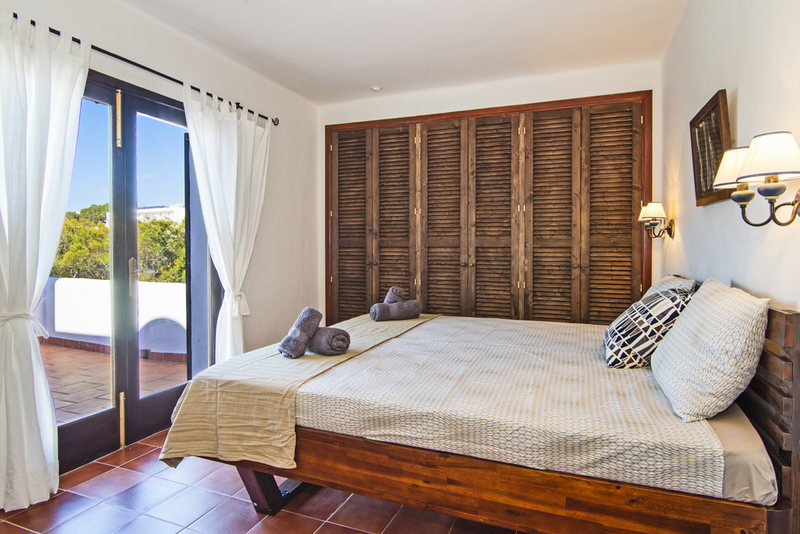 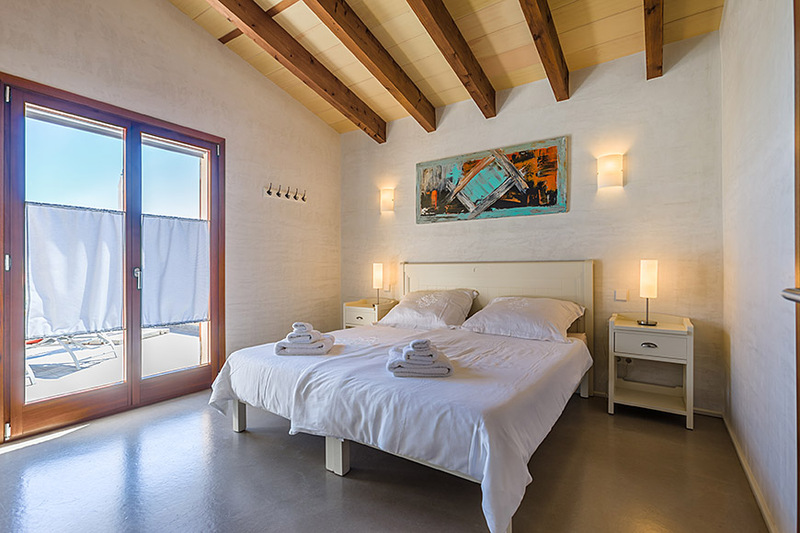 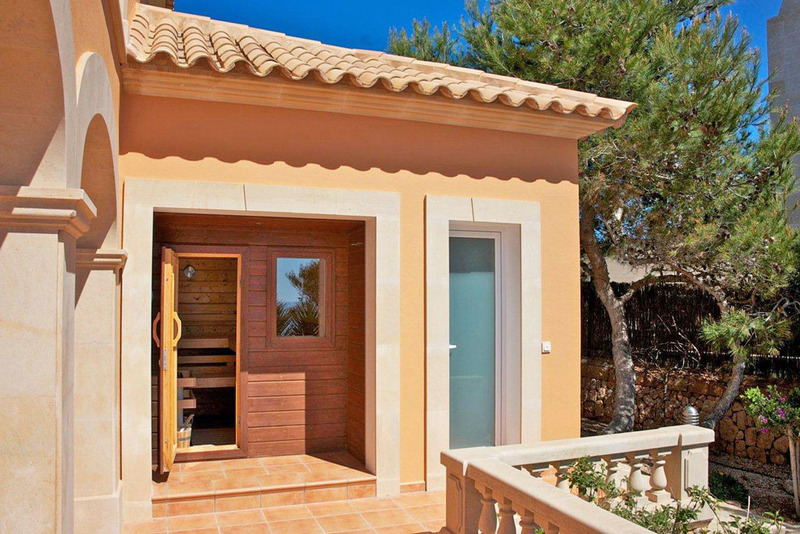 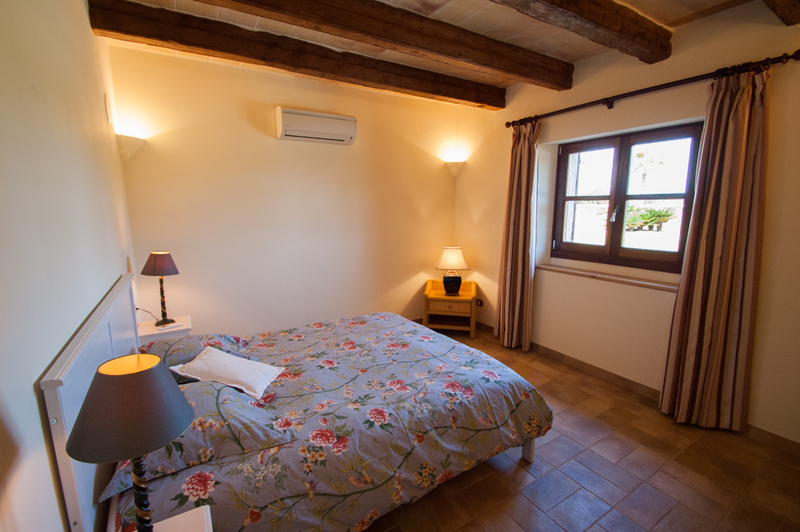 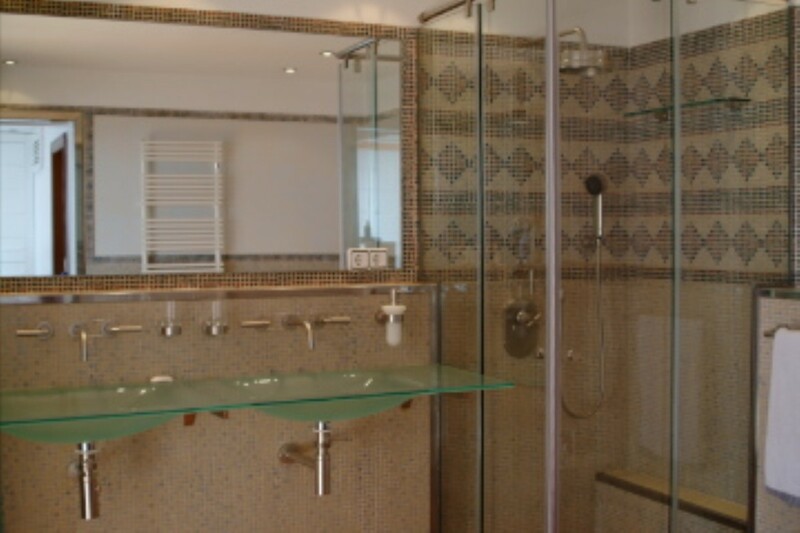 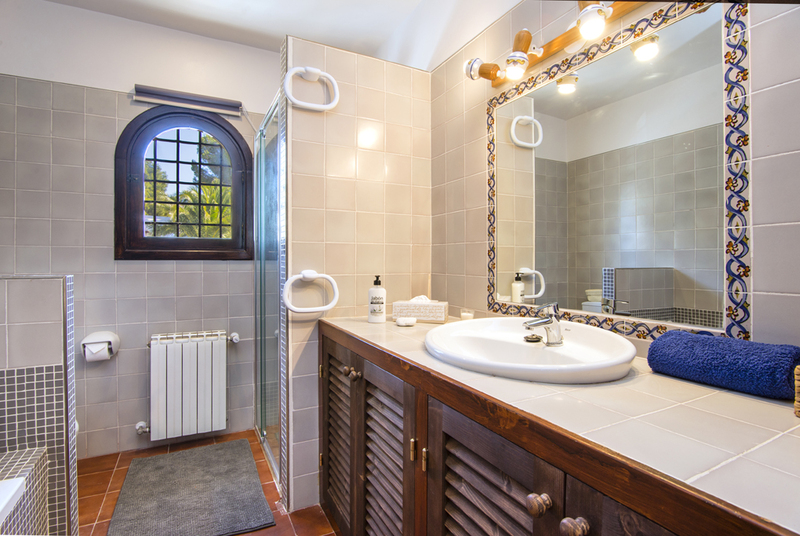 Two of the bedrooms with private bathroom, terrace and sea view are situated at the same floor. 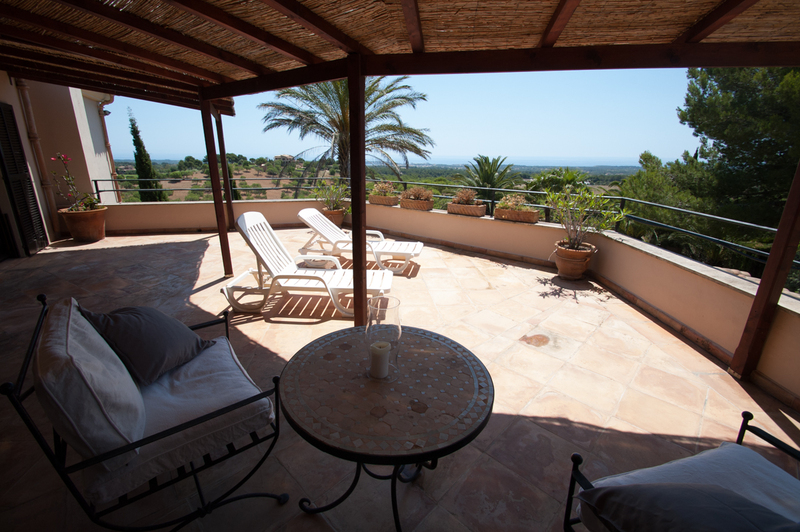 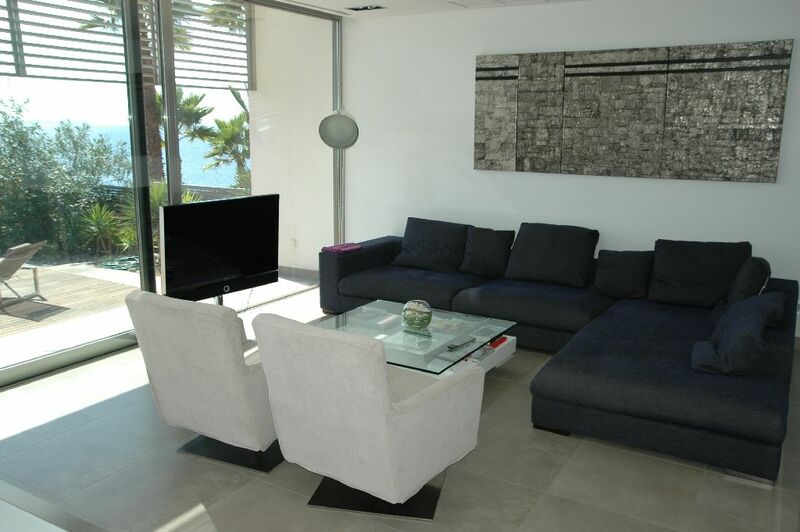 The other 2 bedrooms are on the first floor, as well as the living area with a stunning sea view. 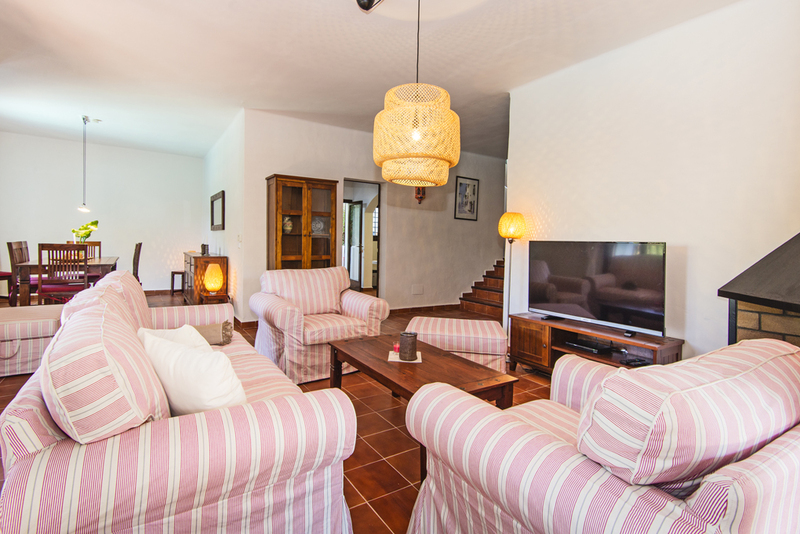 The villa will be completely new furnished. 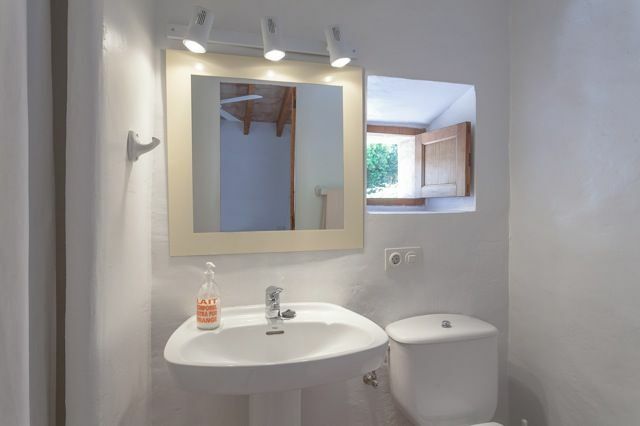 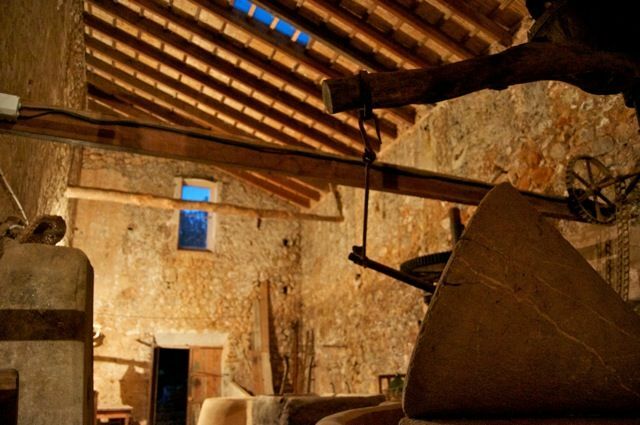 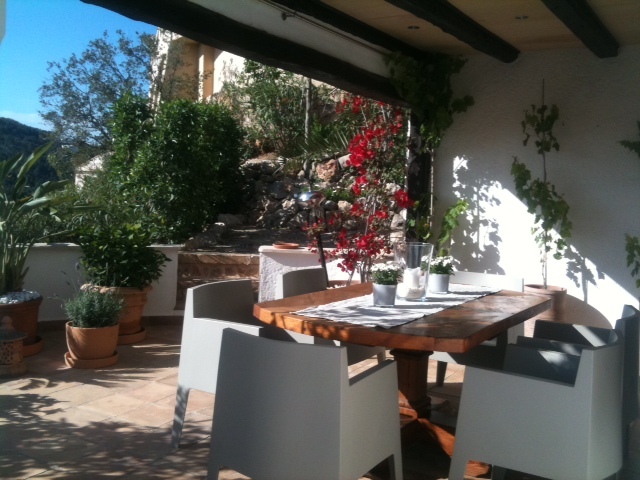 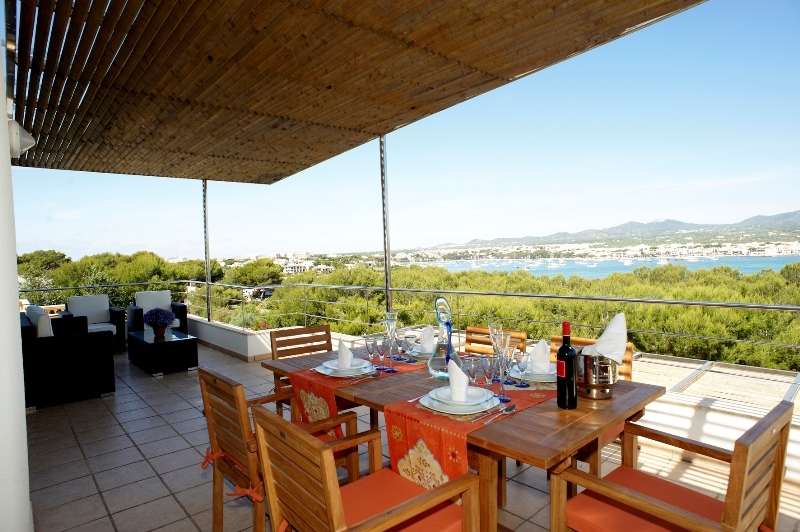 Just a 2-minute drive from Ses Salines with its numerous restaurants, cafés and bars. 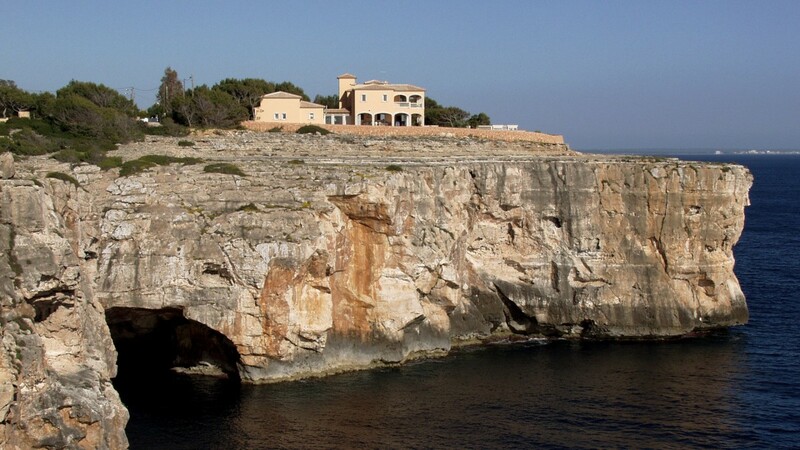 The port of Colonia de Sant Jordi can be reached in about 8 minutes by car. 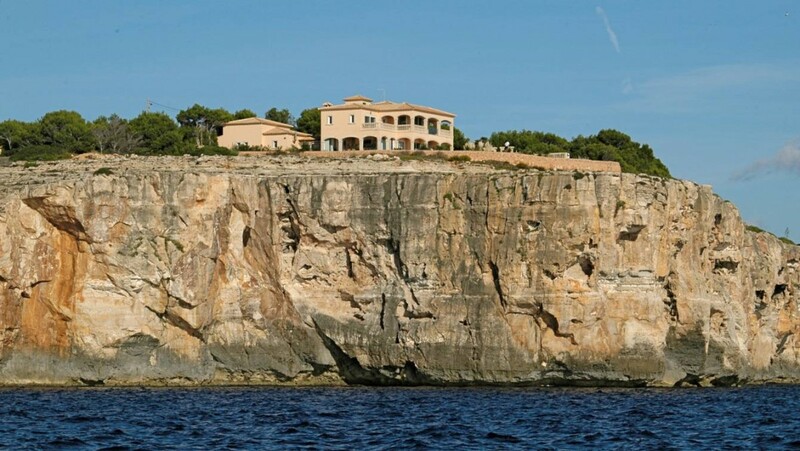 The island capital of Palma and the historic old town are about 40 minutes away. 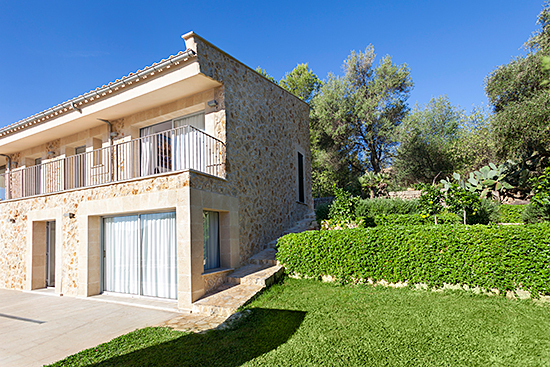 The villa was built for families with small children. 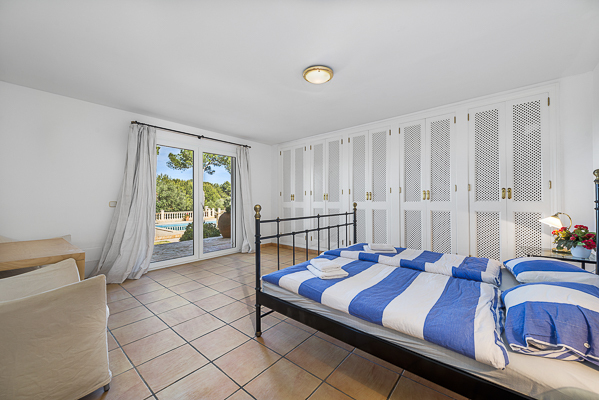 One of the two master bedrooms upstairs features an adjacent children´s rooms instead of a walk-in wardrobe and there is another smaller bedroom for older children. 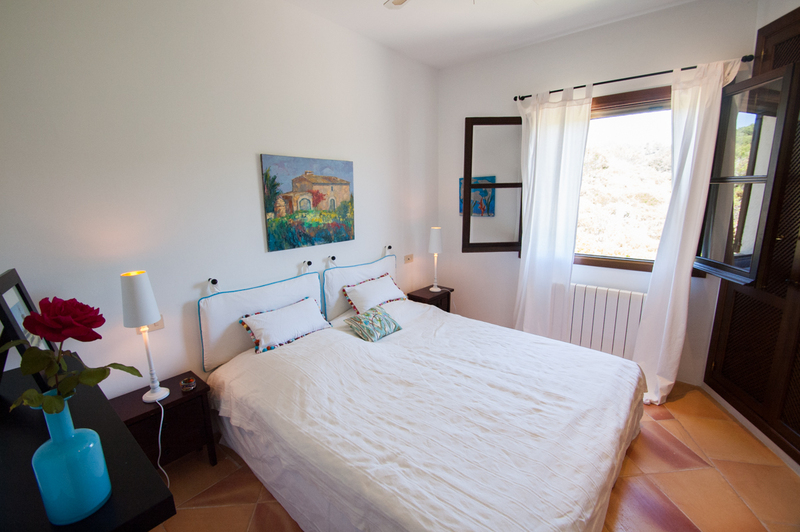 Upstairs there are 3 large bedrooms, one of which is equipped with double beds for children and has no own bathroom. 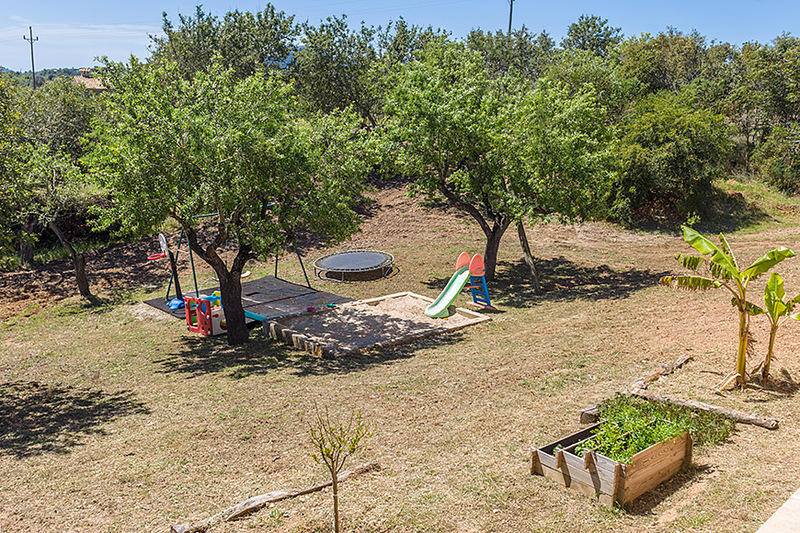 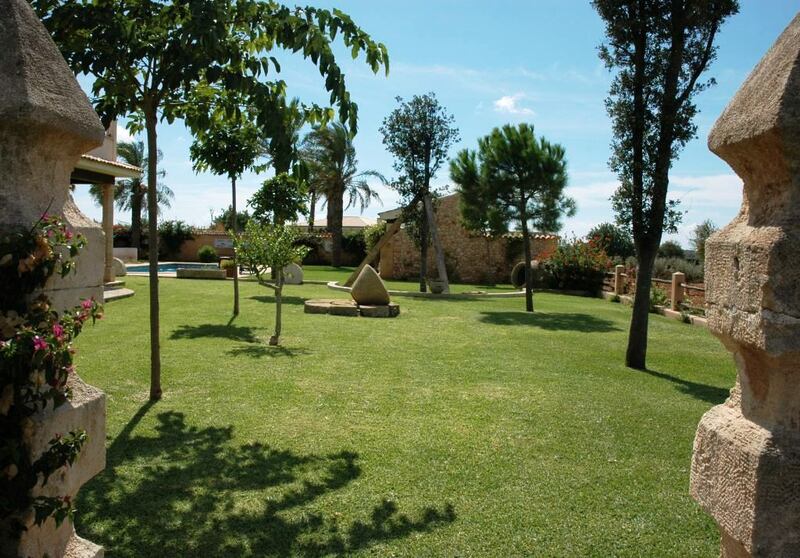 Outdoors, ample lawn areas of ca 5.000m² await the children to run and play.